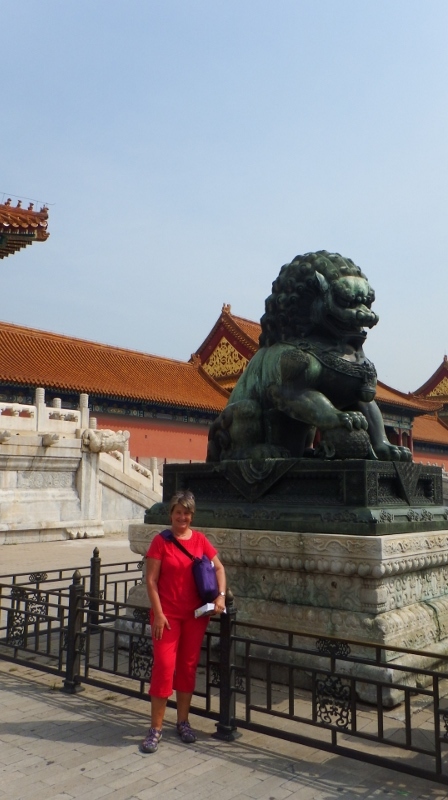 Tuesday 8th September was our last day in Beijing and we intended to spend it in the forbidden city. 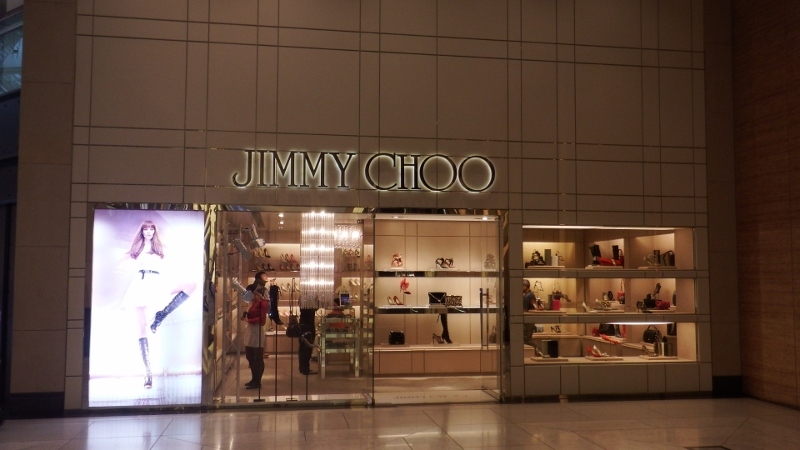 First we checked out of our hotel and put our bags in their baggage store. 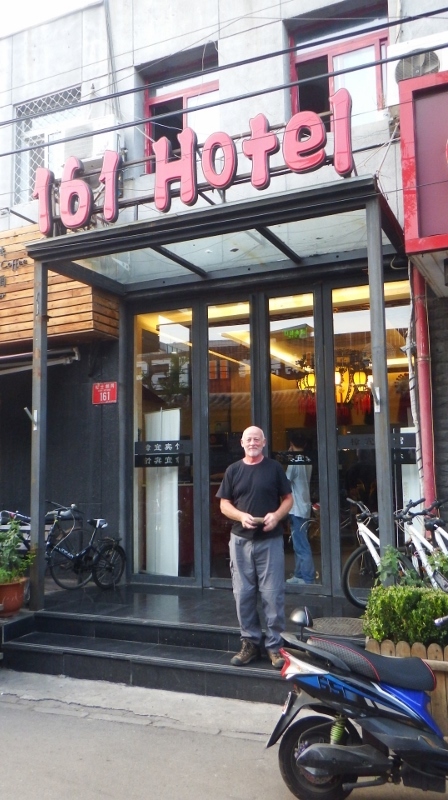 I had found 161 Hotel on www.bookings.com and had been pleased with it. The three young girls on the front desk spoke very good English as had the lady on the tour desk. 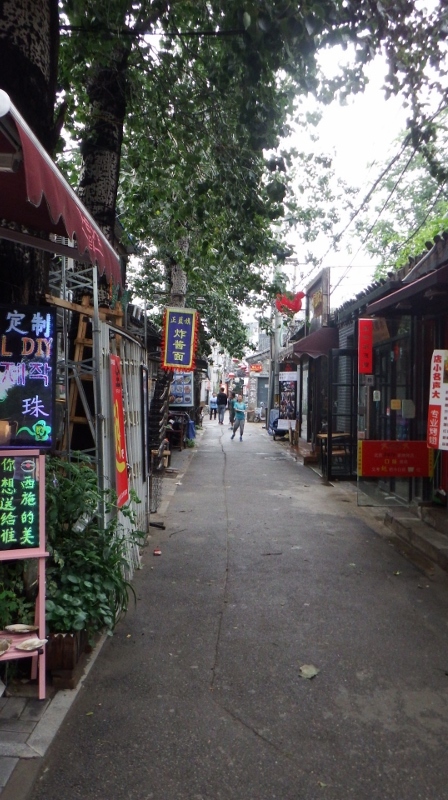 As I’ve said before it was 2 blocks down from the Dongsi metro station and was set in an area that had some nice places to eat. 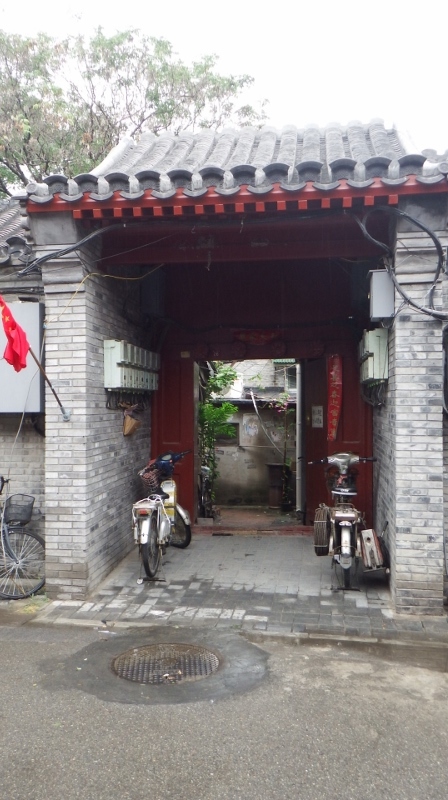 It was set among a hutong area which looked a bit grotty but once inside it was very comfortable. Our room was on the fifth floor without a lift but it was ok because they call the ground floor the first, small flight of stairs to second floor, no fourth floor (Chinese are superstitious of the number 4) so there was only 2½ flights of stairs to climb. Our view wasn’t brilliant, we looked out over the roofs of the adjoining buildings, but the room had only cost us the equivalent of £154 for 4 nights which we felt was good value and we had only been there in the evenings. The bed was a bit firm but the bathroom was clean. I would stay there again and would recommend it to others. On the ground floor was a lovely little coffee shop which sold sandwiches, cakes and breakfast pastries as well as very good coffee. 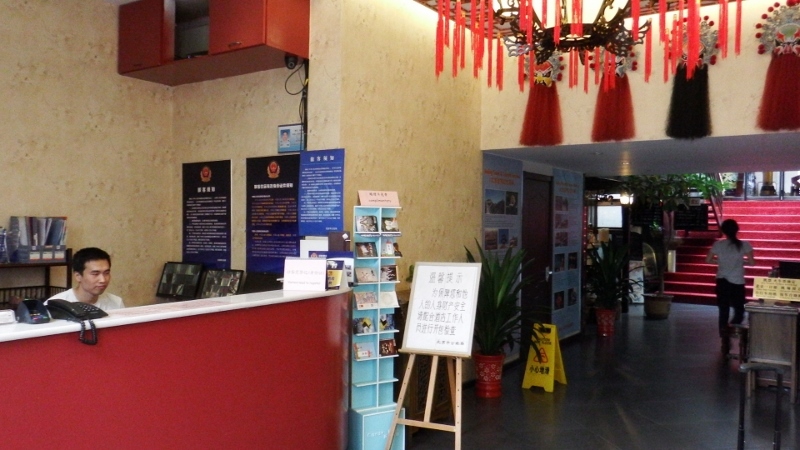 This photo shows the reception desk with the tour desk on the right and the coffee shop tucked away on the left with the first flight of stairs to the second floor beyond. This was looking into the road from the main rood and the 161hotel is about 4 doors in on the left. 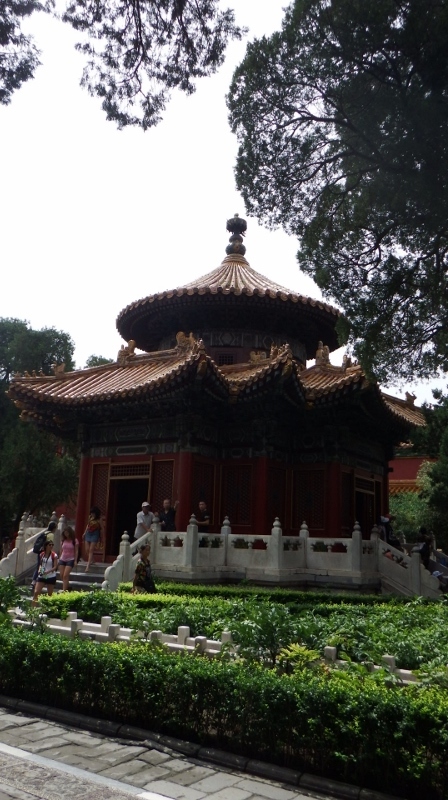 Although the hotel is within walking distance of the Forbidden city we took the Metro to save time. 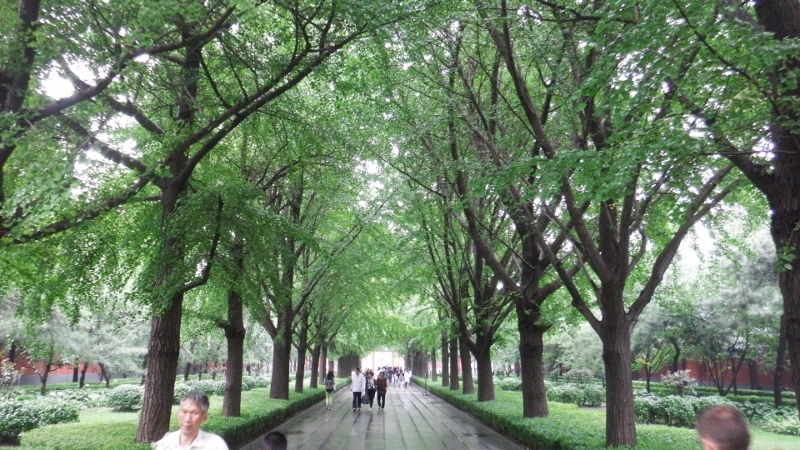 Tian’an Men Guangghang – the Square of the Gate of Heavenly Peace- is a vast open concrete expanse at the heart of modern Beijing. It’s bordered by 1950s Communist-style buildings. The square has traditionally served as a stage for popular demonstrations and is most indelibly associated with the student protest of 1989 and its gory outcome. 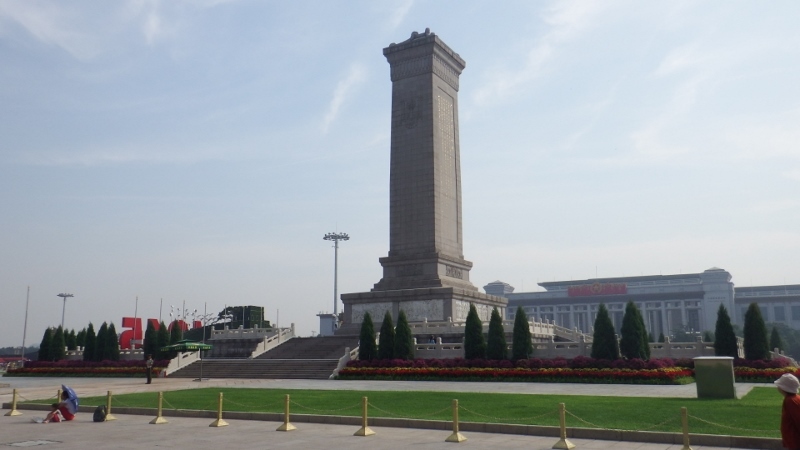 We were still plagued with closures and crowd control from the weekend but were able to walk into Tian’an Men square where this Monument to the people was erected in 1958, that’s a good year!! 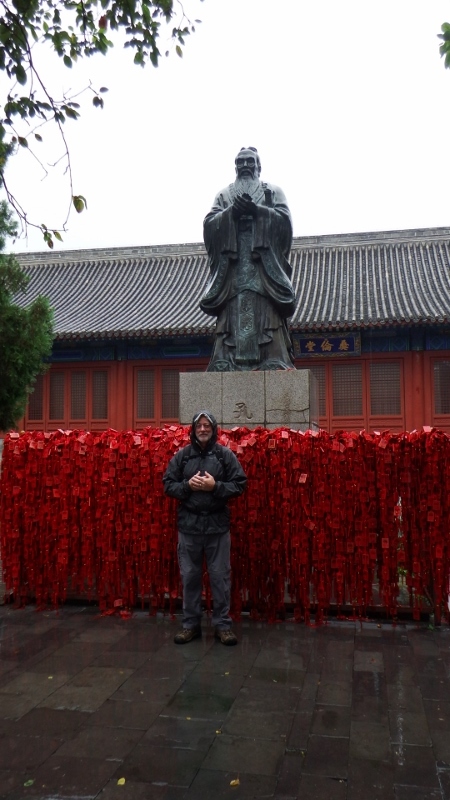 The granite monument is decorated with bas-reliefs of episodes from China’s revolutionary history but this was as close as we were allowed to go. 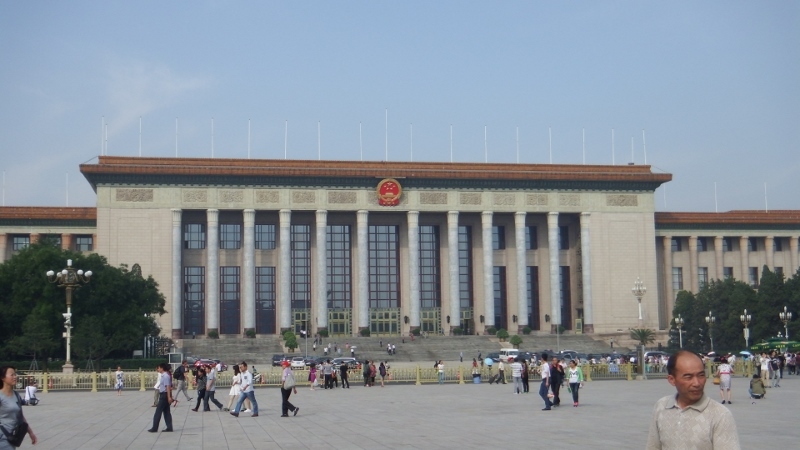 Along one side of the square is this huge building which is the Great Hall of the People and is the seat of the Chinese legislature. The vast auditorium and banqueting halls are normally open but they had been used over the weekend and hadn’t reopened. 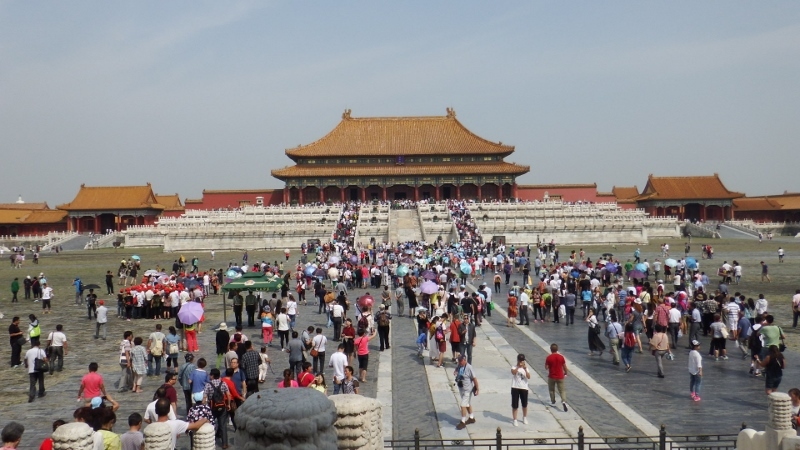 We didn’t spend very long in the square because the whole area was fenced in and to get into the Forbidden city you had to follow a route which, despite being fairly early, already had a fair amount of people snaking along its path so we left the square to join it. 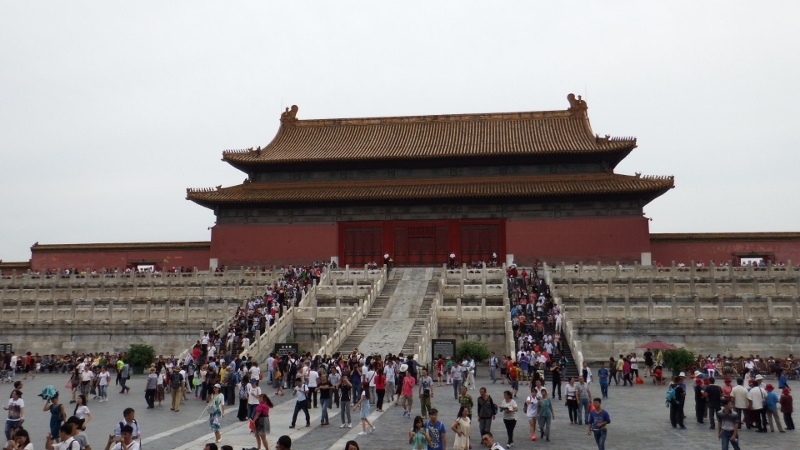 I was worried we wouldn’t get into the Forbidden city because everywhere was still very crowded. The road was closed giving me a chance to take this photo looking back into the square of the vast flower arrangement created to mark the 70th anniversary of VJ day. You can see how crowded it was. It’s just possible we were walking past that fateful spot from 1989. We continued for about 20 minutes until we came to the ticket office. Amazingly there wasn’t a queue because many people were on tours and already had their tickets so we just walked straight in. 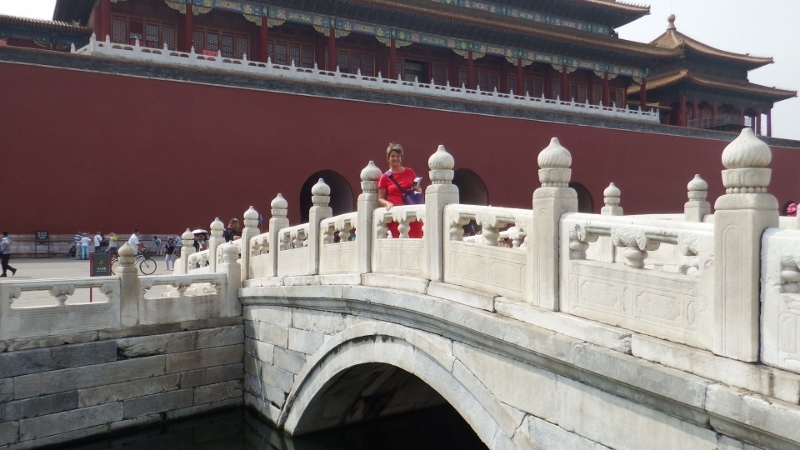 The Forbidden city, officially known as the Palace museum, is China’s most magnificent architectural complex and was completed in 1420. It has seen s4 emperors rule during it’s 500 year history. 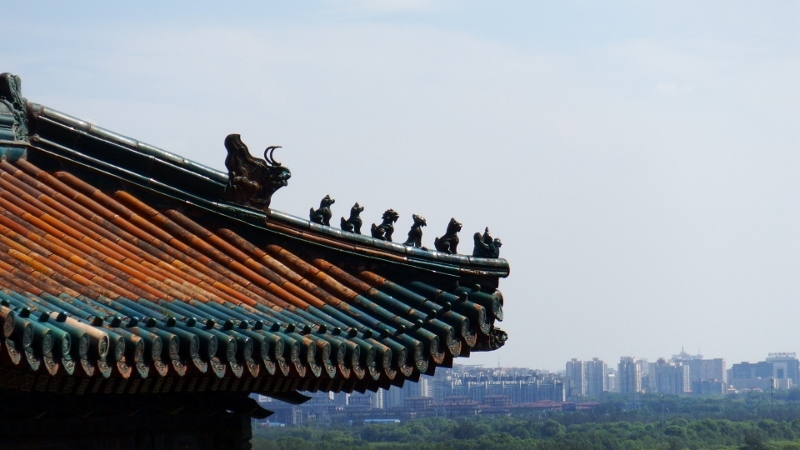 It was the exclusive domain of the imperial court and dignitaries until the 1920s. 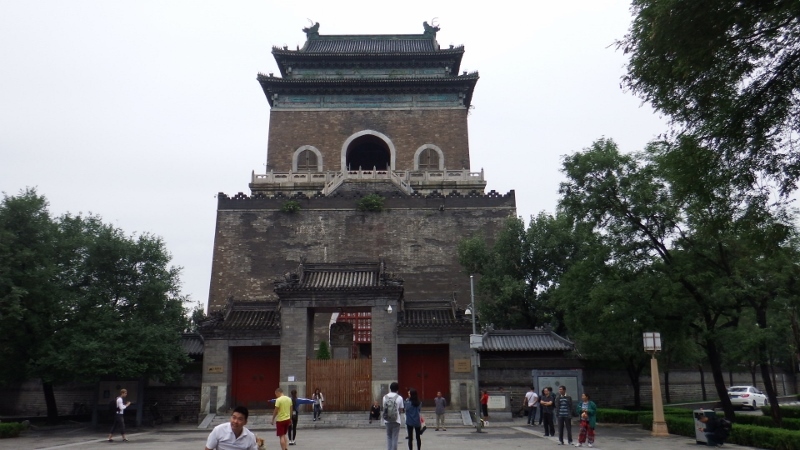 In front of us was the Meridian gate, a U-shaped portal at the south end of the complex. In former times the emperor would review his armies and perform ceremonies from the balcony marking the start of the new calendar. He would also pass judgement of prisoners and oversaw the flogging of troublesome ministers! I took a panoramic shot of it because it’s difficult getting some of these buildings in one photo. Once through the gate the courtyard opened out towards the Gate of Supreme Harmony. Originally used for receiving visitors and later for banquets during the Qing dynasty (1644 – 1912) I walked to the corner of the courtyard to get this photo. This photo was taken from the steps on the eastern side and just shows the vastness of the area. 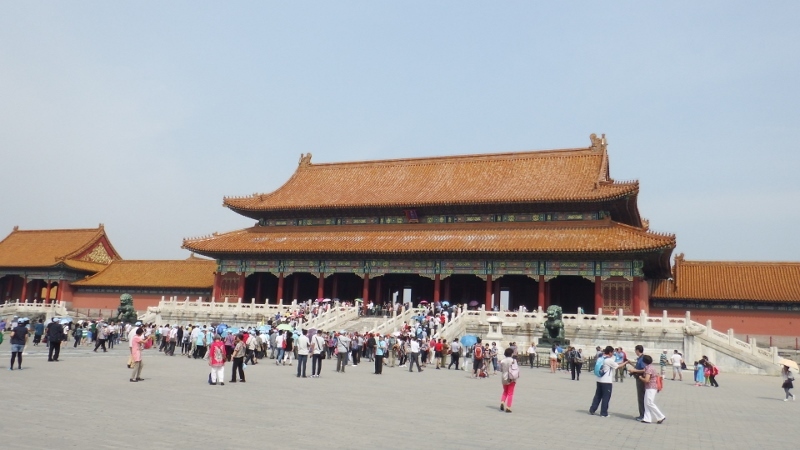 This courtyard could hold an imperial audience of 100,000 people. 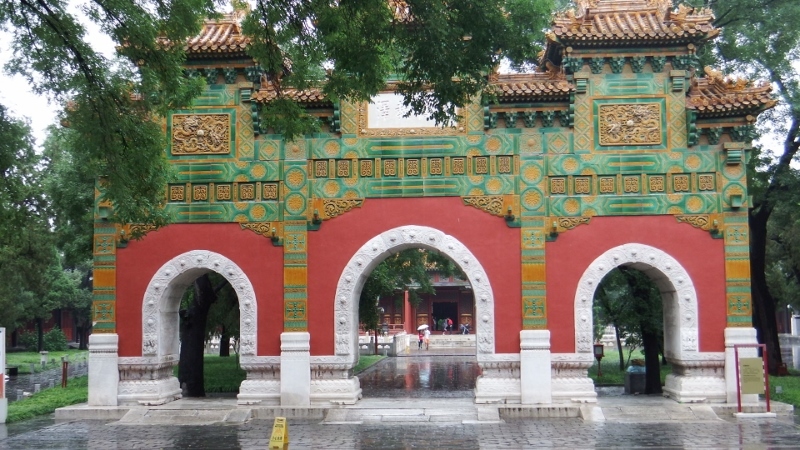 Before passing through the gate we veered off to the east and made our way to the Hall of Literary Glory to look at the ceramics gallery in one of the eastern buildings. Some of the exhibits were stunning. I love vases but these were amazing. 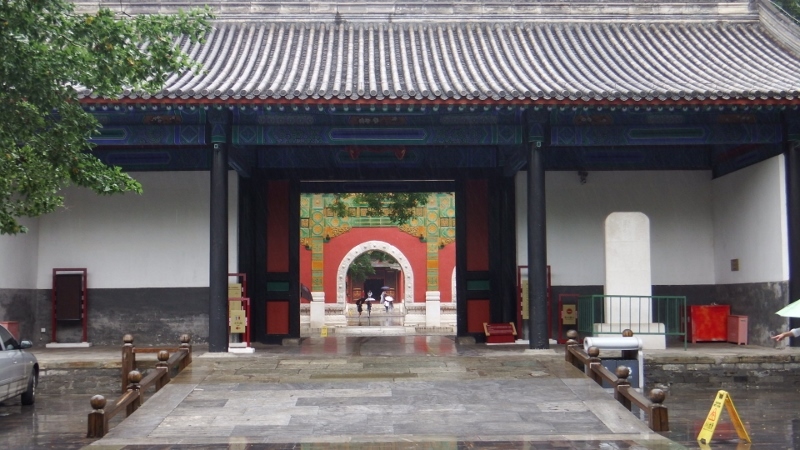 Once back in the main courtyard we made our way back to the entrance with the five marble bridges symbolising the five cardinal virtues of Confucianism. They cross the golden water which flows from west to east in a course designed to resemble the jade belt worn by officials. We crossed over them. 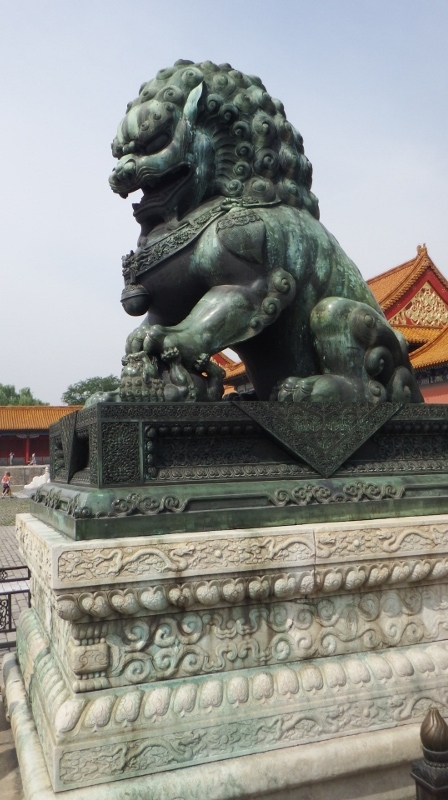 In front of us was the Gate of Supreme Harmony with a pair of Chinese lions guarding the entrance to the halls. 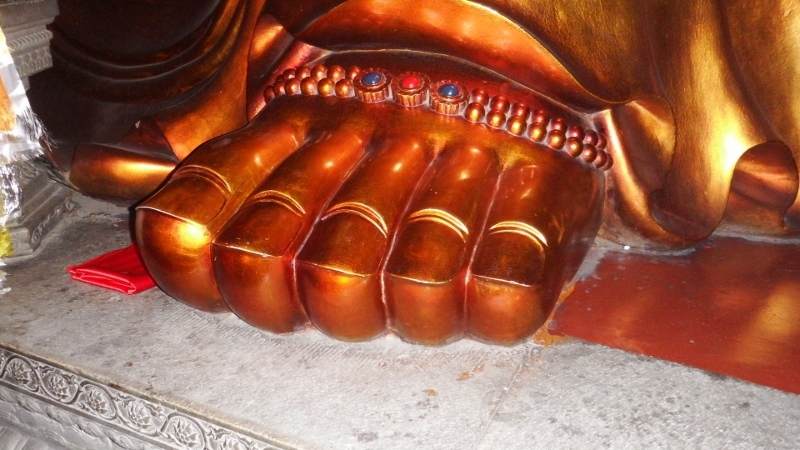 The male is portrayed with a globe under his paw representing the emperor’s power over the world. The female has her paw on a baby lion representing the emperor’s fertility. 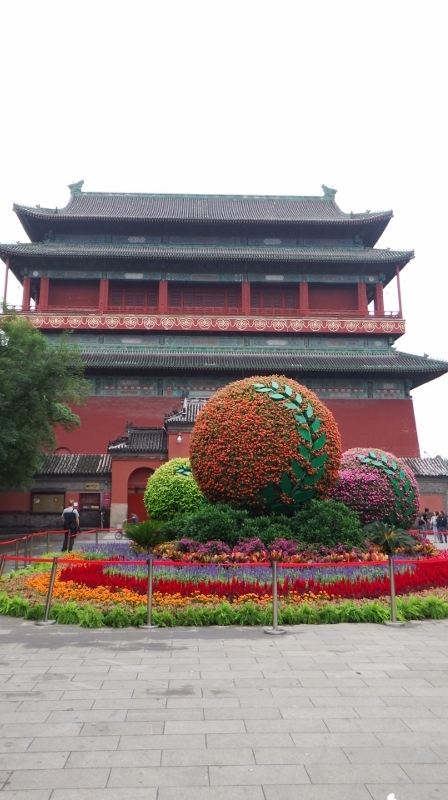 The Gate of Supreme Harmony, like many of the Palace buildings, sits on a raised marble platform which is encircled by dragon head sprouts. They were – and still are – part of the drainage system. 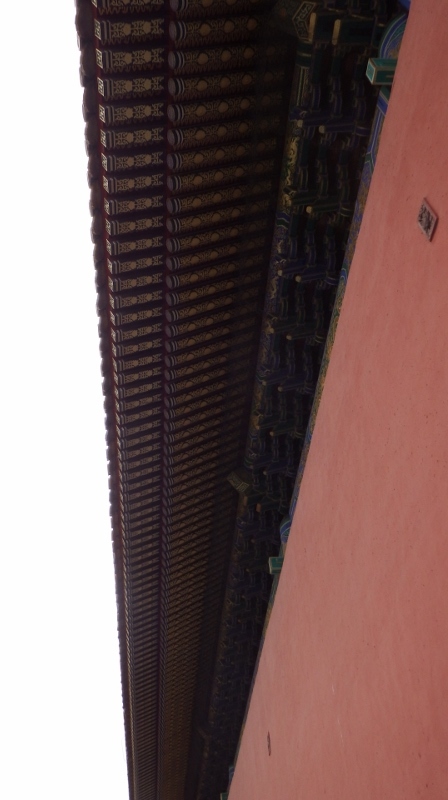 It was very difficult to take photos but this photo of the side buildings of the Hall shows the beautiful restoration work and the same little rows of dragons as seen at the Summer palace. The more beasts, the more important the building. 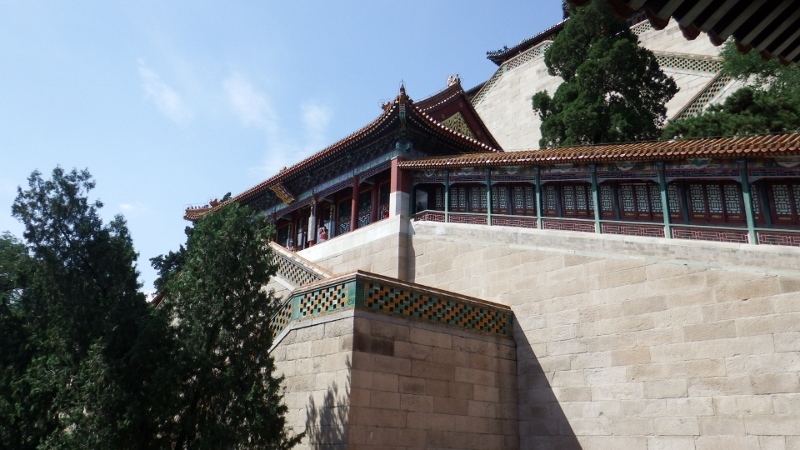 In front of us now were the three great halls raised on a three-tier marble terrace; the glorious heart of the Forbidden city. 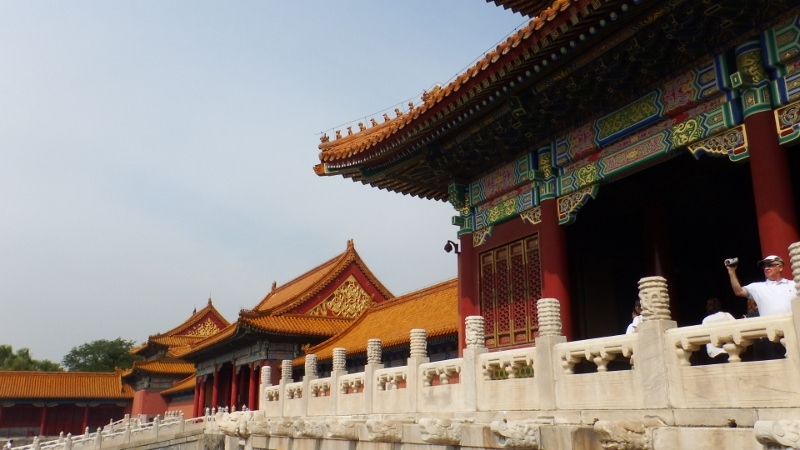 The Hall of Supreme Harmony is the most important and largest structure in the Forbidden city. 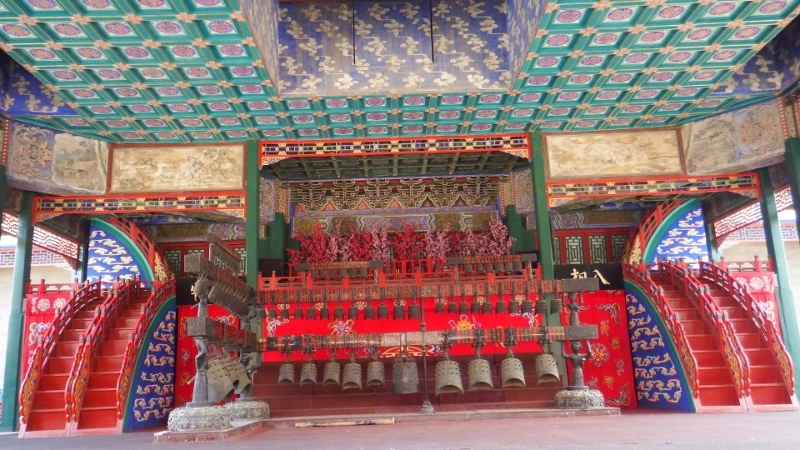 Built in the 15th century and restored in the 17th century, it was used for ceremonial occasions such as the Emperor’s birthday, the nomination of military leaders and coronations. 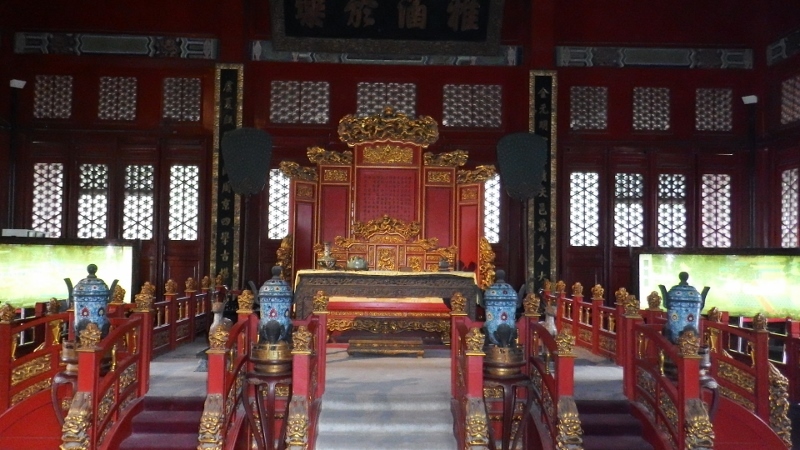 Inside the hall is a richly decorated Dragon Throne from which the emperor would preside over trembling officials. The entire court had to touch the floor nine times with their foreheads in the emperor’s presence. This became known as kowtowing. I managed to elbow my way to the front of the visitors and get my photo. 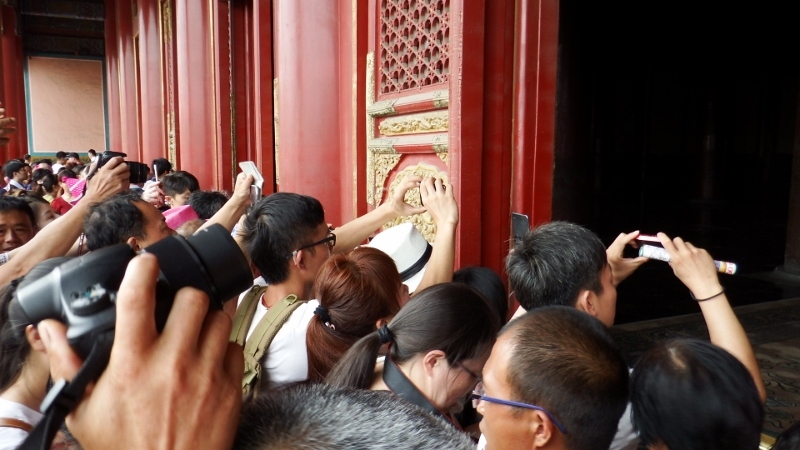 This is what I had to get passed, 100s of Chinese all trying to get the same photo. It was quite mad. 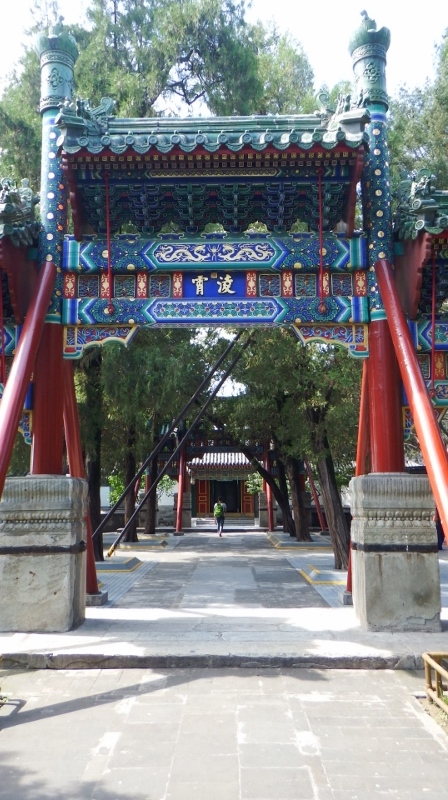 Behind the Hall of Supreme Harmony is the smaller Hall of Middle Harmony, seen here to the right of the photo behind the imperial sundial with the Hall of Preserving Harmony to the left. 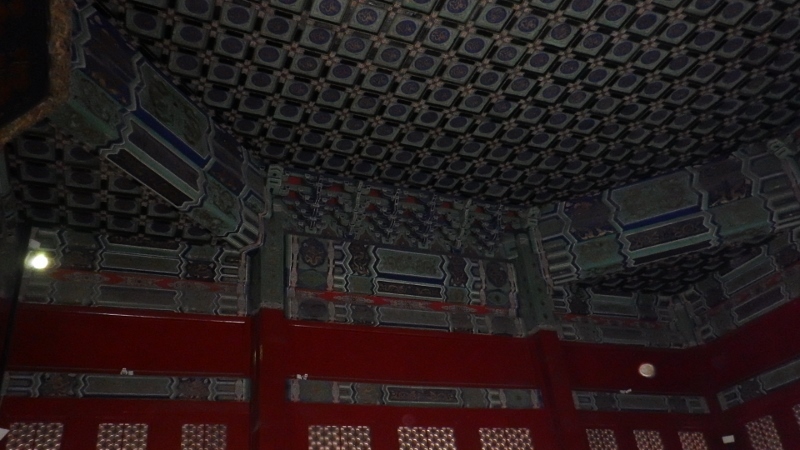 The Hall of Middle Harmony was used as the Emperor’s transit lounge. Here he would make last minute preparations, rehearse speeches and receive close ministers. 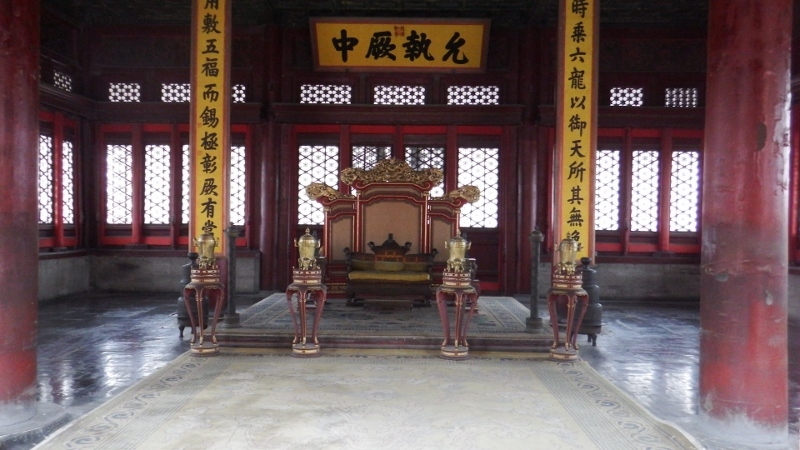 The third of the great halls was the Hall of Preserving Harmony used for banquets. 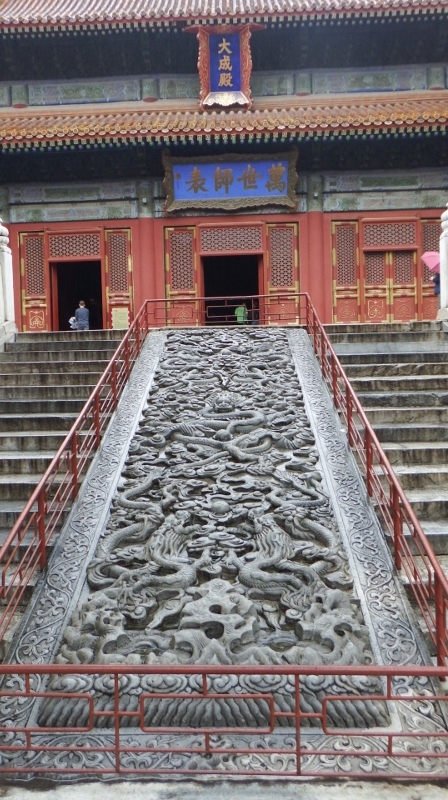 Seen here from the rear with the 250 tonne marble imperial carriageway carved with dragons and clouds. 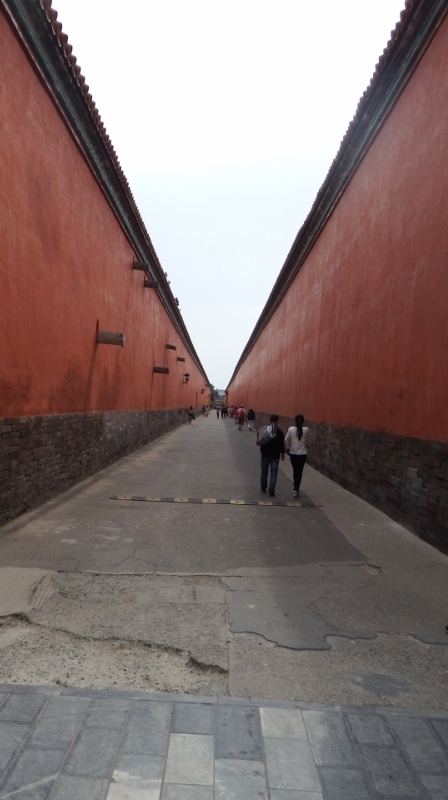 The emperor used to be carried over this carriageway in his sedan chair as he ascended or descended the terrace. 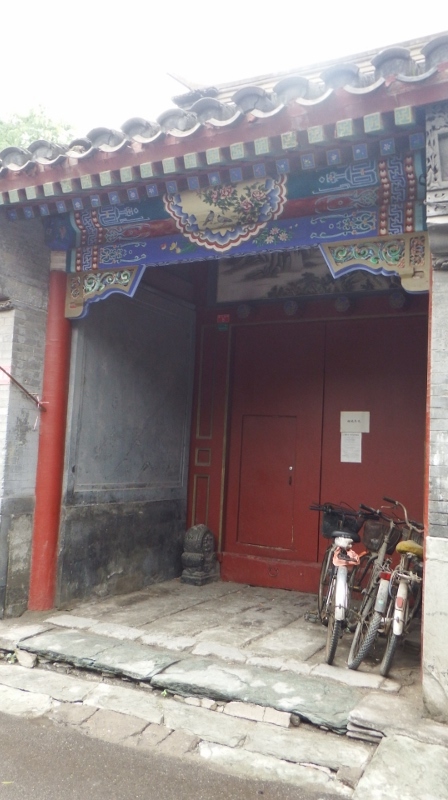 From this narrow courtyard gates lead to the east and west. 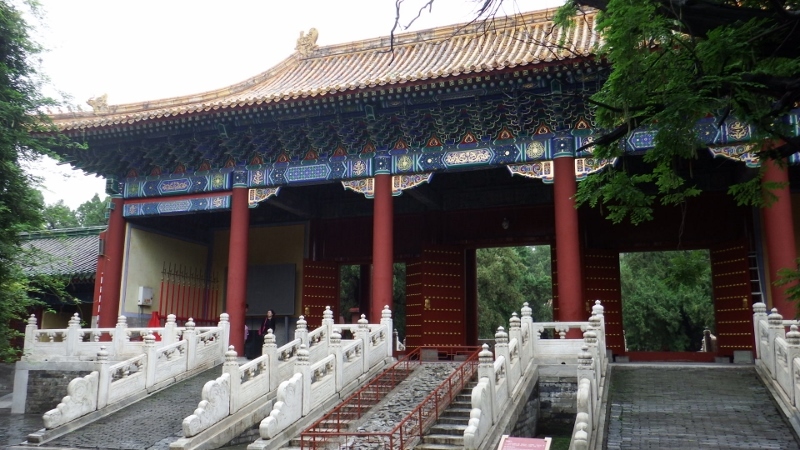 We took the east gate towards the Complete Palace of Peace and Longevity, a mini Forbidden city constructed along the eastern axis of the main complex. 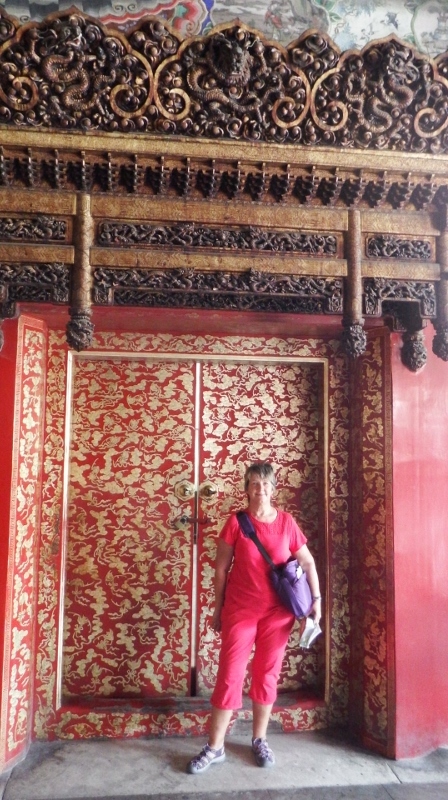 At the entrance stands the beautiful glazed nine dragon screen, one of only three left in China. 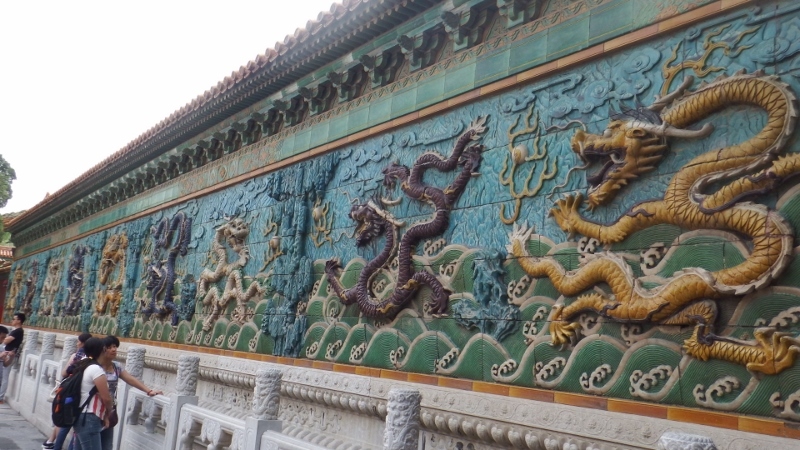 The five clawed dragon represented the power of the Emperor and could only adorn his imperial buildings. 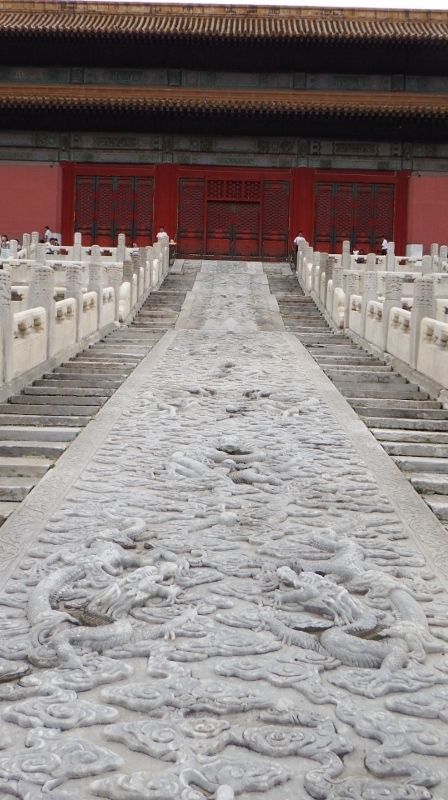 The Chinese dragon is a beneficent beast offering protection and good luck, hence its depiction on screens and marble carriageways. We turned northwards and made our way through a number of halls each a smaller version of the structure of the great halls of the central axis. 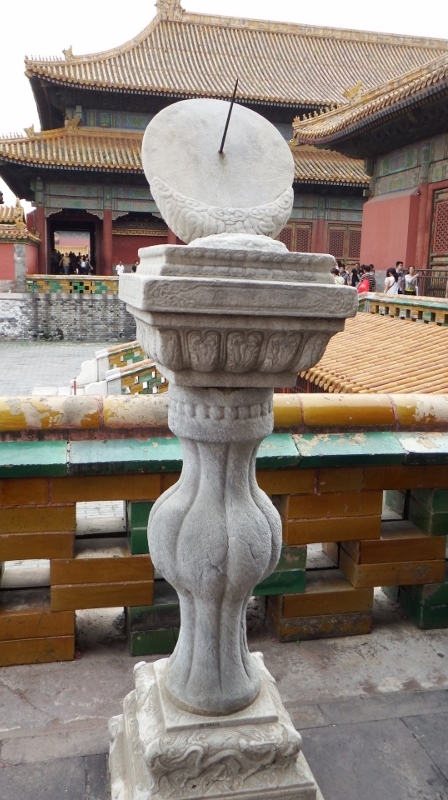 The forbidden city is often compared to a set of Russian dolls. The renovation work of some of the buildings was superb. 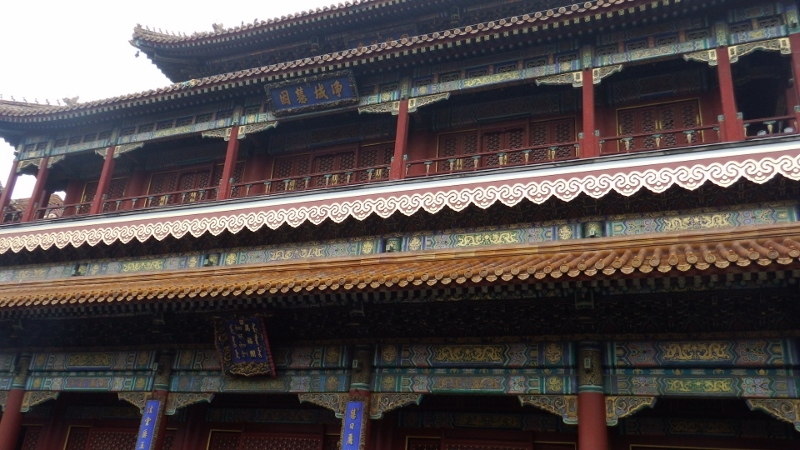 These buildings where the empress dowager and the imperial concubines lived during the Ming dynasty. 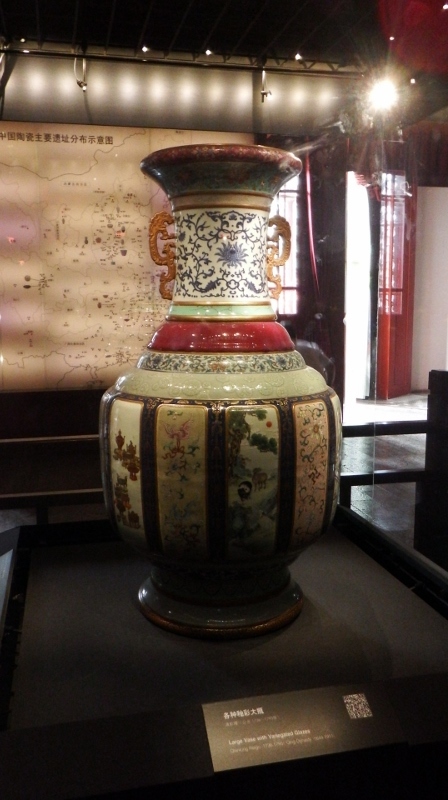 It now contains a number of fine museums known collectively as the treasure gallery. 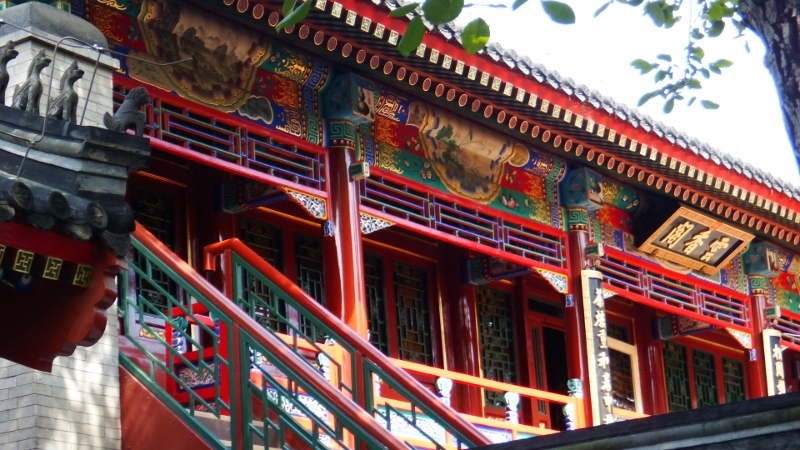 Among these buildings was the Pavilion of Cheerful Melodies, a wonderful 3 story wooden opera house which looked exactly like the Garden of Harmonious Pleasures from the Summer palace although the Pavilion hadn’t been restored as well as the rest of the palace. If you look carefully there are areas around the stage that are deteriorating quite badly. You could still imagine what a spectacle the performances would have been with events happening on all three stages. There were trapdoors in the ceiling and in the floor to allow actors to make dramatic stage entrances. We worked our way to the far north of the inner palace and came out in the area in between the various palaces (Russian dolls again) there were walls within walls. 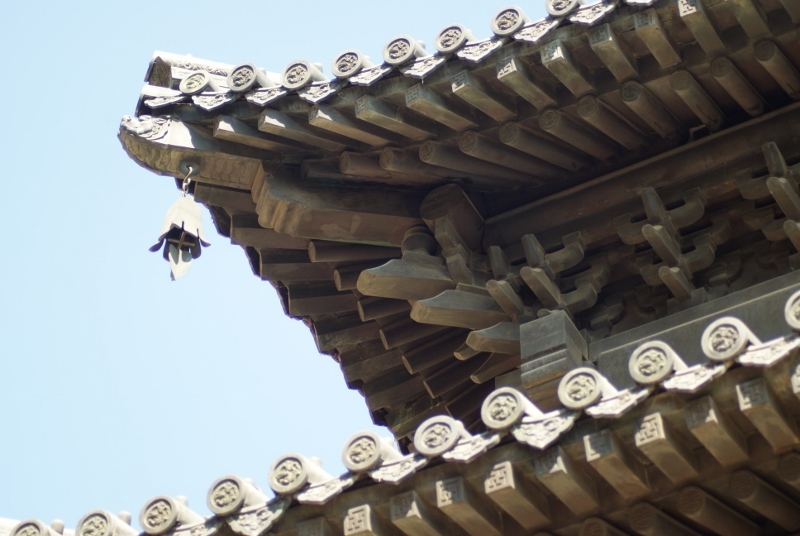 Many of them with beautiful eaves tantalisingly over hanging the walls. 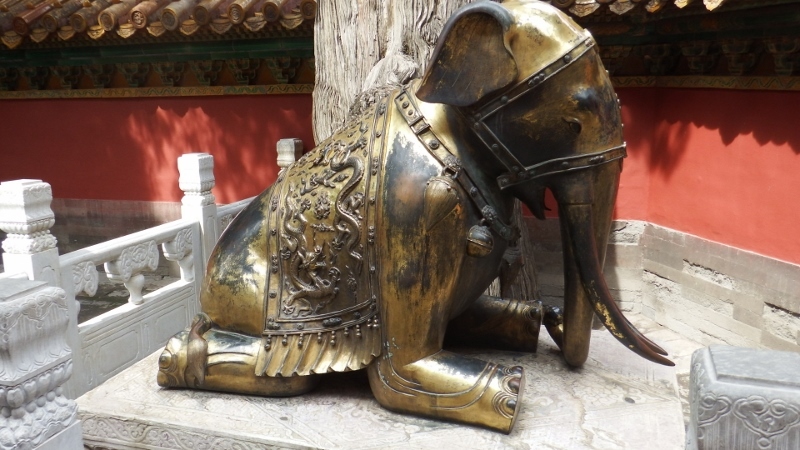 We walked along the north wall to the Imperial gardens to find the bronze kneeling elephant. The anatomically impossible position symbolises the power of the Emperor; even elephants kowtowed to him. 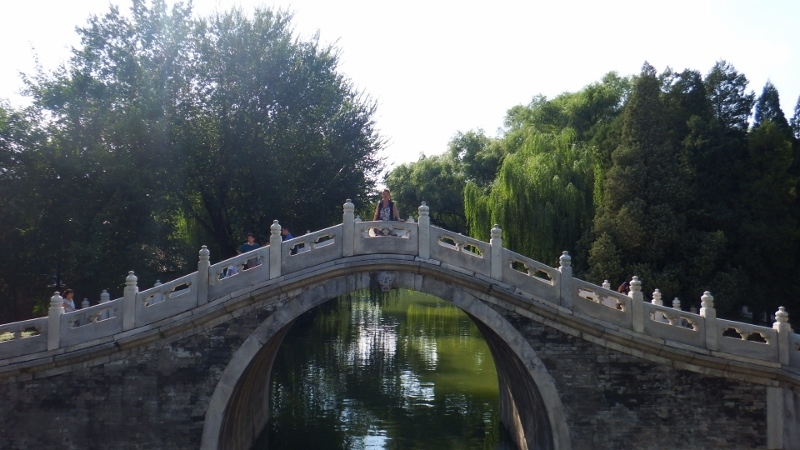 The garden was a classical Chinese garden with 7000 sq metres of fine landscaping including rockeries, walkways and ancient cypresses. 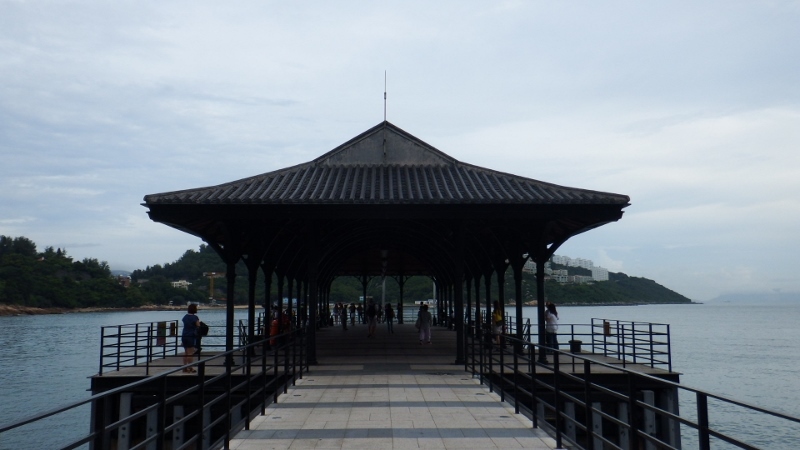 On the west side was the Pavilion of a Thousand Autumns with its impressive circular roof. 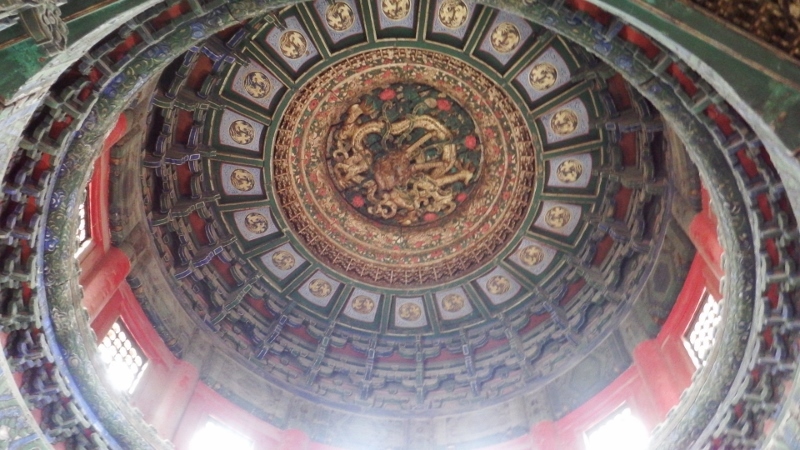 The ceiling inside was exquisite. 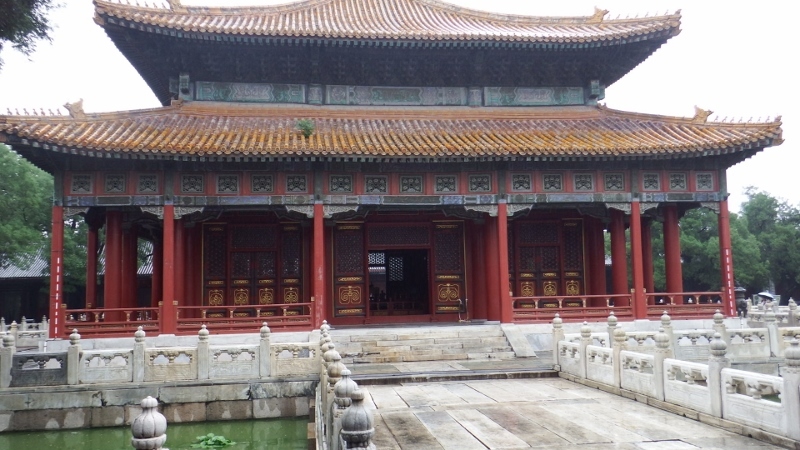 That brought us to the Western Palaces, a collection of courtyard homes where many of the emperors lived during their reign. Much of this area is closed to the public. Finally we were back in front of the Gate of Heavenly Purity. 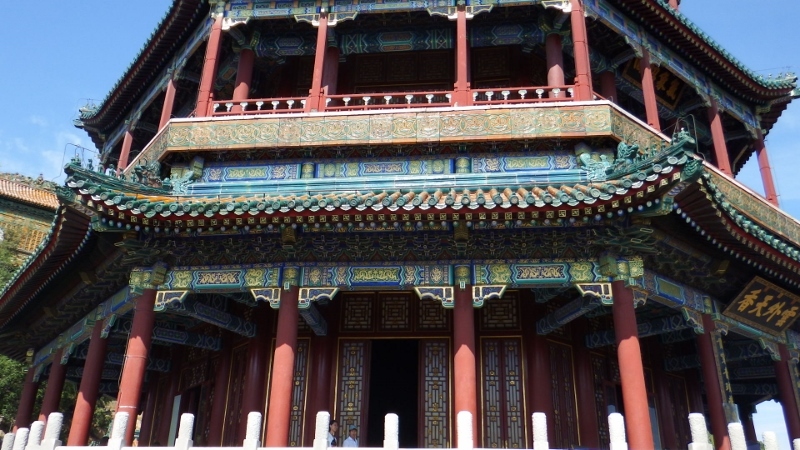 I had given up taking photos by now because there were so many people there and all the palaces look very similar with the same lay out as the three great halls in the centre. 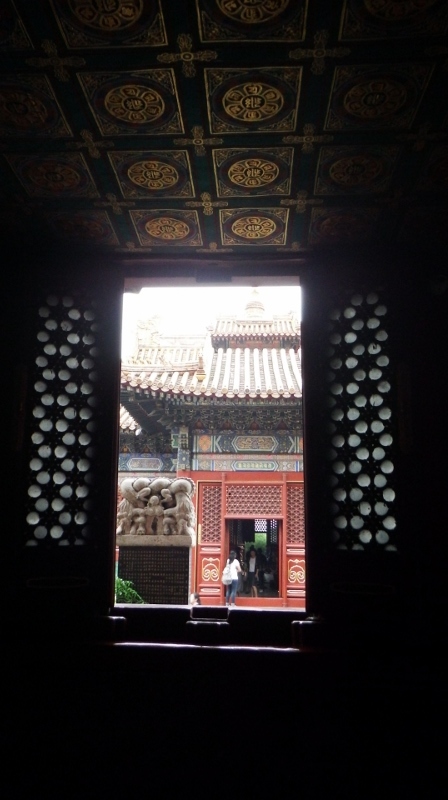 The Gate of Heavenly Purity led to the Inner court with the last three palaces, again mirroring those of the Outer court but on a smaller scale. 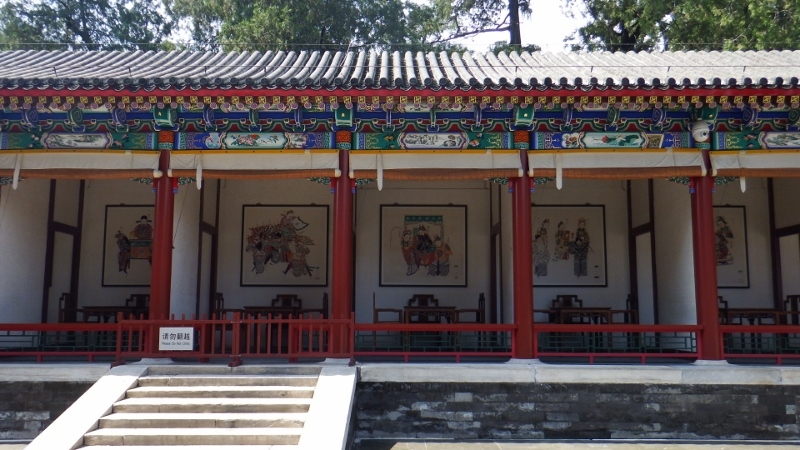 These were the sleeping quarters and it was here that the last Ming emperor wrote his final missive in red ink before getting drunk, killing his 15 year old daughter and his concubines and then hanging himself as peasant rebels swarmed through the capital. 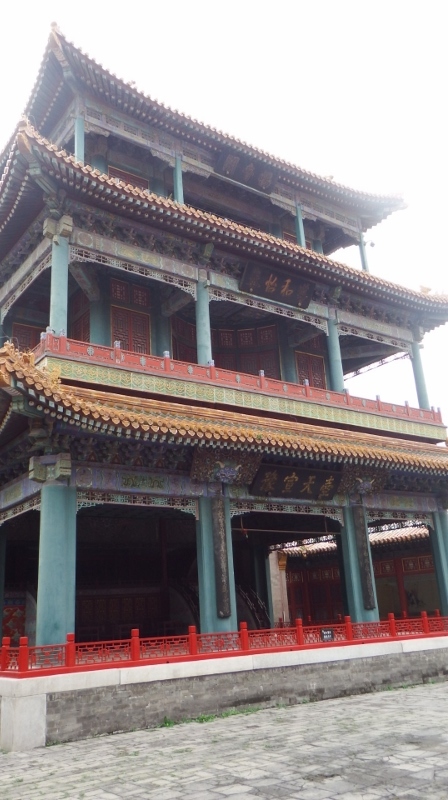 We had spent the whole day wandering around the many palaces. 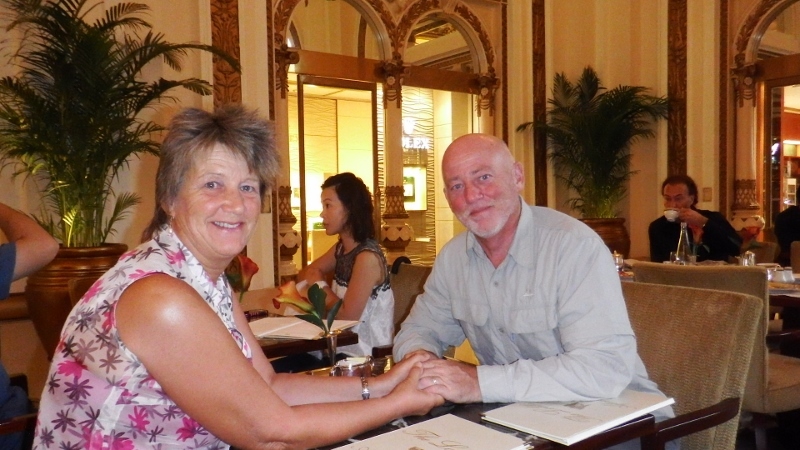 We’d enjoyed a lovely lunch but were now ‘palaced out’ and we walked back to our hotel to collect our bags. 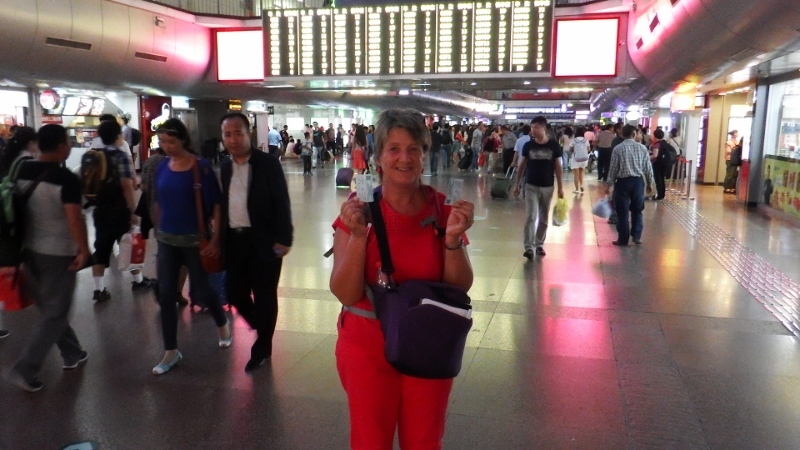 The next part of our adventure was to catch the train from Beijing to Xi an. Using the Metro for the last time we arrived at the train station and picked up our pre-booked tickets with relative ease. 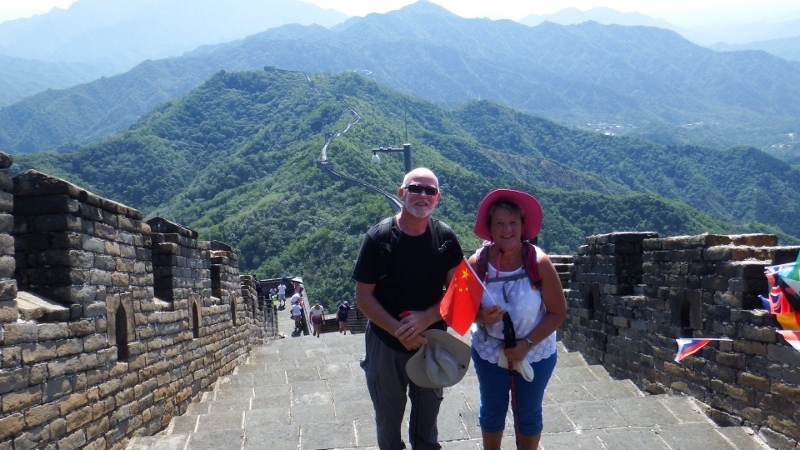 They had been booked for us by www.china-diy-travel.com who are an excellent company. 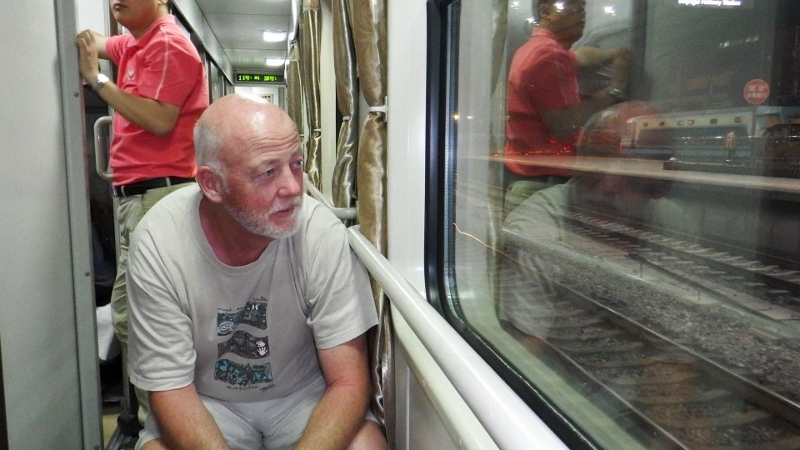 Train tickets in China are released 60 days before the date of travel. This company’s website lists the train timetables, you are able to select the train you wish to take and send them an order form. They will either reserve or diarise your booking for you and send a quotation for payment. They accept payments through paypal. Once they have booked the tickets they send an eticket which you take to the train station with your passport and swop for your tickets. 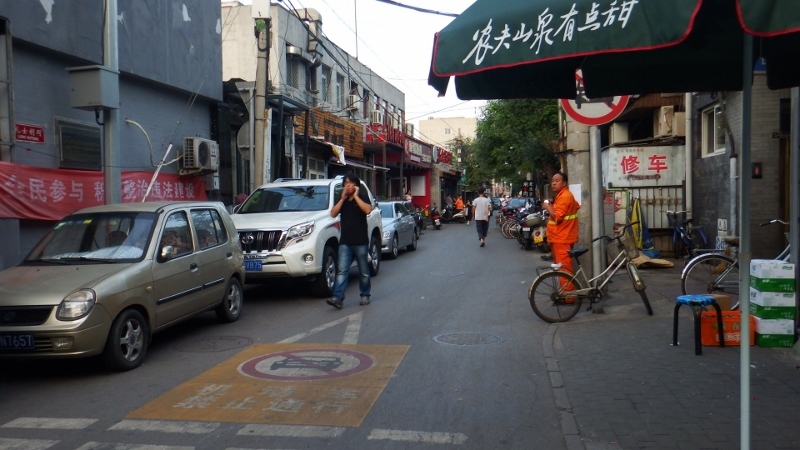 They also sent detailed information about how and where to go with photos and all instructions in English and Chinese. I printed everything out so if all else failed I could just point to the writing. 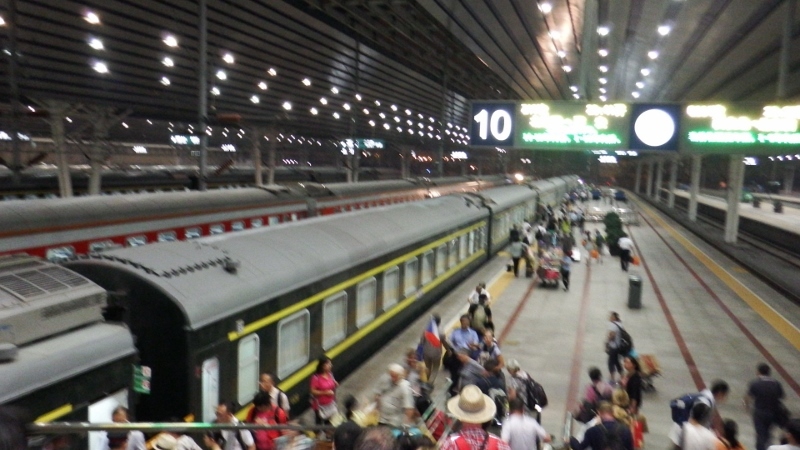 Chinese railway stations are a bit like airports and you need to find out which waiting room to go to because you don’t go to the platform until the train is in. It’s all on their website. hard seats/standing ticket – don’t, really don’t. We had booked an upper and lower soft sleeper. 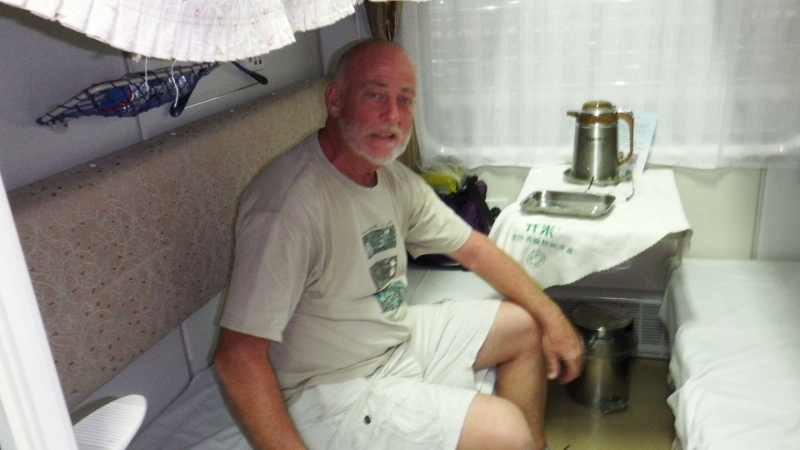 The mattress was still hard, so goodness knows what the hard sleepers are like, and we shared our cabin with two young Chinese girls who giggled every time they attempted to speak English. 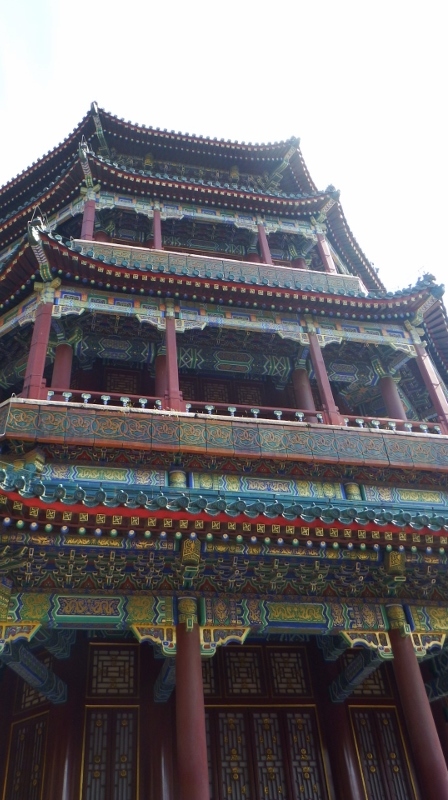 So it was goodbye Beijing; A wonderful city. 4 days was barely enough time to see all it has to offer. It was a shame that some of the sites were closed but it gives us the excuse to come back again. 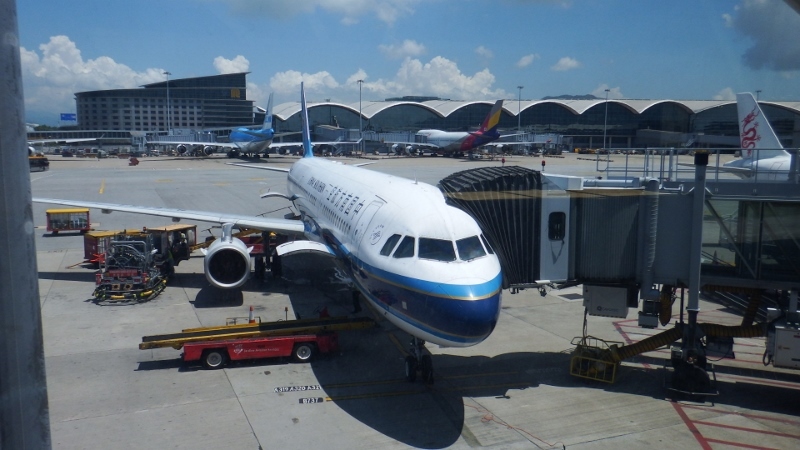 Next stop Xi An. 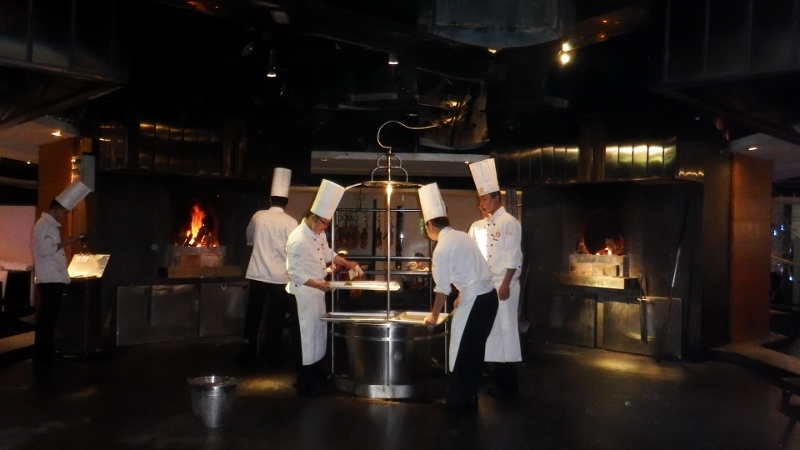 After our exhausting day on the Great Wall for our last evening in Beijing we decided to treat ourselves to Beijing’s specialty Peking Duck. Our hotel gave us directions to a restaurant not far from our hotel called Da Dong. At the time we didn’t realise it was the famous Beijing Dadong which the Lonely planet describes as “Ultra modern Dadong sells itself on being the only restaurant which serves Beijing roast duck with all the flavour of the classic imperial dish, but none of the fat; the leanest roast duck in the capital. For some it’s hideously overpriced and far from authentic. 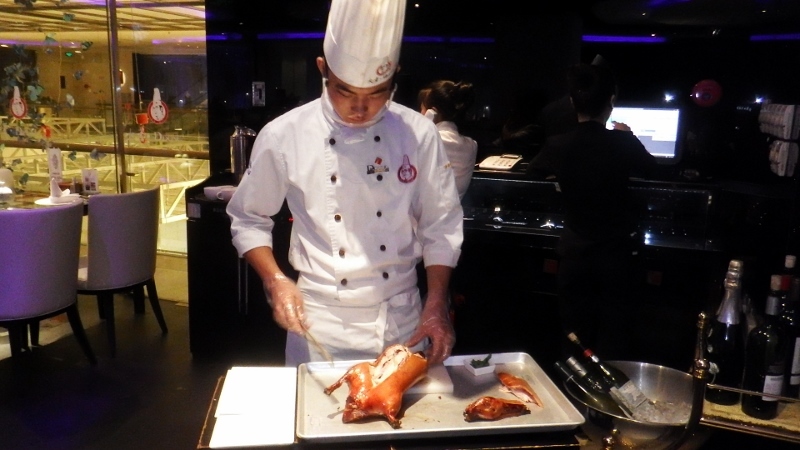 For others it’s the best roast duck restaurant in China”. We would see. The restaurant was on the fifth floor of a very swanky mall. We should have realised we were probably going to blow a weeks budget on one meal when we saw what they were selling on the ground floor. We were shown to our table and given a menu. 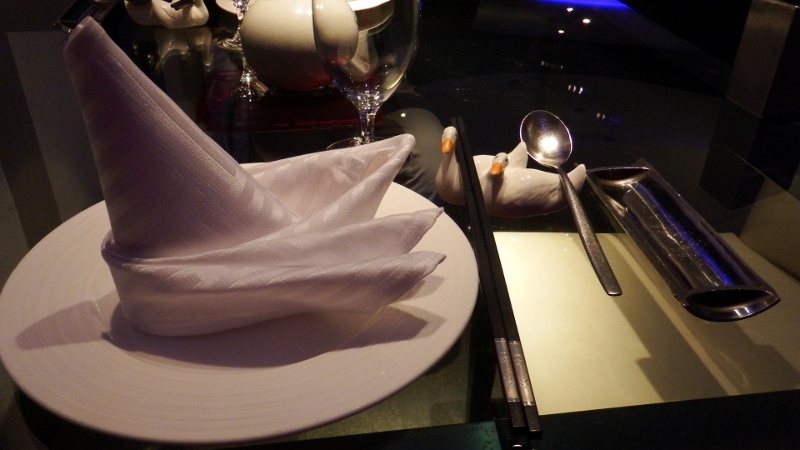 I wondered if they counted the little duck chopstick holders at the end of the day; do you think they would miss it?!! The prices were eye-watering. The waitress came to take our order and we said we just wanted to have crispy duck with the little pancakes. 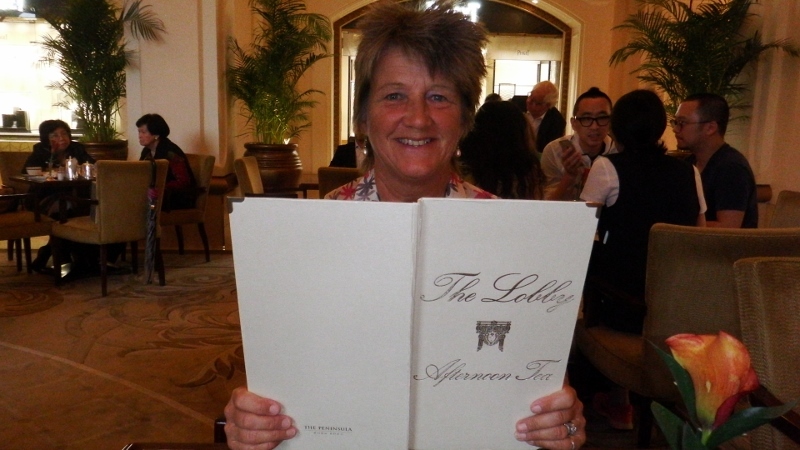 She showed us to the back of the menu where they had the ducks as a set menu and not nearly so expensive as the a la carte prices. So we ordered that. Each duck came with it’s own chef. If any one is going to China to do the same thing, make sure you order a whole duck between two people, half a duck wouldn’t be enough. The waitress brought us our soup while we watched our chef carve our duck beautifully. The waitress brought a tray of condiments each with the spring onions, cucumber, melon (?) and various sauces along with the bamboo basket with the little pancakes in, just like the local Chinese take away – except that it wasn’t. It was the most beautiful duck we had ever tasted. The meat just melted in your mouth, it was delicious. To finish they brought us a bunch of grapes but not just on a plate. No. 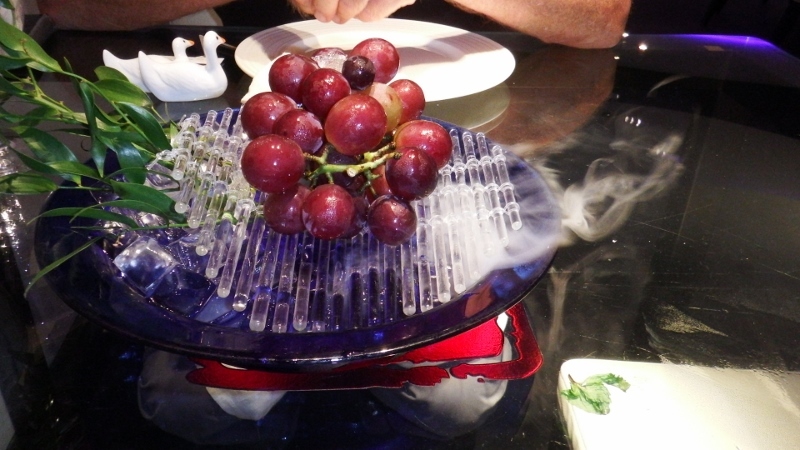 It was a glass dish with dry ice under it. I’m not joking; it looked amazing pouring onto the table. 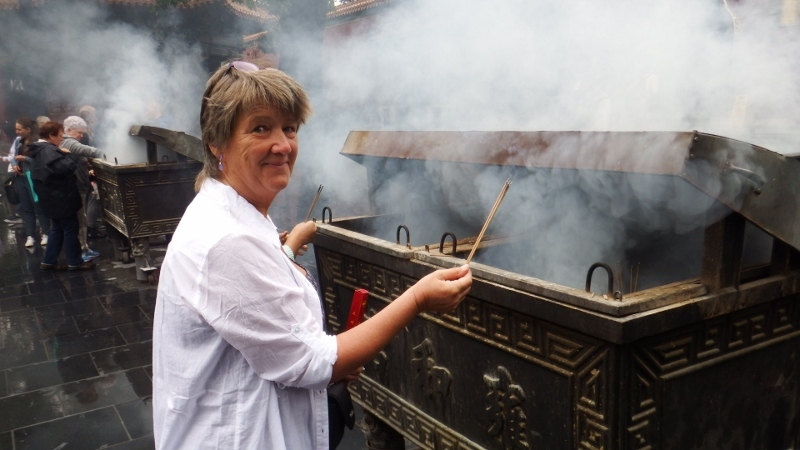 So that was our last evening in Beijing, we just had the Forbidden city to do on our final day. And no I didn’t take the little duck chopstick holders! 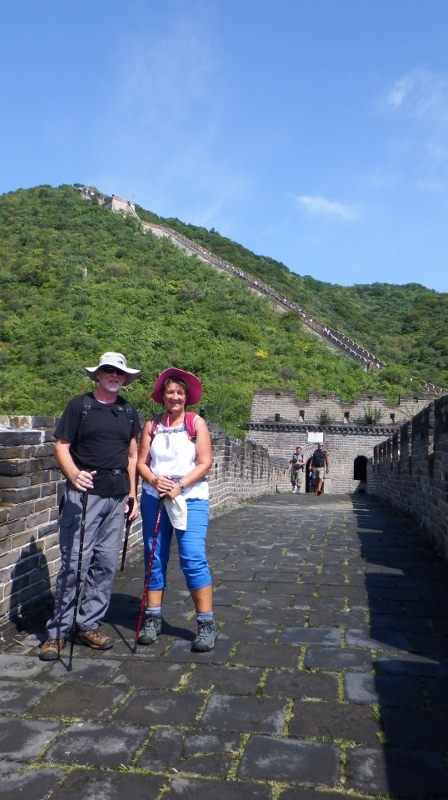 I have wanted to walk the Great Wall of China for a long time and today, the 7th September, we were going to do it. The day was perfect with blue sky and sunshine. 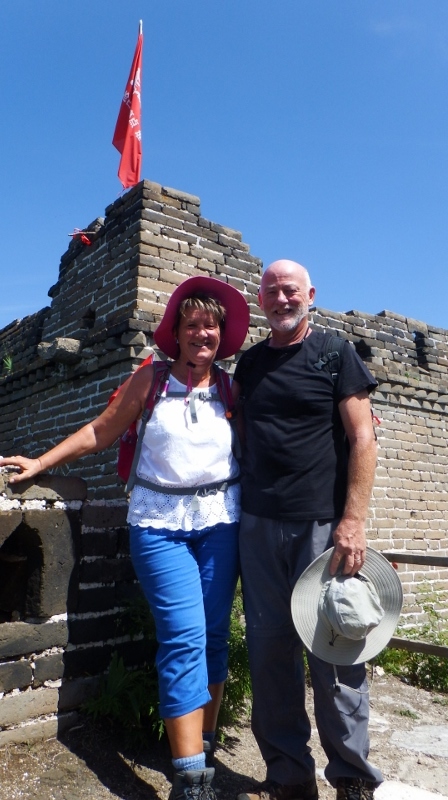 We had decided to go with the hotel tour because although you can get there on public transport there was only 2 days left in Beijing and I didn’t want to miss it. The coach journey took about an hour and a half so we were ready to stretch our legs when we arrived. 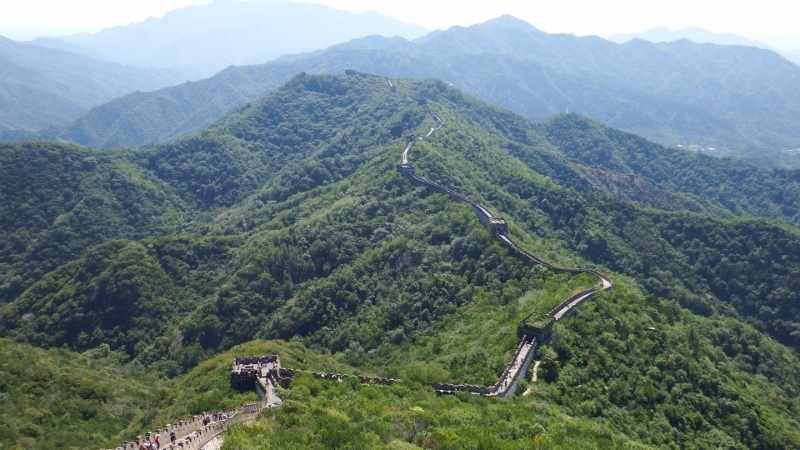 The Great wall was created after the unification of China under Qin Shi Hangdi over two thousand years ago. It snakes through the countryside for several thousand miles and enabled speedy communications as well as the rapid transport of troops throughout the country. 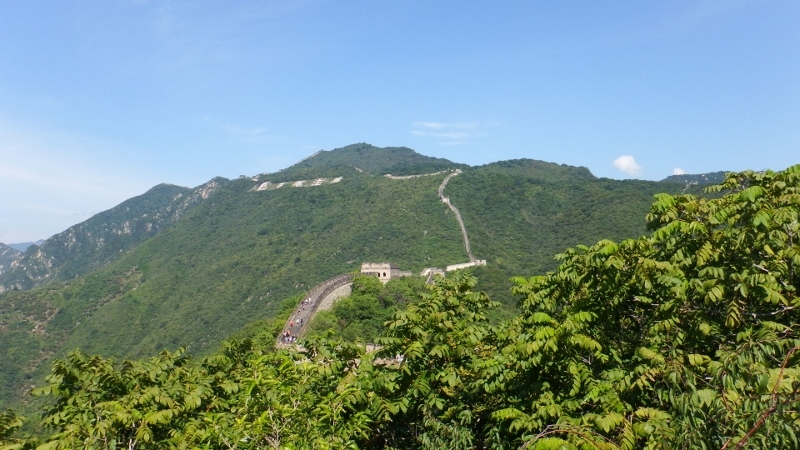 There are 4 main areas to visit the Great Wall from Beijing. 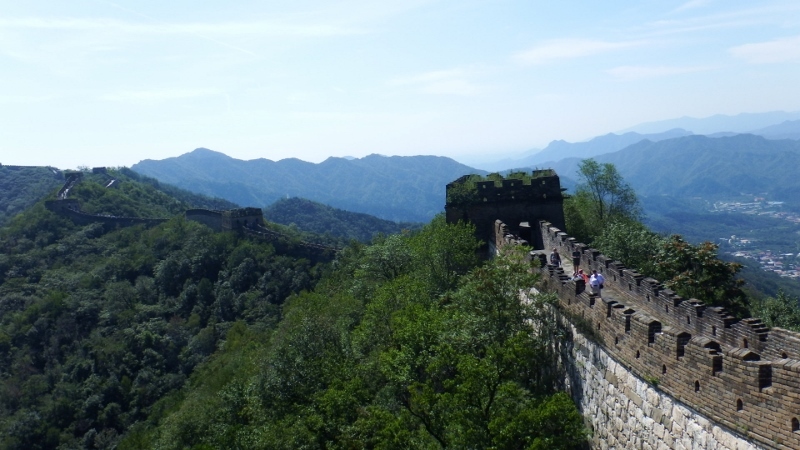 Badaling is the most touristy part of the wall followed by Mutianyu which is less commercial. 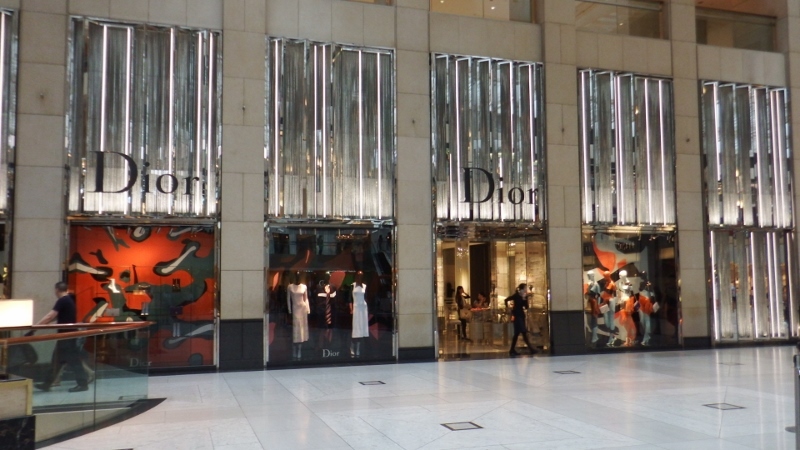 There are also 2 areas that are only partly renovated and apparently a bit of a struggle. We decided to go to Mutianyu in the hope there wouldn’t be too many people there. 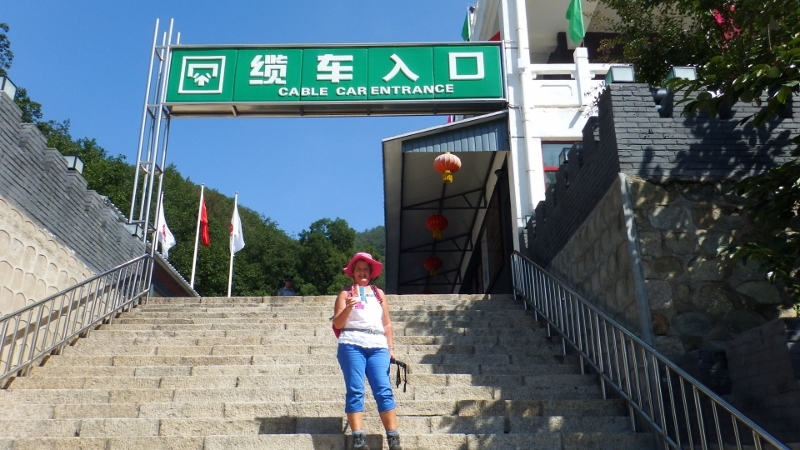 With our cable car tickets we got on and rose slowly to the top. 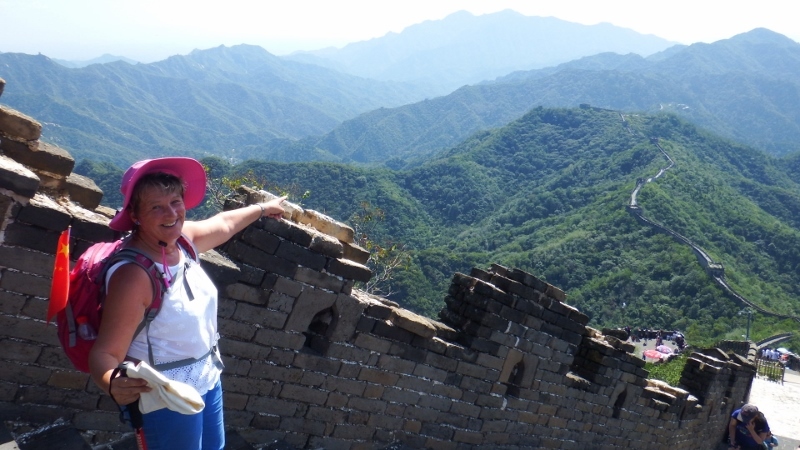 I felt so emotional when I got to the top and saw the Great Wall for the first time I burst into tears. Memories of my childhood walking the Seven sisters near Eastbourne with my Dad and my Uncle Terry as a little girl came flooding back. How Dad would have loved this, maybe he was walking with me. I took this photo from the terrace of the cable car platform. 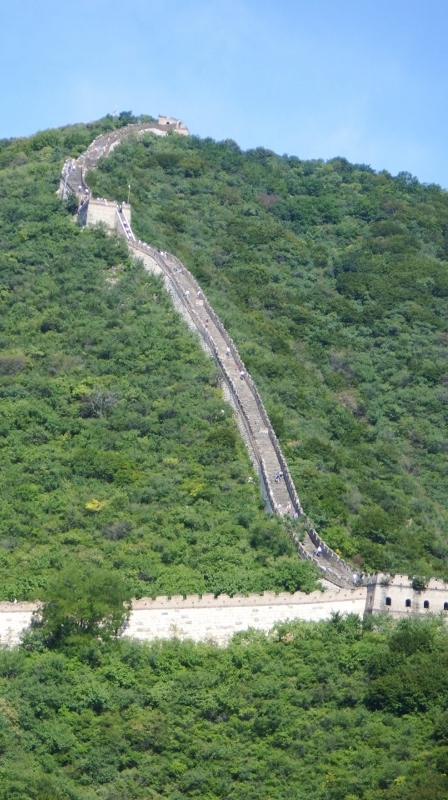 You can see the wall winding ahead with the very steep steps half way along. 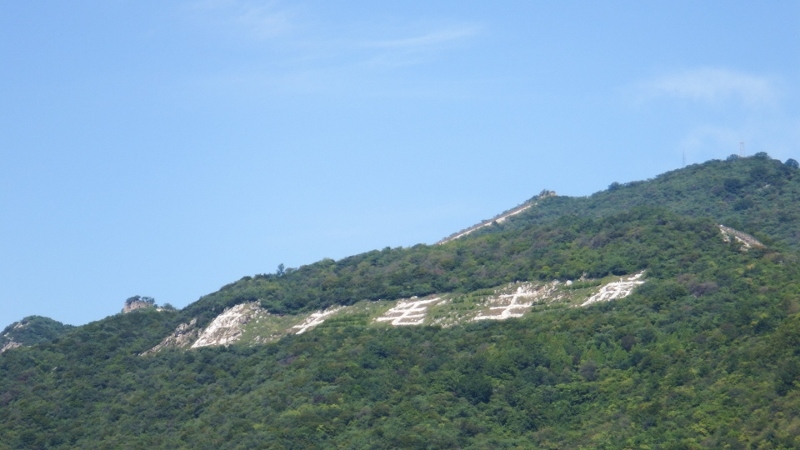 This is a close up of the Chinese lettering on the hillside. What a great place to have your wedding photos taken. The first section was quite crowded but soon started to thin out as we continued. 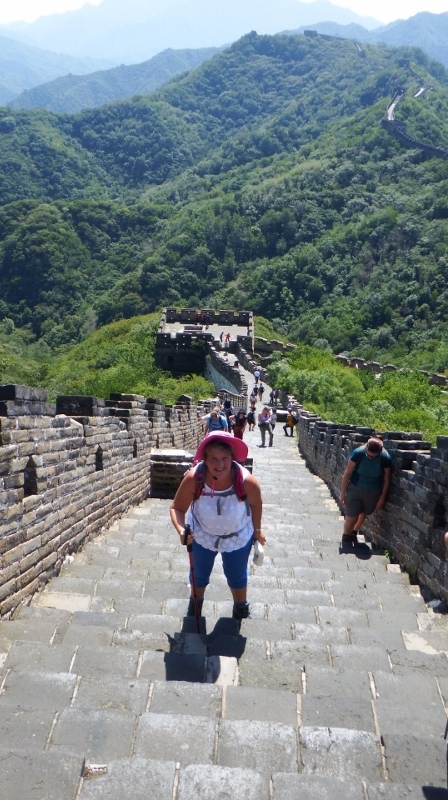 Some people just want to go to the Great Wall, have their selfie taken, and leave. Total madness. 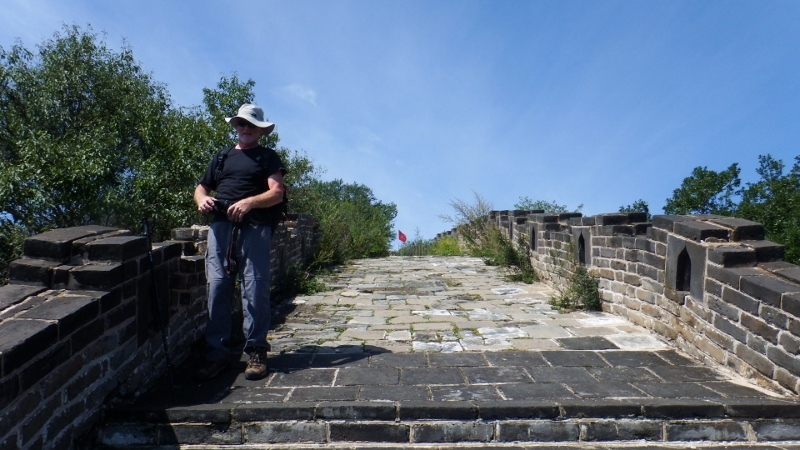 Famed for its Ming-era guard towers, of which there were 10 in the section we walked, the wall is largely a recently restored Ming dynasty structure that was built upon a earlier Qi-dynasty edifice. 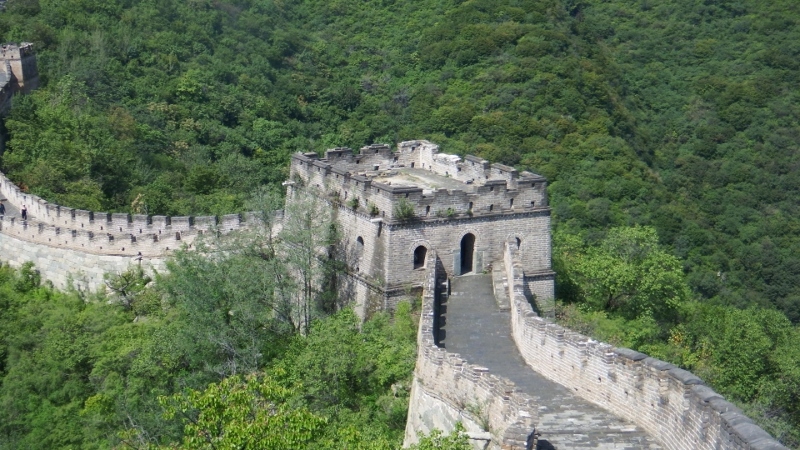 The watchtowers served as signal towers, forts, living quarters and storerooms for provisions. They were spaced two arrow shots apart to leave no part unprotected (I was lucky to get this shot without any one in it). 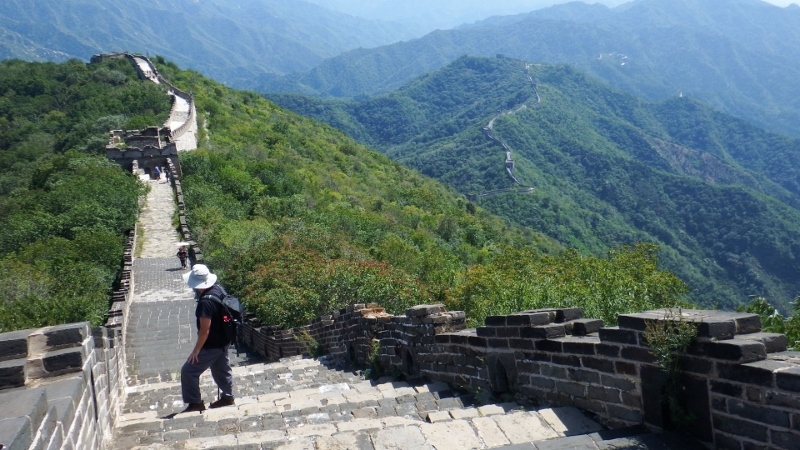 The first section wasn’t that difficult with a mixture of level wall and steps but we could see the steep section up ahead. 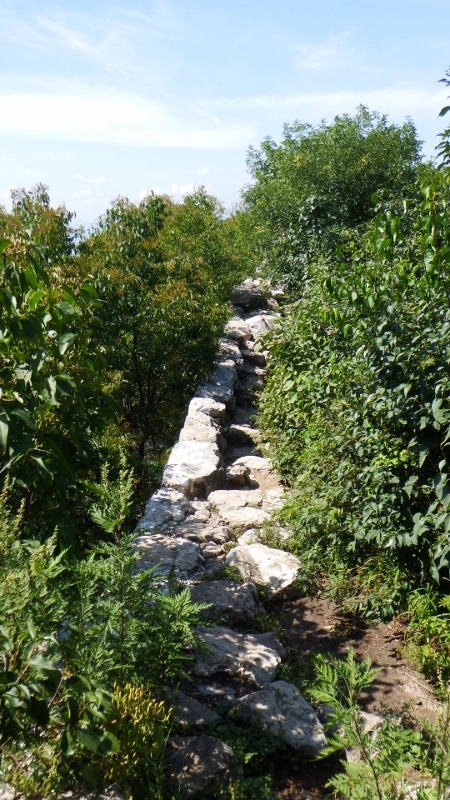 The wall took advantage of the natural terrain for defensive purposes following the highest point and clinging to ridges. The ramparts enabled the defending soldiers to fire down on their attackers. 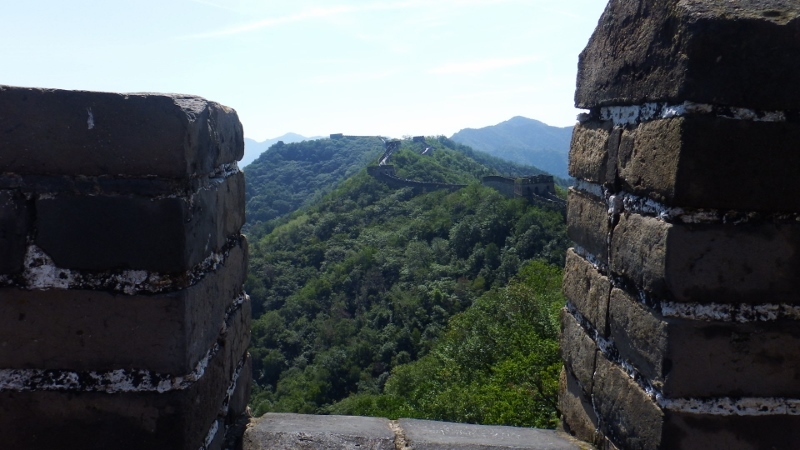 Although despite its impressive battlements the wall ultimately proved ineffective because it was breached in the 17th century by the mongols and then in the 17th century by the Manchu. 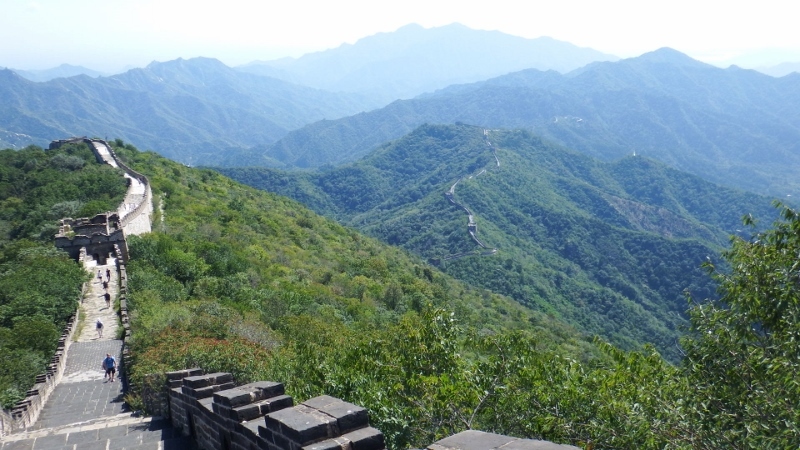 Today only certain sections have been fully restored and offer superb panoramic views. But this wasn’t the top, it went on, although this was as far as a lot of people went. We were the only ones in our group to continue. 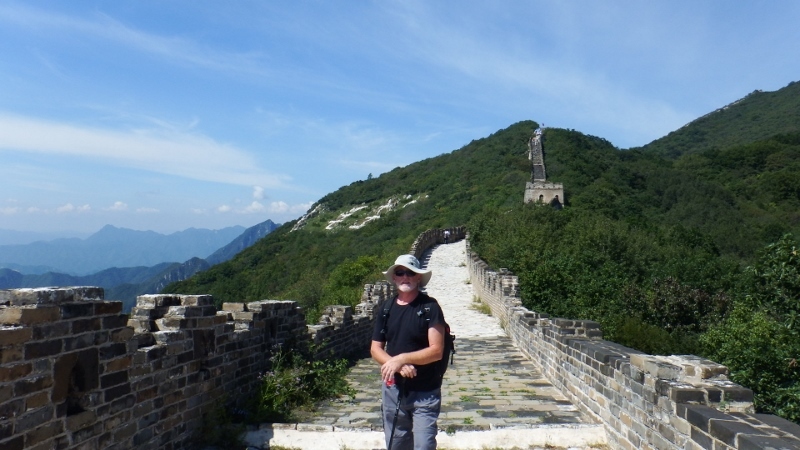 It looks like I’m leaning backwards but the walls really were this sloped. It had taken us several hours to get this far but we wanted to continue. 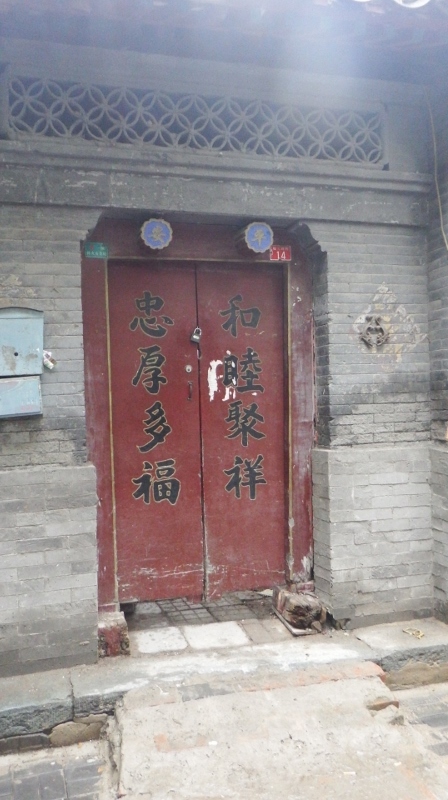 We were now level with the Chinese lettering. The path was more overgrown this high up. Would you believe this high up there was a lady selling souvenirs! I asked her if she carried all her goods up every day and she replied yes every day. She deserved a sale for working all that way every day. We had made it to tower 23 which is as far as you could go on this section. 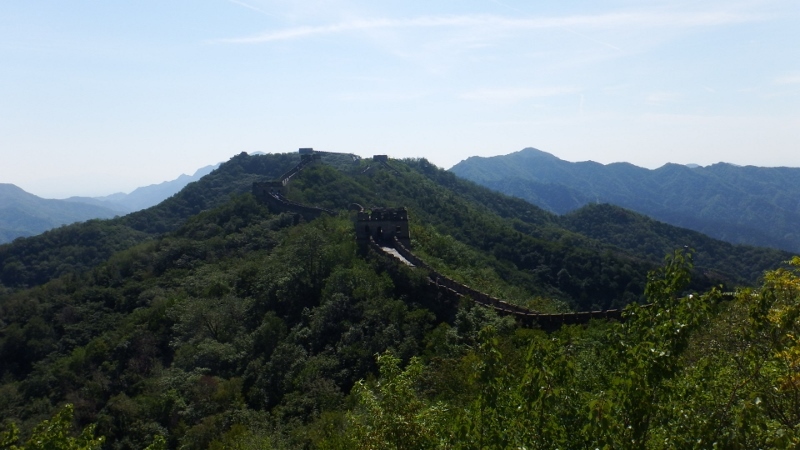 Sadly most of the wall is still unrestored and is crumbling away. We walked along it for a little way but it was difficult and probably dangerous. Up ahead we could see another steep section which if unrestored would be dangerous so we turned round to start our descent. Coming down was harder than going up. Our legs were tired now. Once intended to ward off enemy attack today it brings the peoples of the world together. 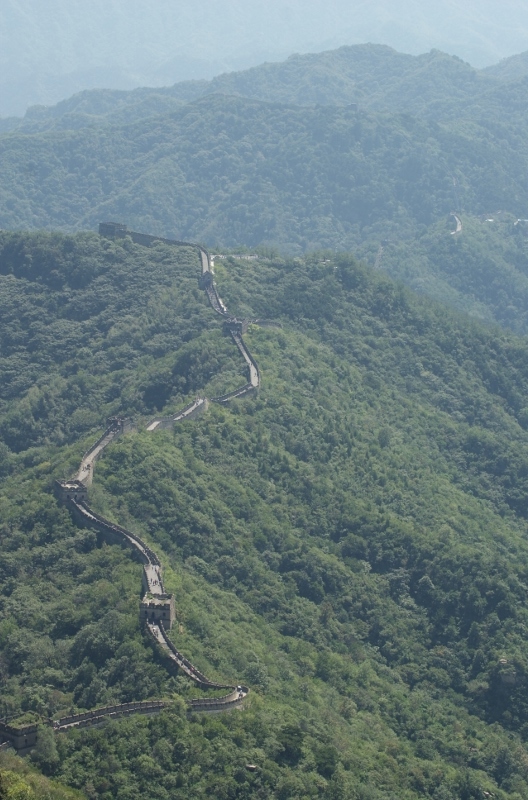 The Great Wall may it continue to act as a symbol of friendship for future generations. 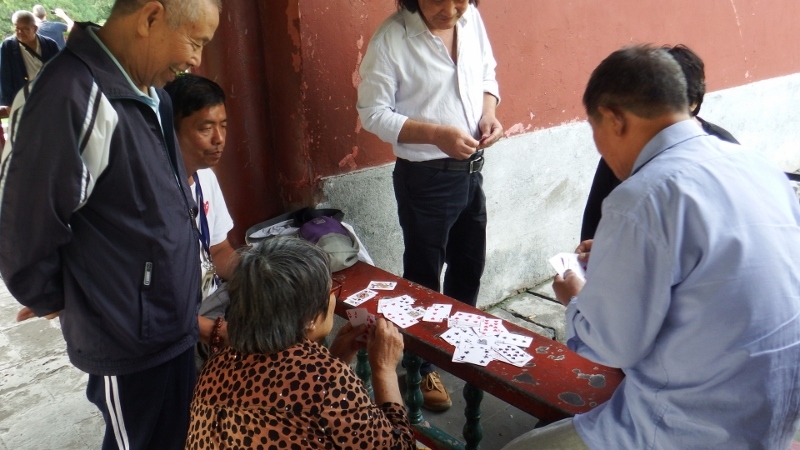 Playing cards but not as we know it. 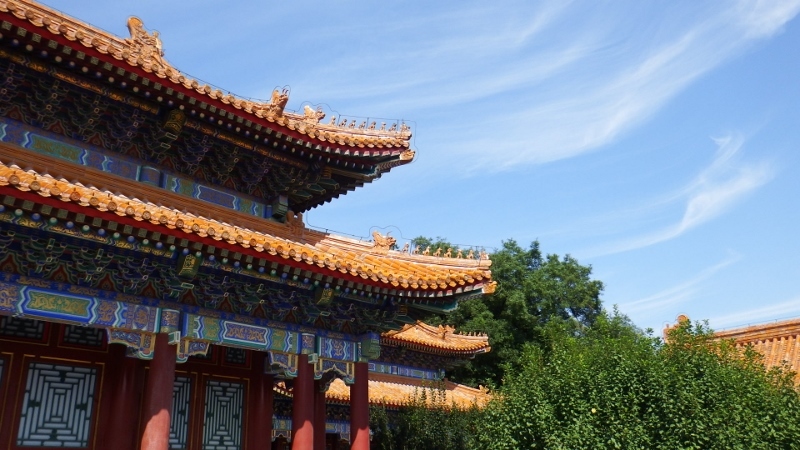 Continuing on with the Chinese story. Sunday 6th September was one of our few sunny days. 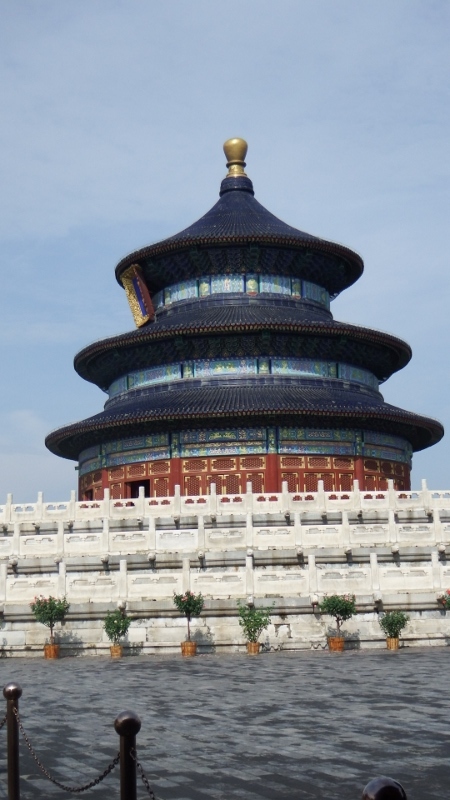 The plan was to visit the Hall of Prayer for Good Harvests in the Temple of Heaven park first thing, walk up to Tiananmen square and spend the rest of the day in the Forbidden city. 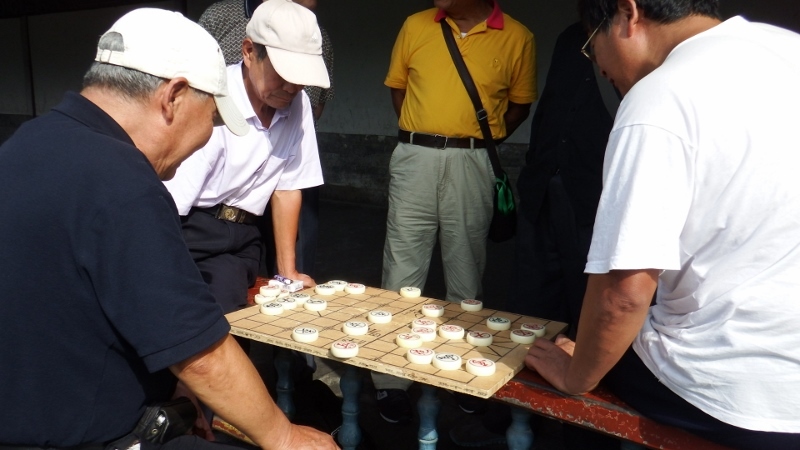 After a short ride on the Metro we arrived at the park to find lots of elderly Chinese people using the park for Taichi, singing, card games and a game that looked like a cross between chess and draughts. Whatever it was it caused a lot of shouting and light hearted arguing. 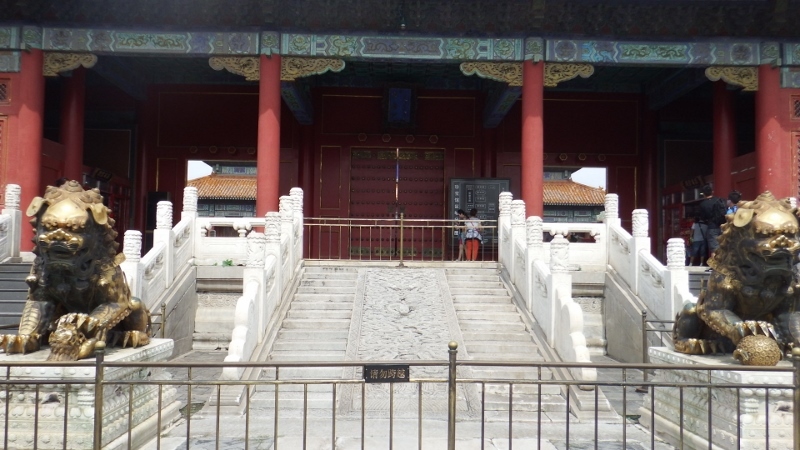 Then we found another closure, the whole of the Tian Tan complex of the Hall of Prayer, the imperial vault of heaven and the marble platform was closed. 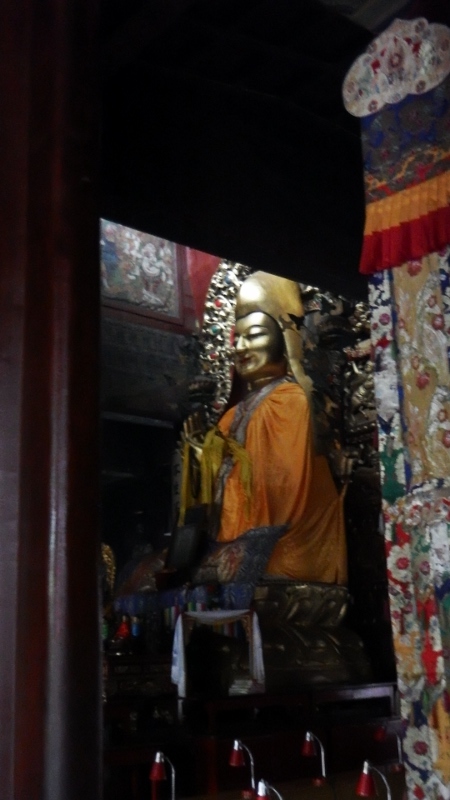 I was SO disappointed, apparently some of the visiting dignitaries were due to have a tour of the temple that morning and it was shut for security. Having seen some of the photos of the inside it’s supposed to be stunning but all we could see was the triple eaved blue roof from a distance. We were also on the wrong side of the park for the walk to Tiananmen square so we walked back to the east entrance and took the Metro there. 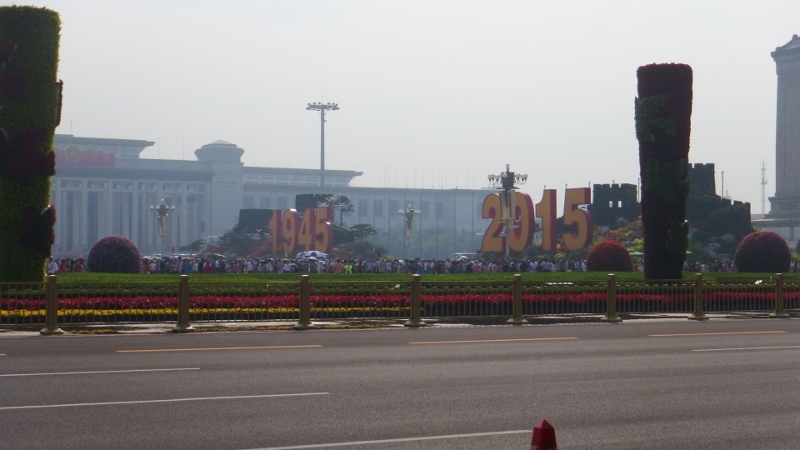 When we got to Tiananmen square we found throngs of people all heading in the same direction. 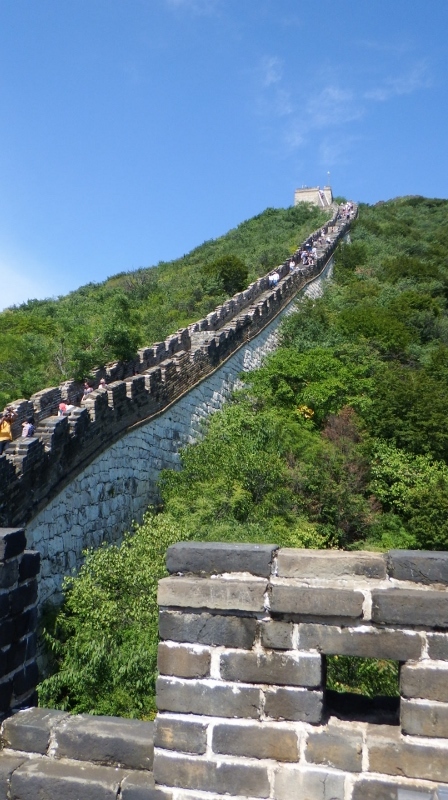 As it was a Sunday we assumed it was extra busy, we were later to realise that all Chinese monuments are always busy. So what to do? 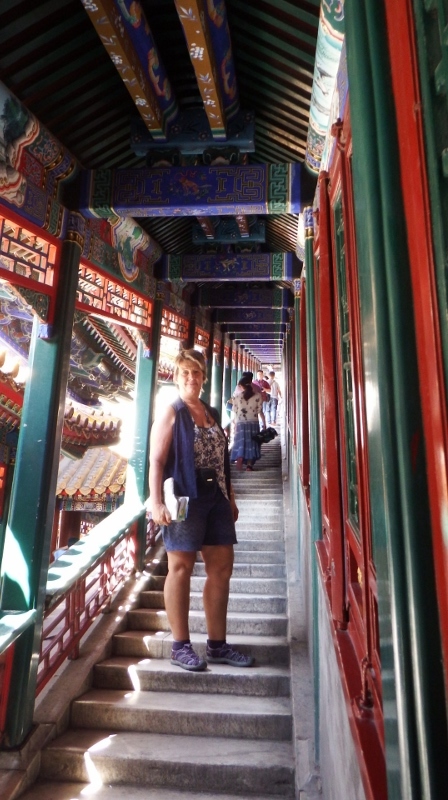 We only had 4 days in Beijing and the Forbidden city is closed on Mondays so we continued with Tuesday’s plan of the Summer palace and got back on the Metro. We were very impressed with their metro. This station is open but most of them have barriers built along the platform which don’t open until the train stops plus they are all very clean. No graffiti or rubbish anywhere. 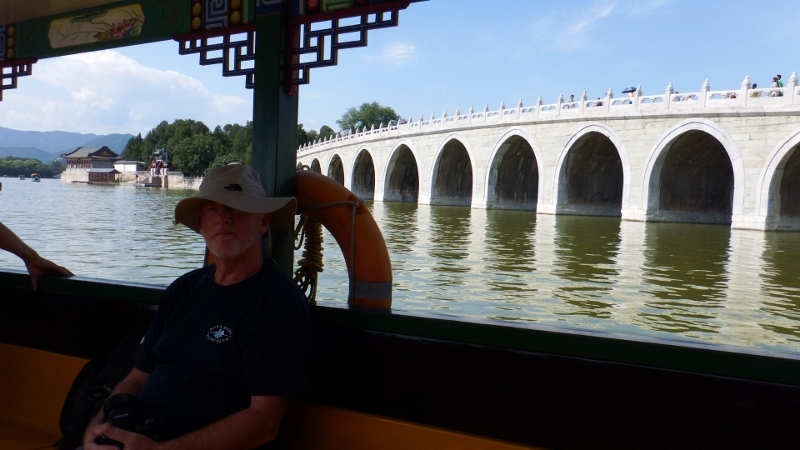 The summer palace was a way outside the city so took about half an hour to get there and cost a whole pound for two of us. 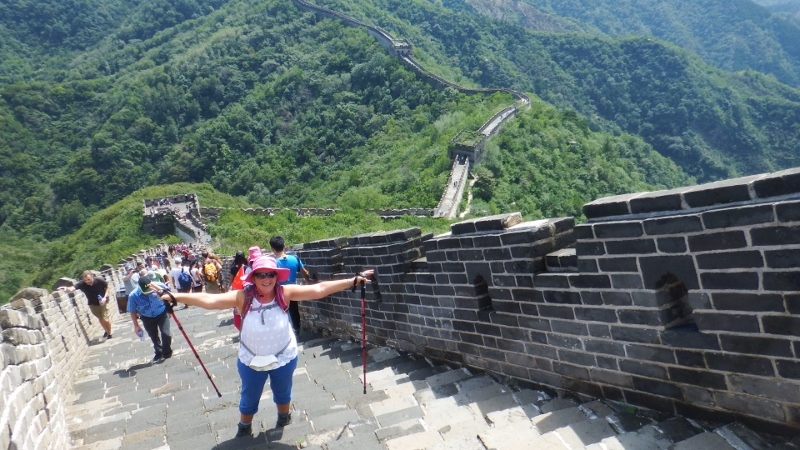 We’ve found China to be very cheap so far. 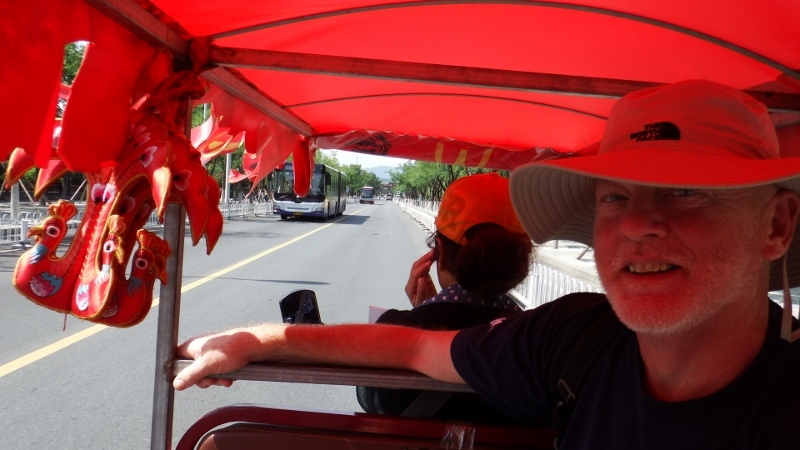 There were pedicycles waiting by the station to take us to the entrance. Not being sure how far it was we got on. It turned out to be about a KM could have easily walked it and it cost Y25 about £2.50 more than the Metro ride half way across town! Live and learn! 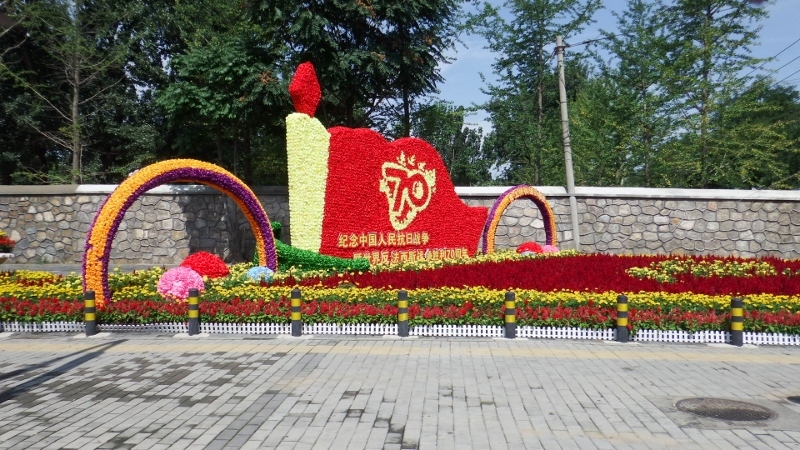 Along the street there were beautiful flower displays again as part of the city celebrations. 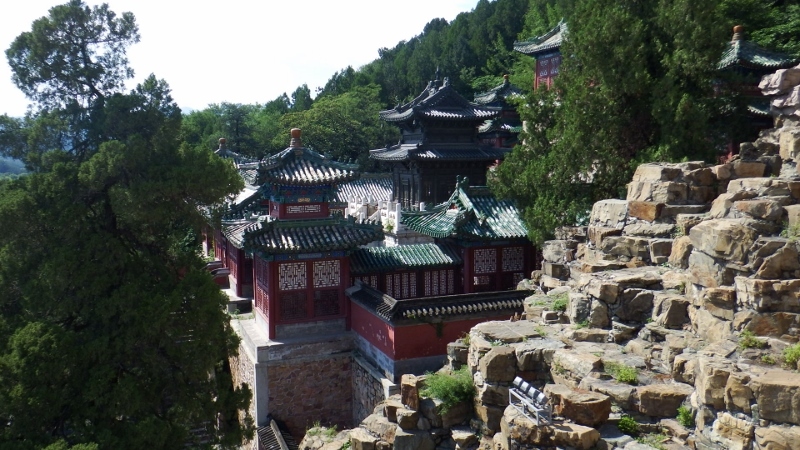 The summer palace was a former playground for emperors fleeing the summer heat. 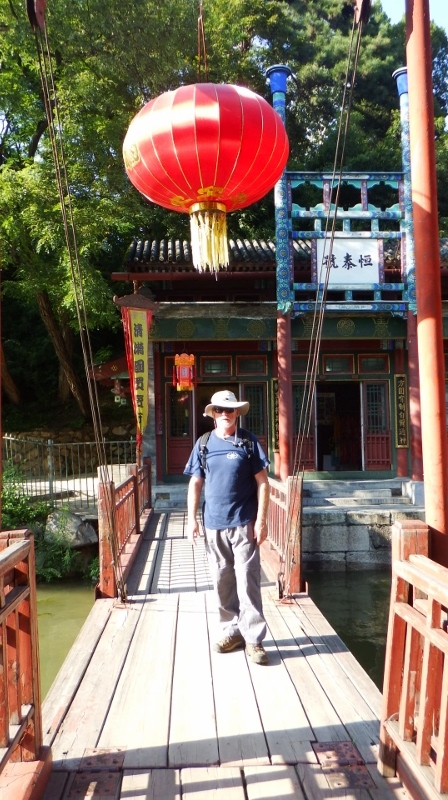 The grounds, temples, gardens, pavilions, lakes and bridges are most striking. 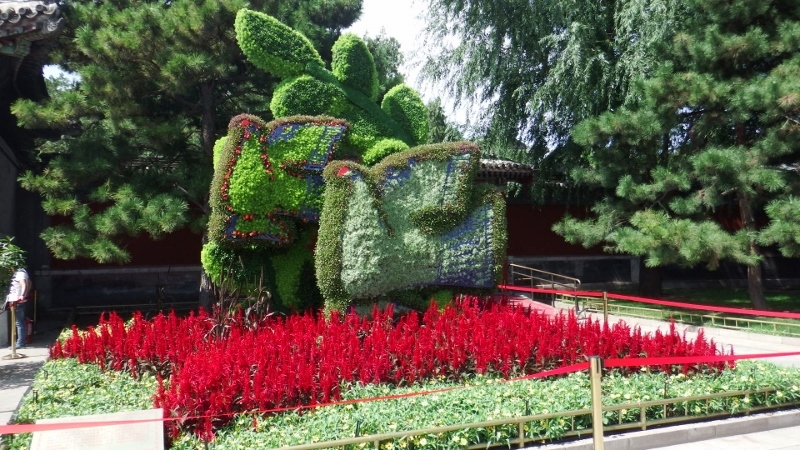 It had olng been a royal garden before being considerably enlarged and embellished by Emperor Qianlong in the 18th century. It is said a 100,000 army of labourers deepened and expanded Kumming Lake which swallows up three-quarters of the 716 acres and takes about 2 hours to walk round. 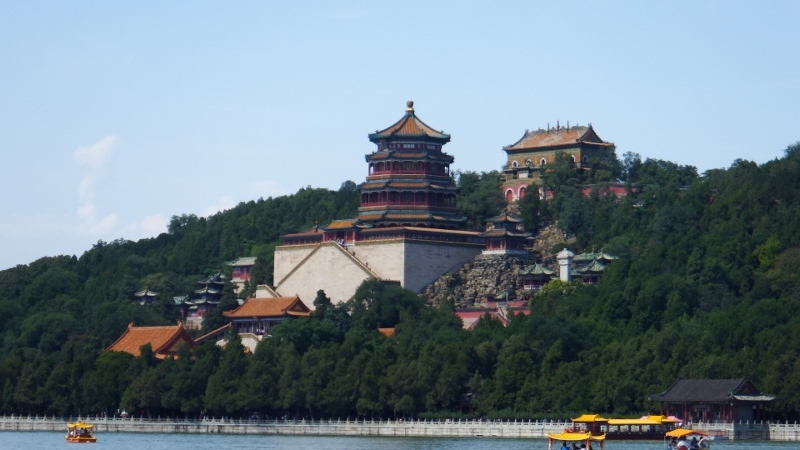 The lake is overlooked by Longevity hill topped by the Tower of the Fragrance of the Buddha along with other impressive buildings. 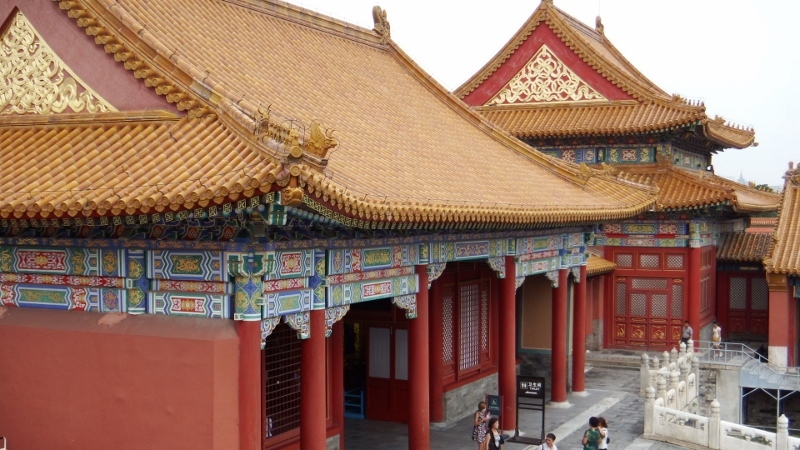 The palace has been rebuilt twice after it had been vandalised first by Anglo-French troops during the opium wars in 1856 and secondly by foreign troops who torched it in 1900 prompting further restoration work. By 1949 it had fallen into disrepair prompting a major state funded overhaul. 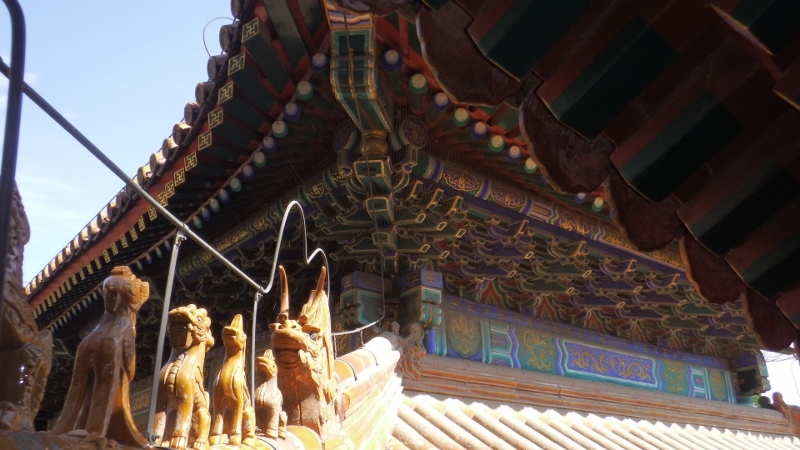 The principal structure by the east gate that we visited first was the Hall of Benevolence and Longevity (I love these wonderfully translated names) with a set of bronze animals decorating its courtyard cast during the reign of Emperor Qianlong which includes the mythical kylin. 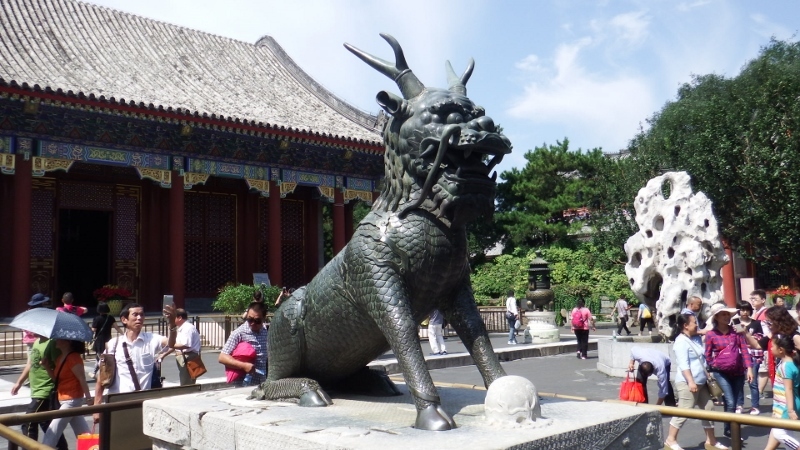 The kylin was an auspicious legendary animal that had the power to punish evil and repel the wicked, it has a dragon’s head, lion tail, ox hooves, deer antlers and scales all over its body. Please note the amount of people around, it’s impossible to get a photo without someone in it. 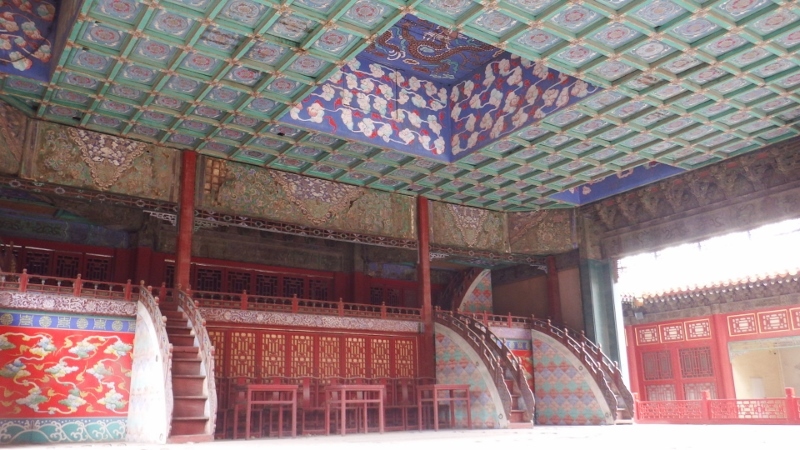 We moved onto the Garden of Virtue and Harmony which was a three-story building that had served as a theatre where the court’s 348 member opera troupe entertained the emperor who watched from a gallery opposite. 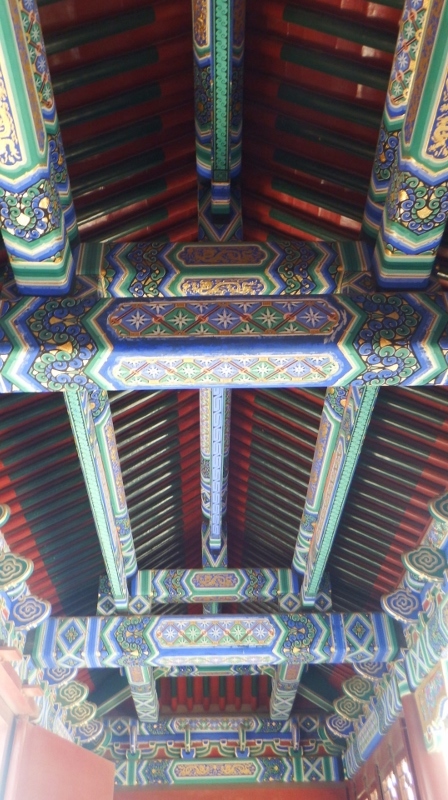 The restoration of the decoration around the eaves was superb. This is the major stage on the ground floor but there was also a second stage on the floor above as well as trapdoors above and below the stages. There were private boxes around the courtyard for various dignitaries to watch the show. It must have been a spectacular scene. 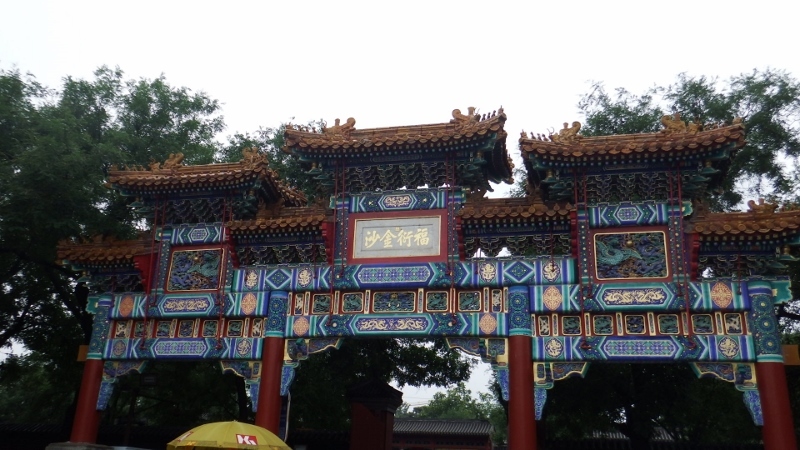 We walked around part of the lake to South Lake island which had this wonderful entrance gate. 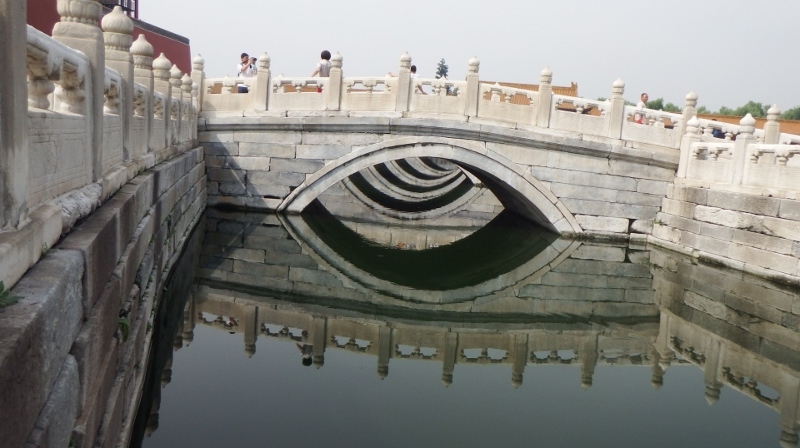 A graceful 17-arch bridge spans the 150m to the shore. 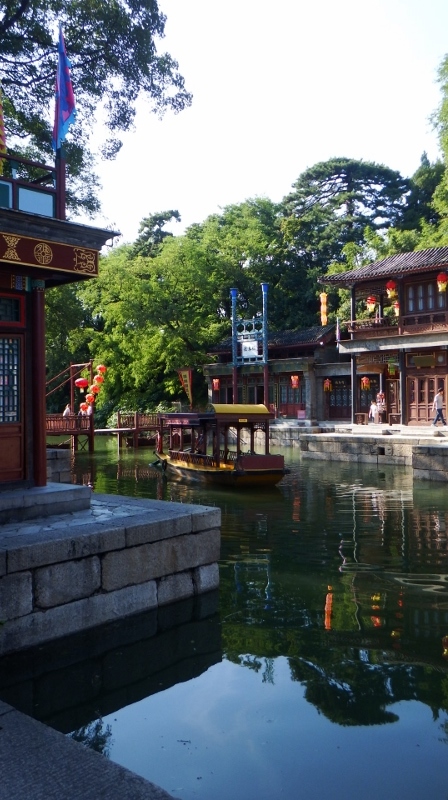 The island houses the Dragon King temple which again had been beautifully restored. 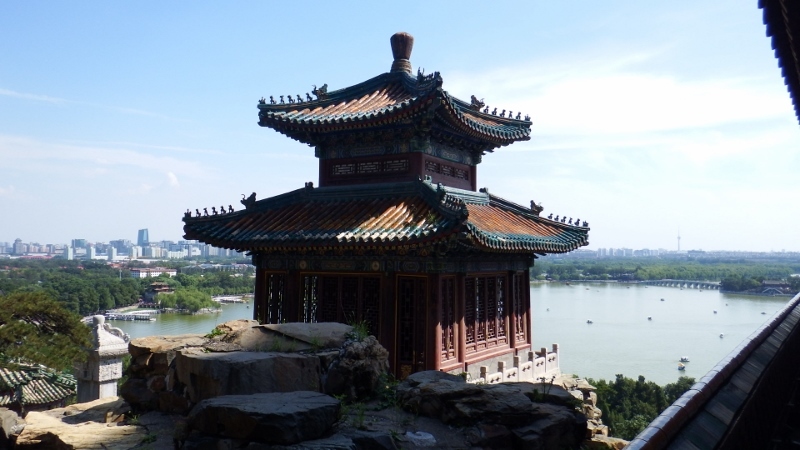 As we had arrived late there wasn’t time to do the two hour circumnavigation of the lake so we hopped onto a boat that took us diagonally across the lake to the Imperial boathouses giving us this wonderful view of Longevity hill as we passed it. 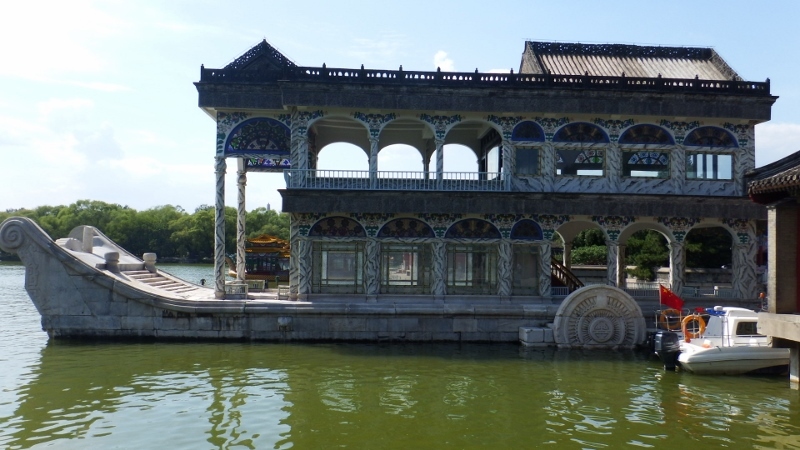 In front of the boathouses was this magnificent marble ‘boat’. The Empress Dowager Cixi, a right little madam by all accounts, paid for this extravagant folly with funds meant for the modernisation of the Imperial navy at the end of the eighteenth century but she squandered the money and this was the only vaguely nautical thing that she spent it on. 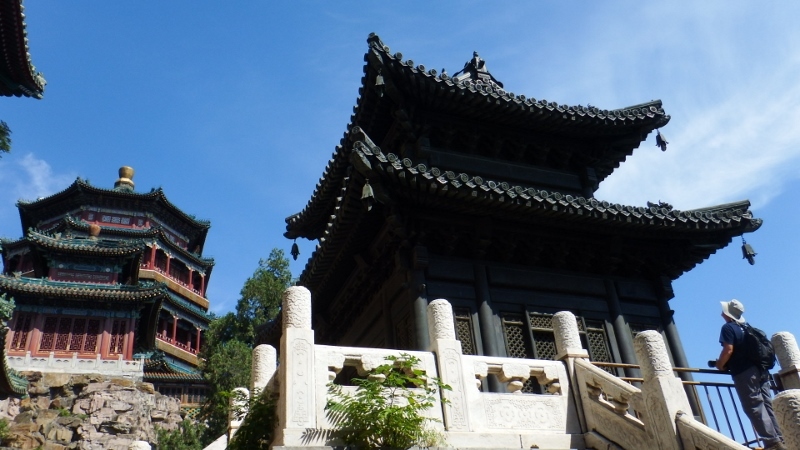 After walking along the fore shore we arrived at Longevity hill with its slopes and crest adorned with Buddhist temples on a north-south axis. 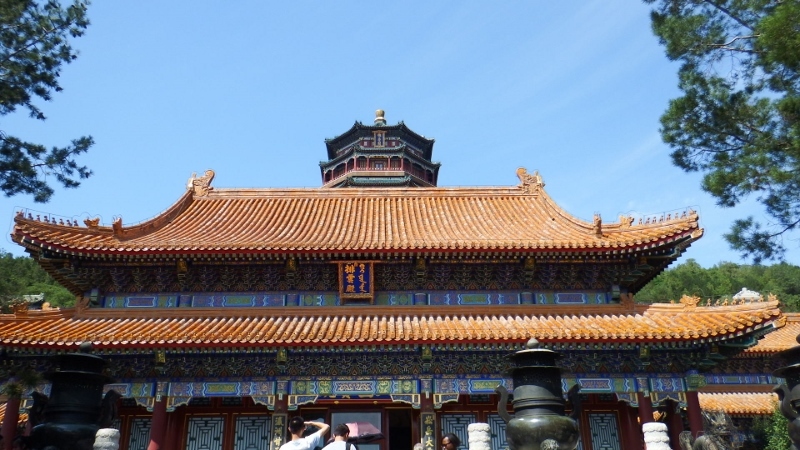 As with many of these temples the lower part is square and the upper part is round in accordance with the notion ‘Tianyuan Difang’, ‘Heaven is round, Earth is square. The first building you enter is the Hall of Dispelling clouds. The original construction here was the Hall of Great Buddha of the Temple of Immense Gratitude and Longevity in the Garden of Clear Ripples – what an amazing address, which was burned down by the Anglo-French allied forces in 1860 and this building was constructed on the same site to celebrate one of Empress Dowager Cixi’s birthdays. Bearing in mind its title this cloud formation, which appears to be coming off the roof, looked very striking. After the hall the steps start. To get to the top there are a lot of steps. The lower steps were covered protecting you from the sun or the rain. 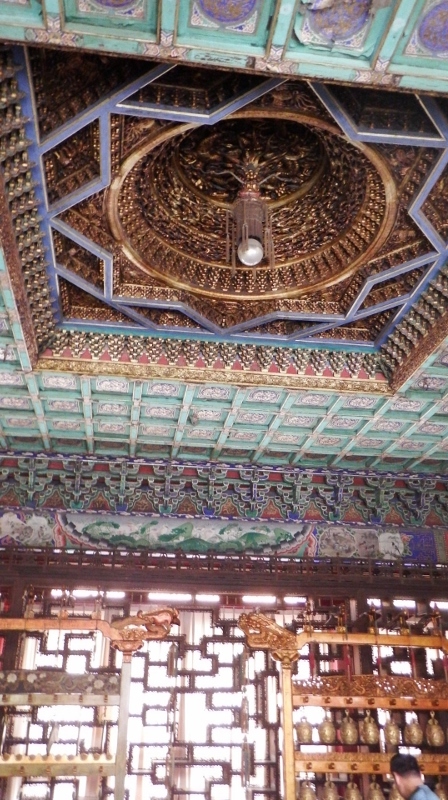 The rafters under the roof are covered in a plethora of paintings. You can see in this photo how the steps climbed up the side of the building to the next temple and continued up behind it. 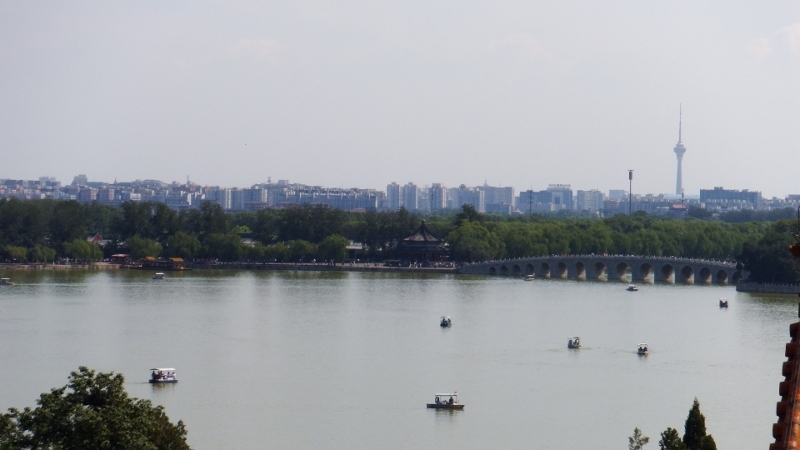 The view from the top was amazing looking back across the lake to the Seventeen Arch bridge and the city beyond. 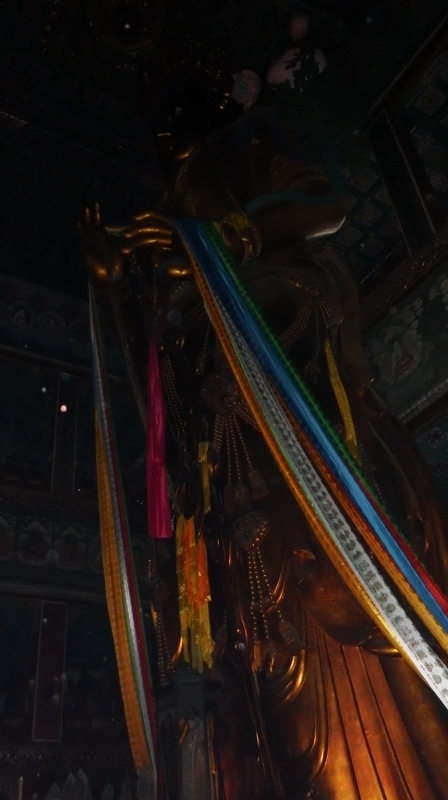 The crowning glory was The Tower of the Fragrance of the Buddha. It was gloriously painted and impossible to get into a single photo. 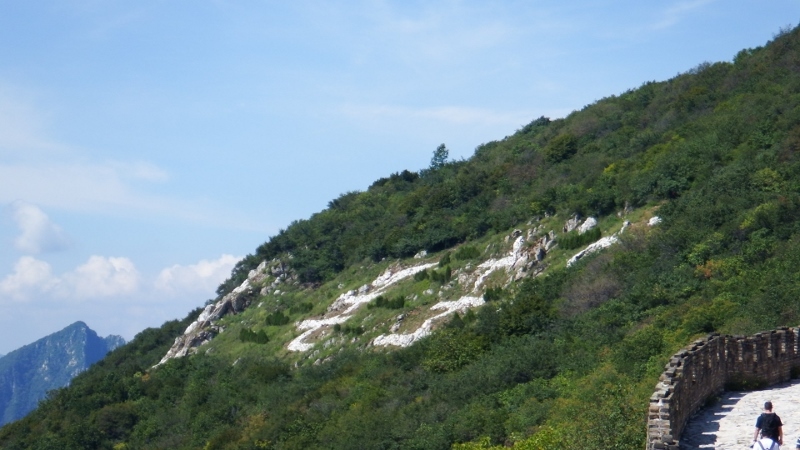 The side of the hill is adorned with little Buddhist temples all exquisitely painted. The attention to detail was amazing. We had had some discussion about the row of doggies along the roof because Bill said they were dragons. Further round the temple looking across at the roof we could see some others and they were indeed dragons – I still think it would be nicer if they were doggies! Look how the eaves are painted, just stunning. We sat and got our breathe back while admiring the buildings. There were more beautifully painted cloisters surrounding the tower. We stepped into the tower to admire the frescoes although photography wasn’t allowed and it was a bit dark inside. The whole scene was just stunning – all for one emperor. After about half an hour we made our way back down. 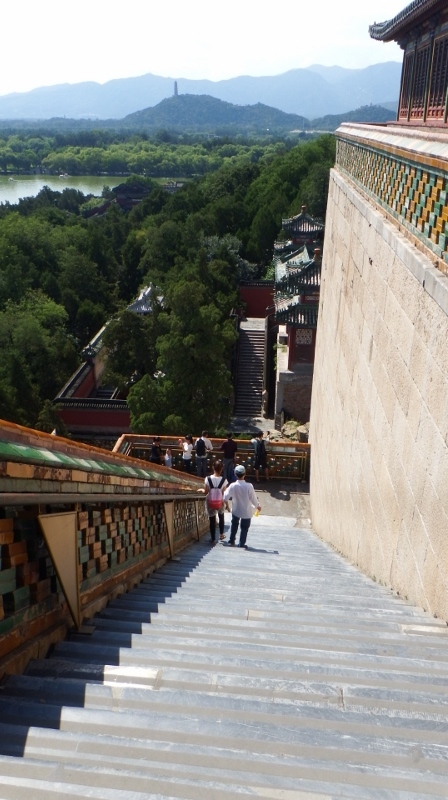 The steps were numerous and steep. On our way down Bill spotted another set of little temples but this time there was something extraordinary in the middle. 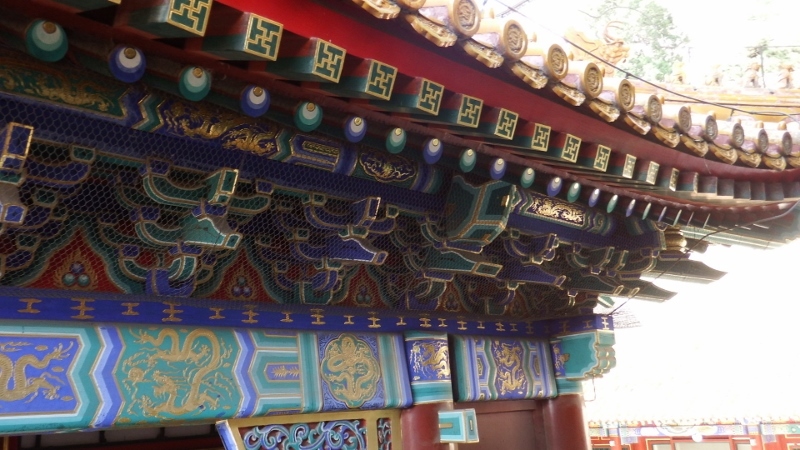 This entire temple is made from exquisitely detailed cast bronze. Bill was fascinated by it. He thought it would have been cast in sections and assembled on the site. Goodness knows how much it weighed or, more importantly, cost! A lot on both counts. There wasn’t any information of it’s origin or use but for Bill it was his favourite of the day. 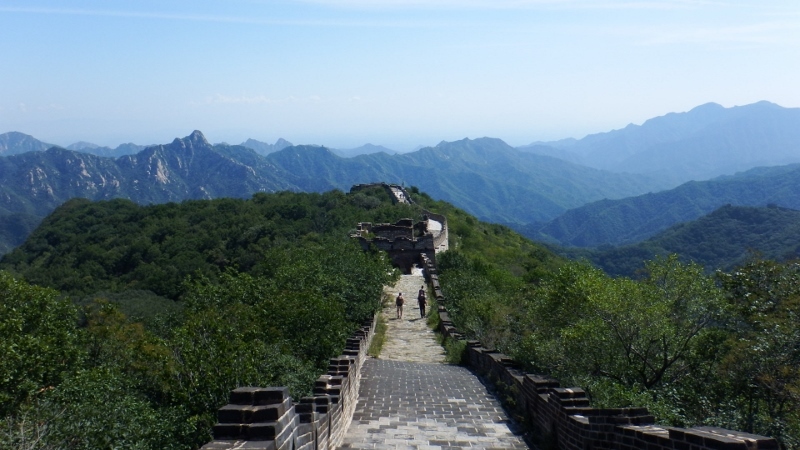 After reaching the bottom step we made our way towards the north of the park. This was a good sign! 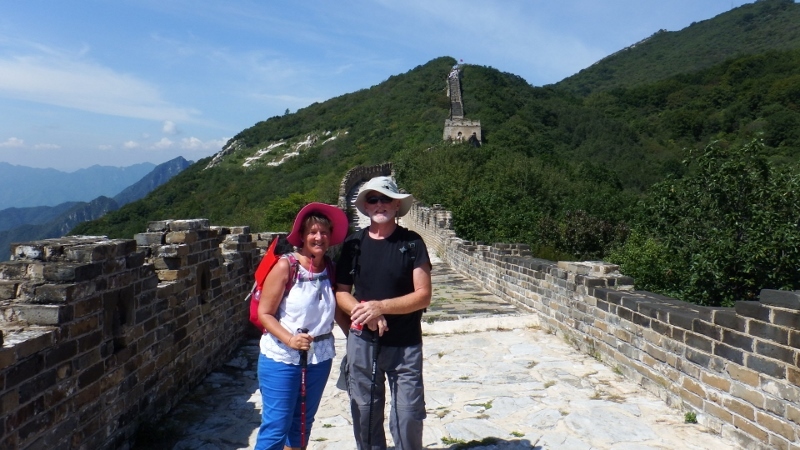 We walked along the west causeway towards the delightful hump of the grey and white marble of the Jade Belt bridge. It crosses the point where the Jade river enters the lake . It dates from the 18th century and must surely have some stories to tell of the people who have used it and been photographed on it. Continuing towards the north palace gate our final walk took us onto Suzhou street. 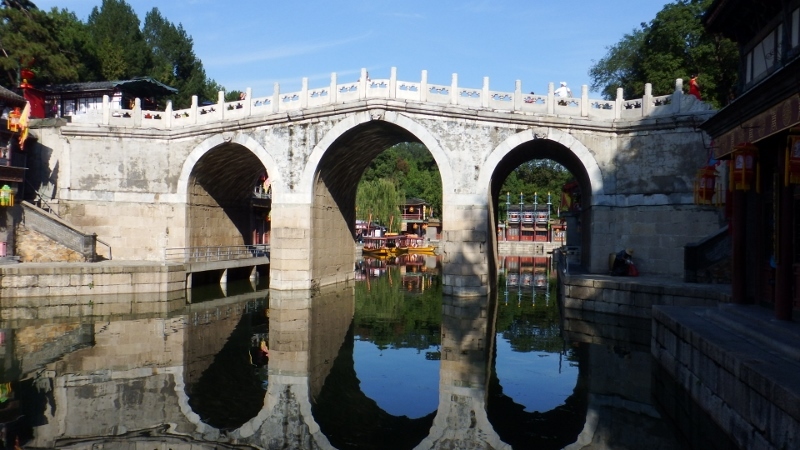 An entertaining diversion of riverside walkways linked with quaint bridges where Emperor Qianlong and his concubines would shop. Today it houses souvenir stalls but was very picturesque in the sunshine. 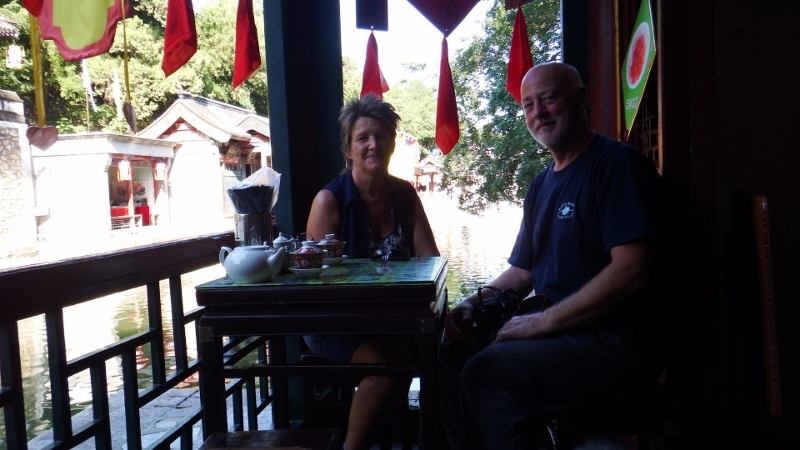 We stopped for Chinese tea which turned out to be the most expensive tea in all of China, literally! We’d had a wonderful day. 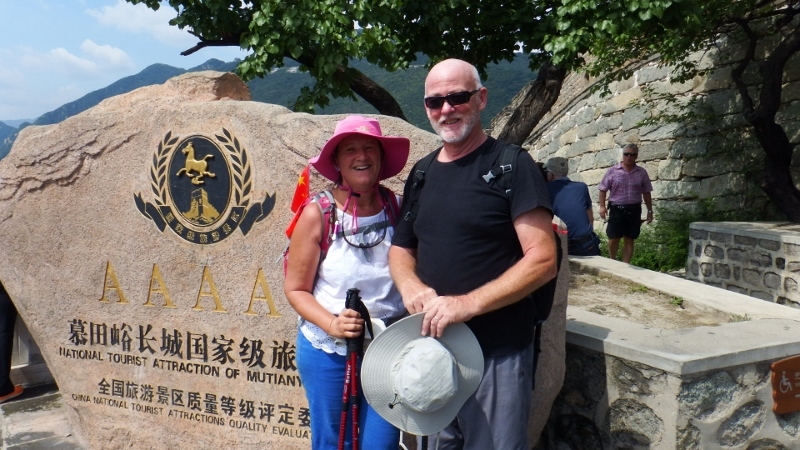 There are a number of other sites in the area such as the Botanic gardens and the Fragrant Hills park and I believe the tours visit all three in an afternoon but we prefer to spend more time enjoying one site rather than rushing around them all. 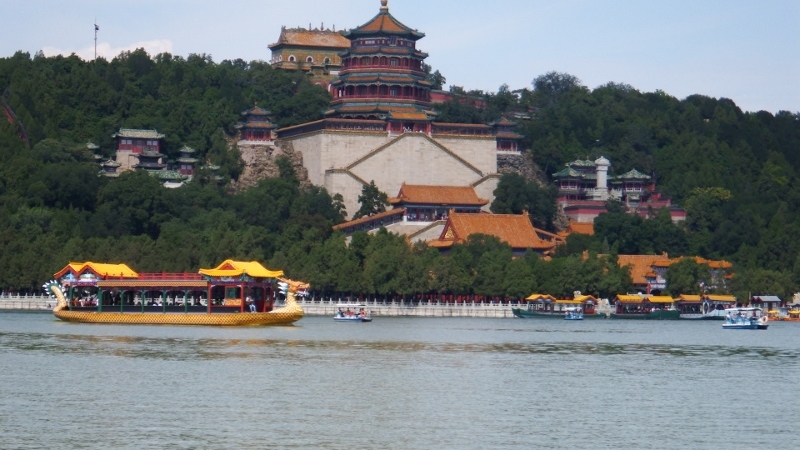 If you visit Beijing I would recommend the Summer Palace as a must see. 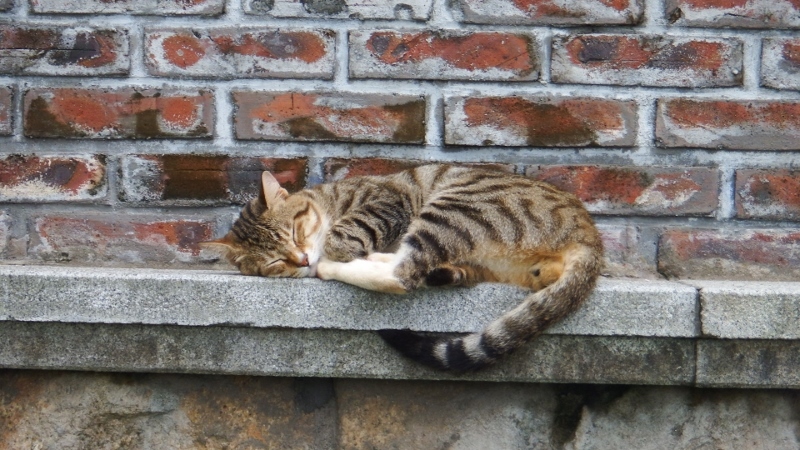 A day is better but an afternoon is possible. From the north gate we walked back to the Metro station and headed back into the city. 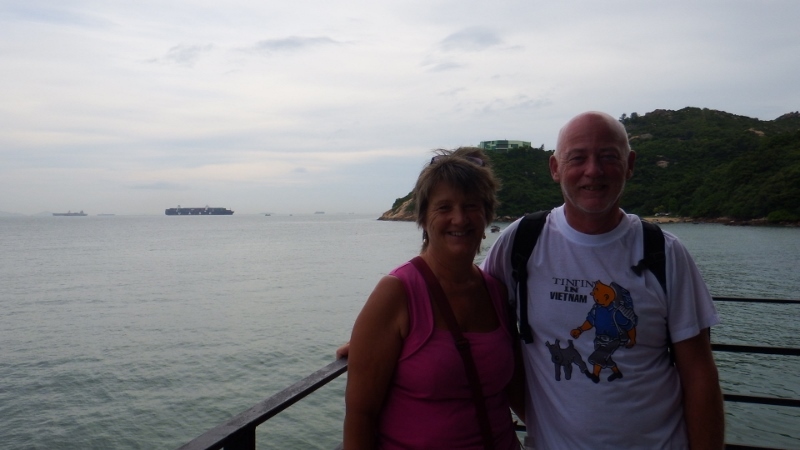 We are back on the boat now and have moved her down to Tioman to meet up with Bill’s sister. 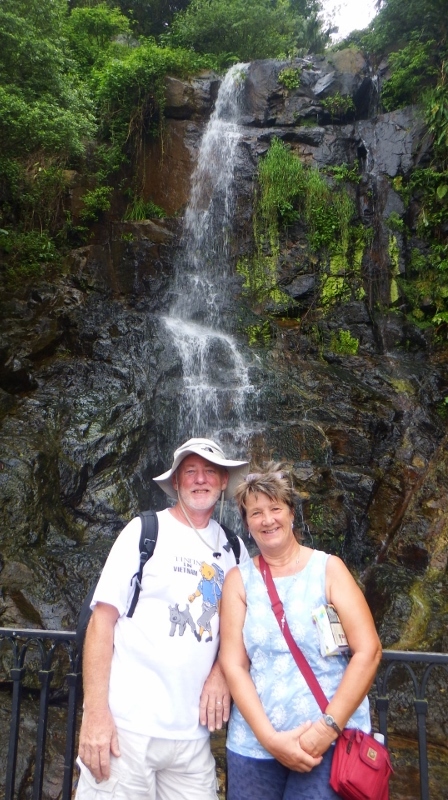 We are up against our usual problem of lack of signal but I want to start uploading my blogs. 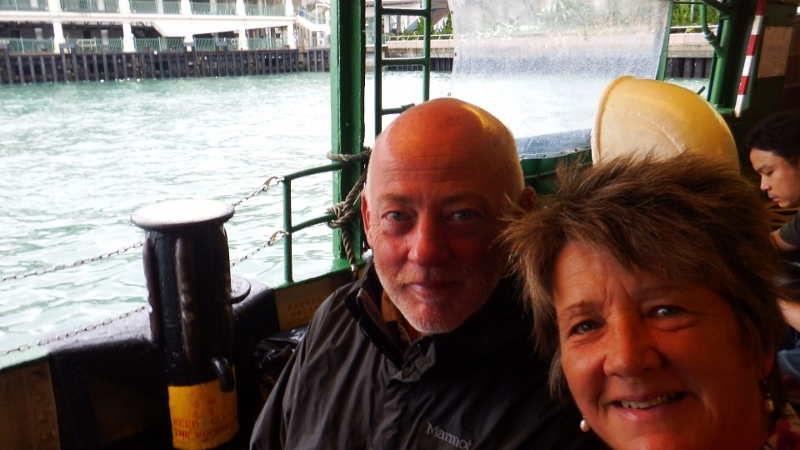 So going back to the end of Hong Kong…..
We spent our last morning in Hong Kong packing although finally the sun had come out. I wanted to run round and take photos of all the sights in the sun but it wasn’t practical. 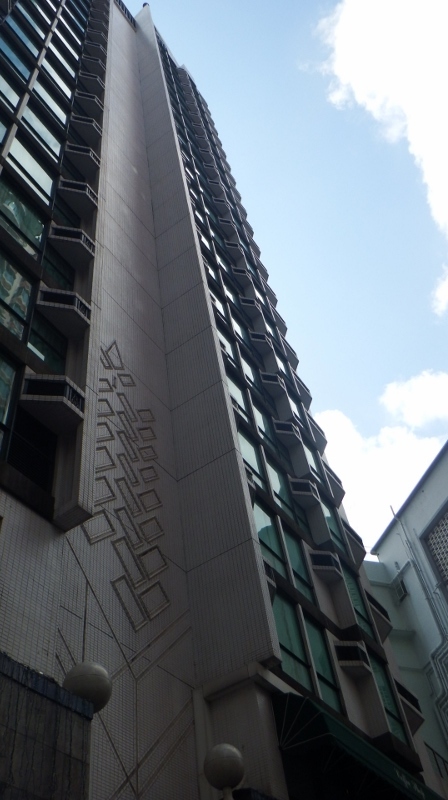 We had stayed in the Bishop Lei Hotel up in the mid-levels. It was a short walk from the top of the escalator system that goes up through the mid levels and was quite close to the nice eating area of SoHo. Having been recommended to us I would continue the recommendation but with the following comments. The staff were helpful although a little formal. Our room was on the 21st floor, which felt a bit strange being that high up. The rooms are quite small but clean, the bathroom was very nice. It was quite expensive at £260 for 4 nights but I wanted to be near the city centre and it’s difficult to find anything cheaper. We hadn’t paid the extra for a front room with a view and I believe they are bigger but it would have been a waste because we were only there in the evenings. There’s a bus stop outside the front door. It has a pool but it’s small so we didn’t bother. We also didn’t bother with the breakfast at £10 a head for bacon and egg, toast, juice and coffee, extra for French toast or fruit, there are much better value places in town but on the whole we liked it there and I would stay there again. 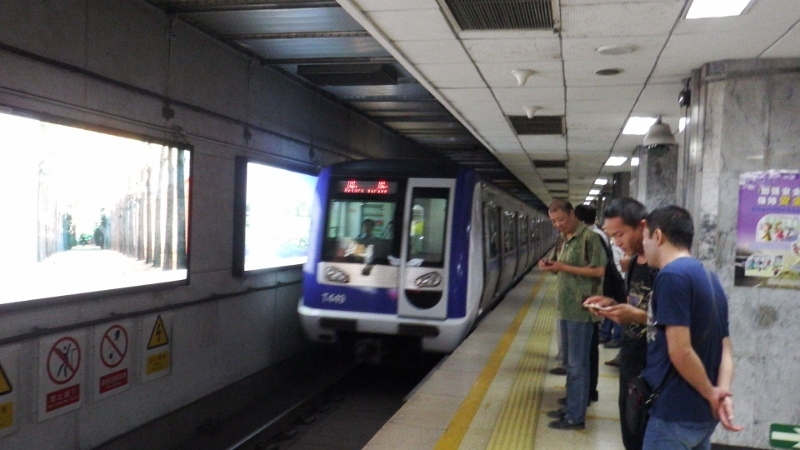 Our flight was leaving at 1.20pm and we had to get the airport express train. 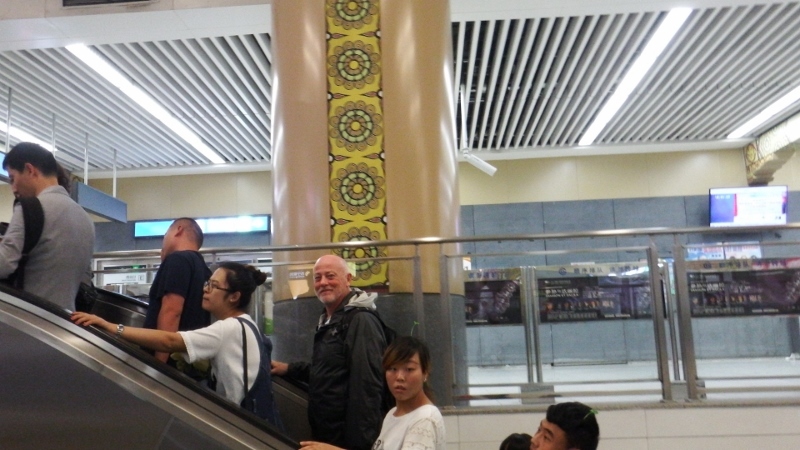 Fortunately the Bishop Lei runs a free shuttle bus to the entrance of the underground system that leads to the airport express (as well as one to the downtown area) and we caught the 10.00 and made our way to the airport. 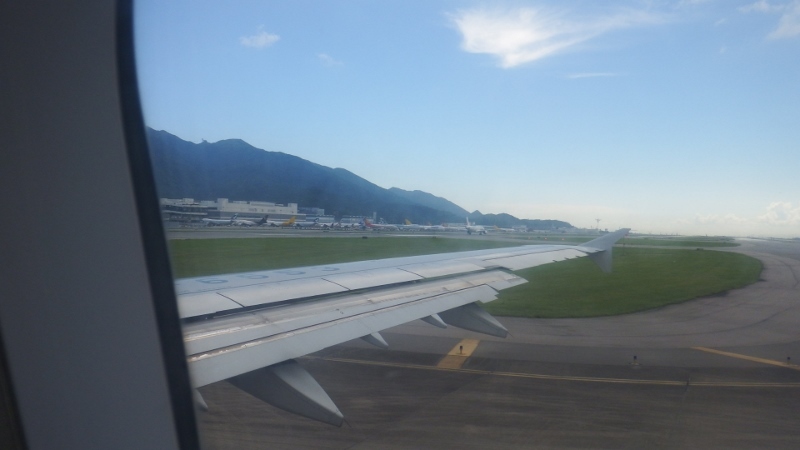 Everything went smoothly until we got on the plane. Everyone was on board, the doors were shut, we were ready to leave on time, the plane was pushed onto the taxi road and then nothing, we sat there and we sat there. The pilot moved the plane twice to different parts of the airport and each time we thought we were off but then we sat there again. An hour and a half later we finally took off, we think the air traffic controllers forgot us. 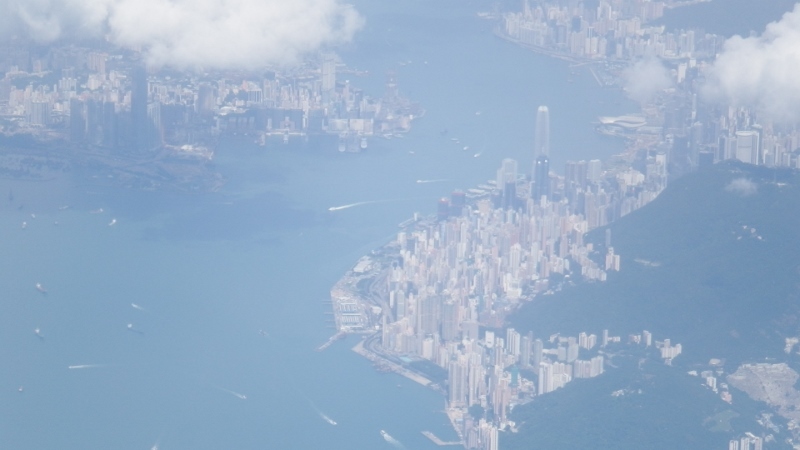 The plane banked round and flew over Hong Kong, I managed to get some good photos of the city. 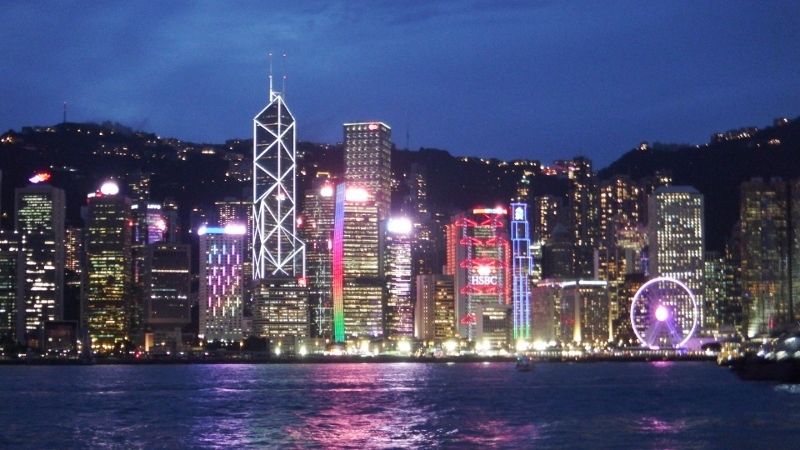 As China and Hong Kong are in the same time zone as Malaysia jet lag hasn’t been a problem. The plane landed in Beijing just after 6pm and it was RAINING. The cloud cover was so bad that we didn’t see the airport until the last minute. 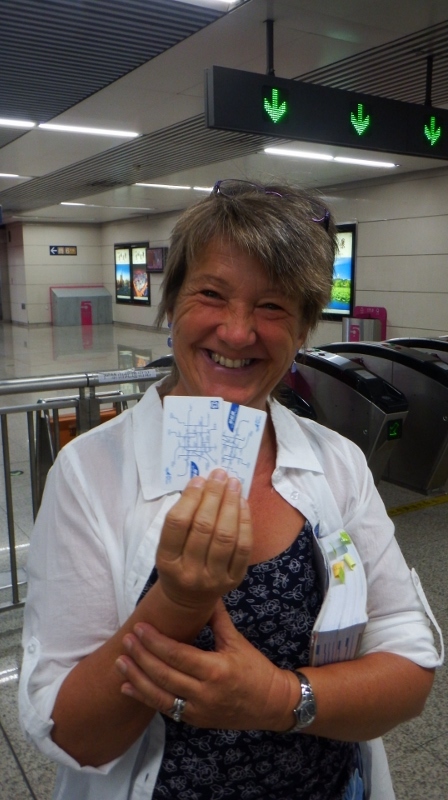 I had memorised the train route to the hotel but as it was late AND raining I reluctantly agreed to take a taxi to our hotel. I felt it was cheating. 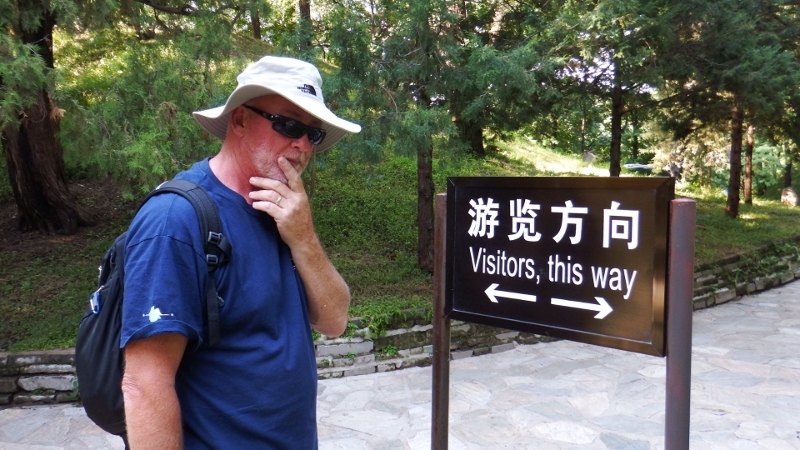 I had printed everything for China for the visa application and bookings.com supplied the hotel name in Chinese so after showing this to the taxi driver he put it in his gps and off we went on the next part of our adventure. 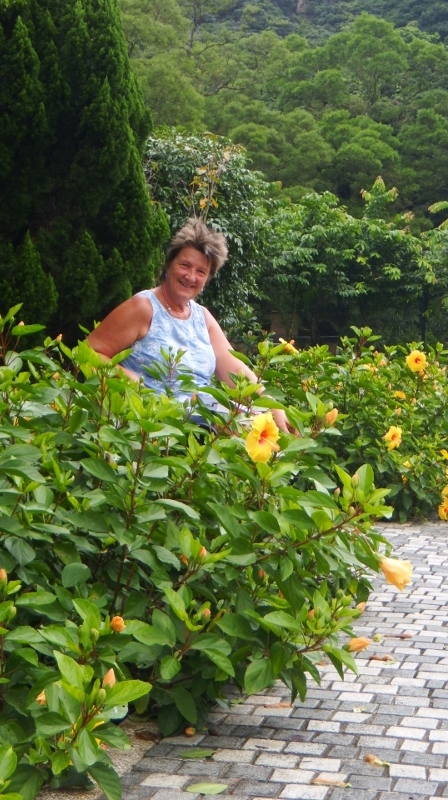 As today is our last day in Hong Kong we were going to try and mop up the things that we’ve missed. It was still cloudy, I’m going to get SAD syndrome if I stay here much longer, but it wasn’t raining so it was the Peak tram first. Having been there once already we knew the way and walked straight down there. The gates were open – we were in luck. There a good display in the entrance of the workings. 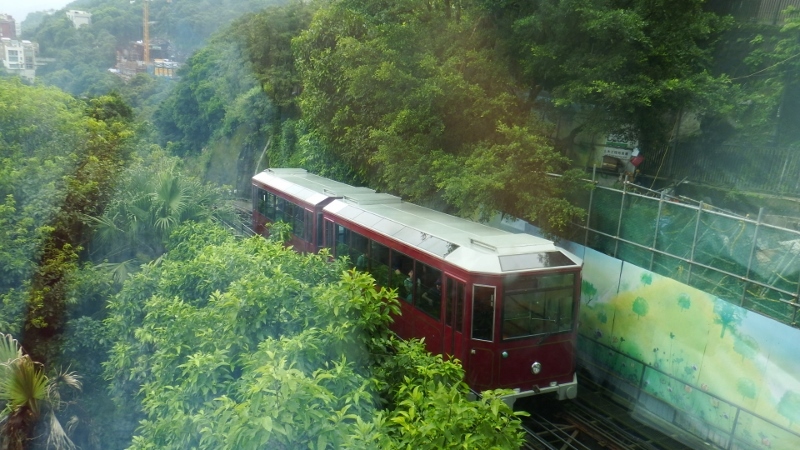 The gravity-defying Peak tram was the first funicular railway in Asia and has trundled up the side of Victoria peak at a steep 27˚ incline for over a century. The tram arrived and we jumped on. 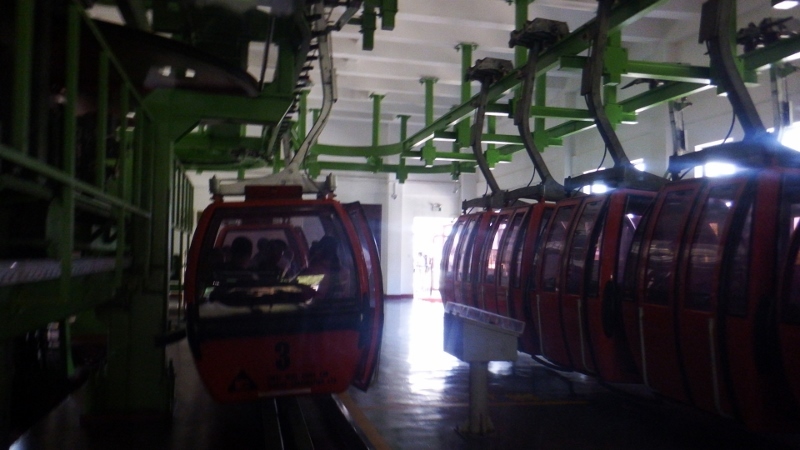 There isn’t any where for the tram to turn round so you face forwards going up and the driver walks to the controls at the other end of the tram. We got in behind a tour and they had all the seats on the right hand side but the left looked over the woodland on the way up. We hadn’t had any breakfast so sat in the Pacific coffee lounge and watched the tram go back down again. After breakfast we were ready for our walk and started off on the well signposted Peak circuit which is a flat 2 mile circuit giving breathtaking views over Victoria harbour and the city skyscrapers. It was a bit hazy but not bad for the time of year. 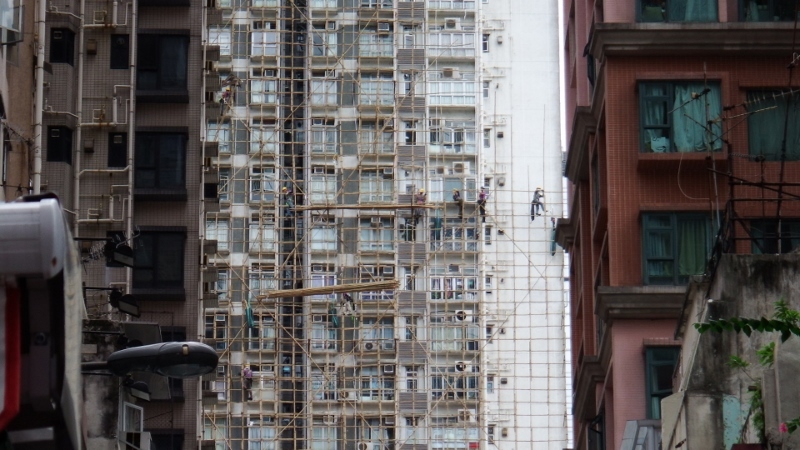 Bill was fascinated by this building, not sure if you’ll be able to make it out but it’s entirely clad in bamboo scaffolding. 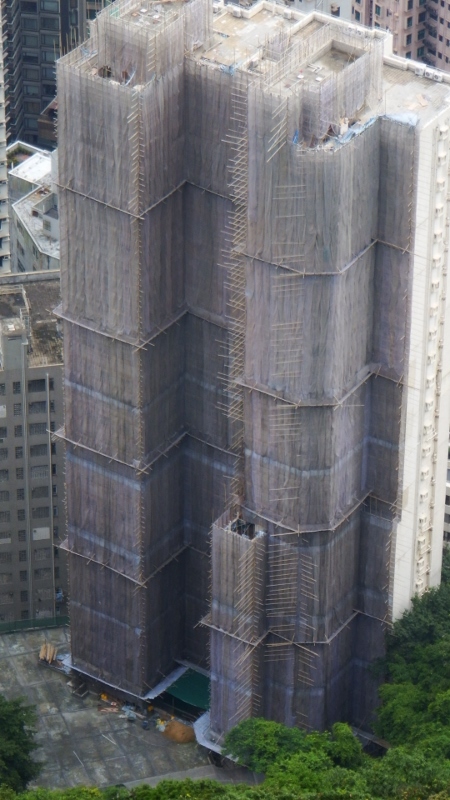 It has netting around the outside to contain any debris but as these building are 30 or 40 stories high it seemed amazing that they had used bamboo. 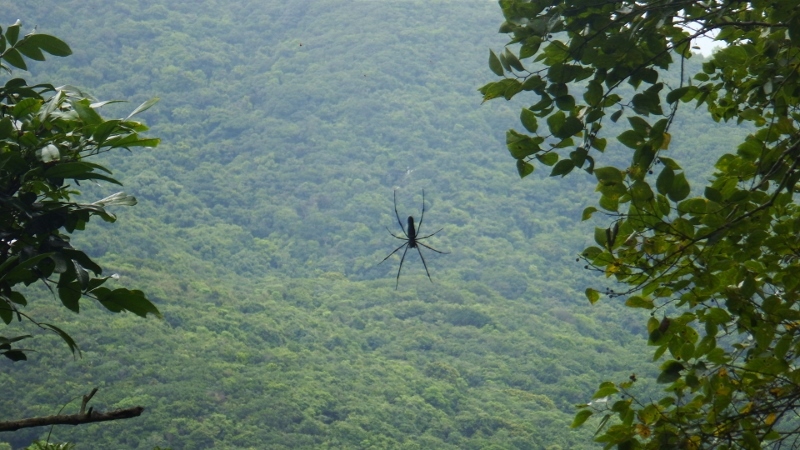 and this huge spider had spun his web next to the waterfall. It was easily the size of my hand, not nice. 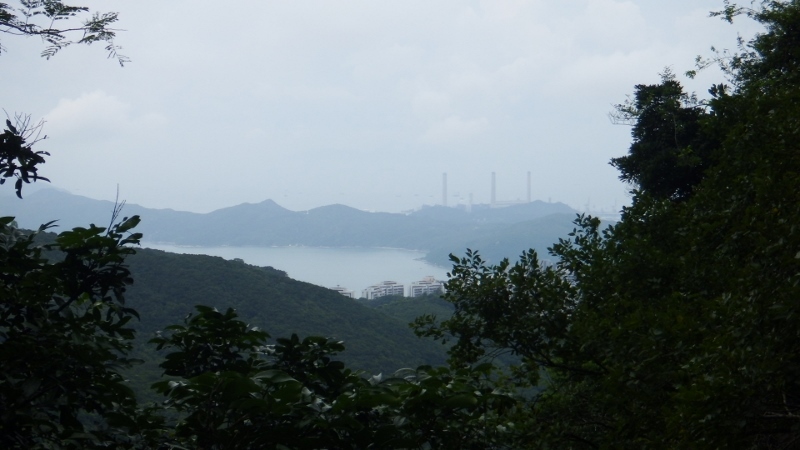 The circuit gives views over the islands south of Hong Kong island that we could just see over the trees. 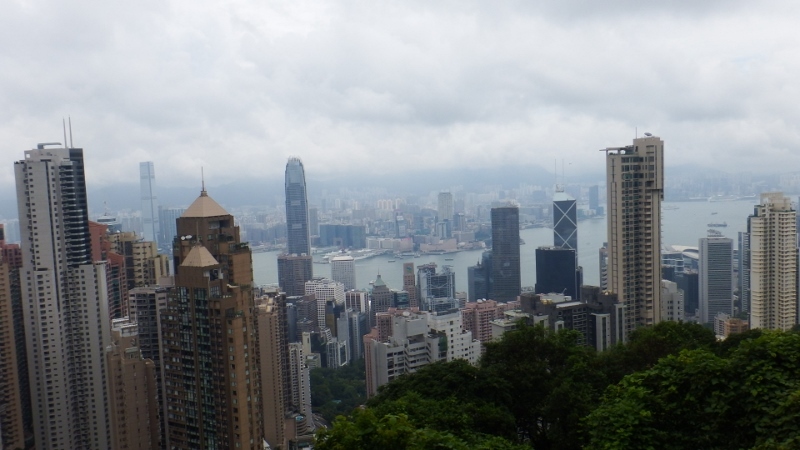 A steep trudge towards the summit leads to Victoria Peak gardens that were once part of the Governor’s lodge. 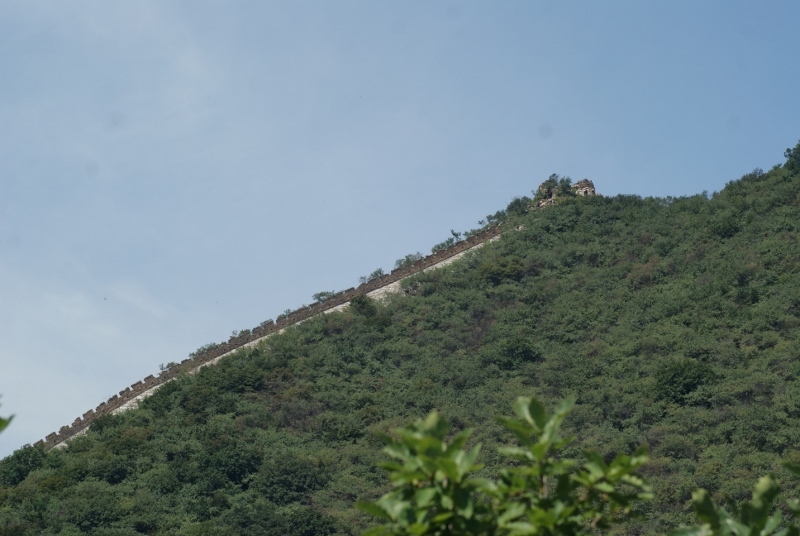 Sadly the summit is fenced off and has an array of phone masts on top of it. It was very peaceful up there and decidedly cooler than the city with a nice breeze blowing through. This puss cat was enjoying the sunshine. 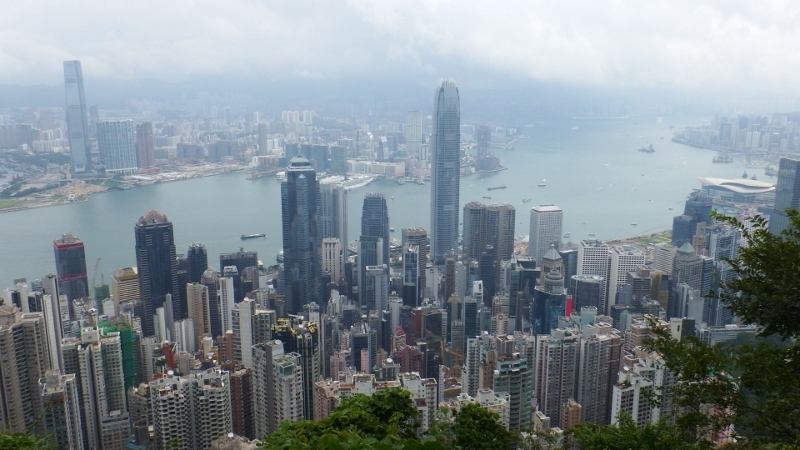 As the weather was hazy and we were a bit short of time we decided not to visit the Peak tower which apparently gives good views of the city. After doing the walk we felt that was the best view. There was another great view out of the window going down. 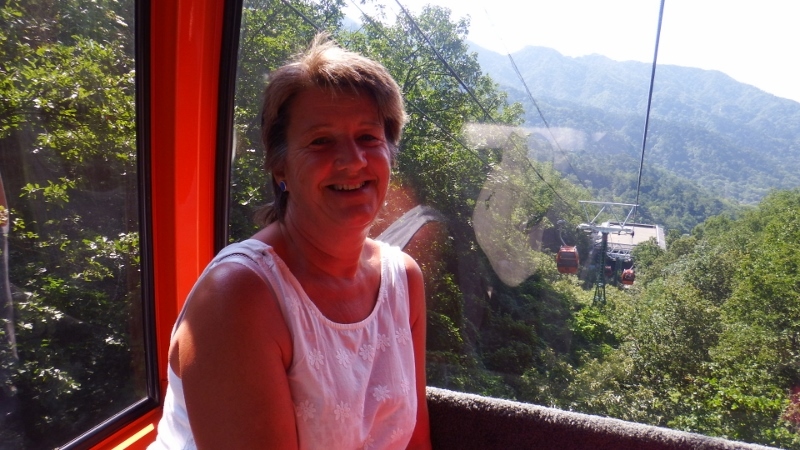 You travel backwards going down the hill but we managed to get the front seat and watched the tram descend the hill. It’s difficult to see how steep it is but you could feel the gradient as we traveled down. Once back down again we looked for some lunch which isn’t always easy in Hong Kong. Many of the malls along the water front either don’t have any where to eat or they were way over our budget. Eventually we found somewhere after what felt like ages. Once back out again I wanted to walk around the banking district because some of them have viewing floors but sadly it was a bank holiday for the 70th anniversary of VJ day and they were closed. 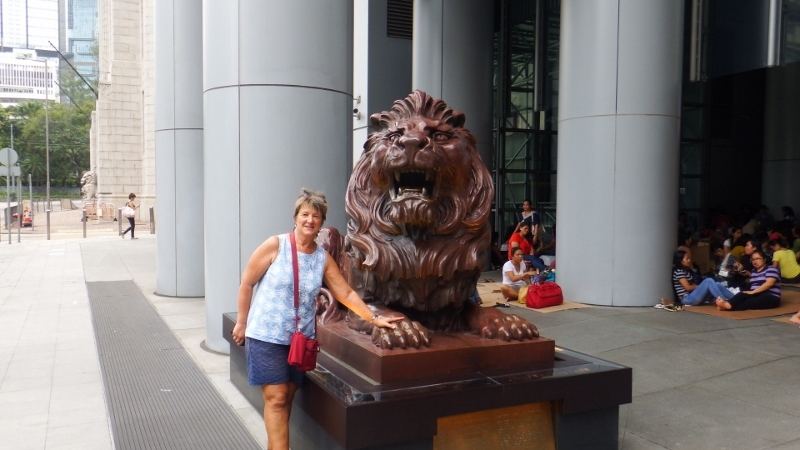 I rubbed the lions paw outside the HSBC building for luck and then we moved on. 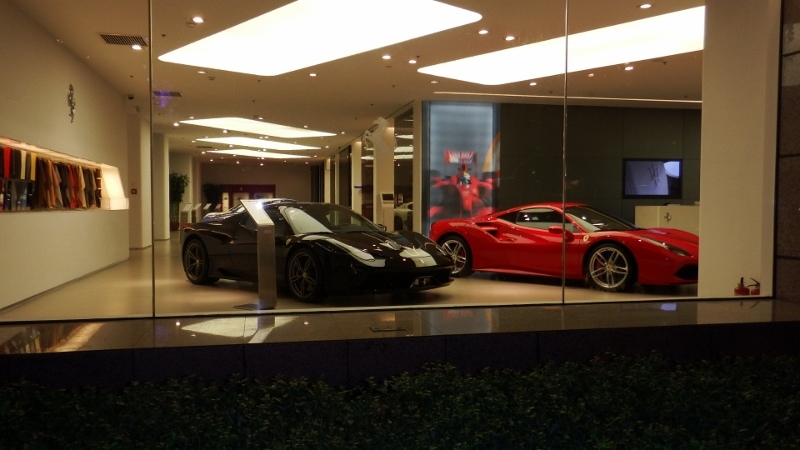 The Landmark is a very expensive mall with very expensive shops in it but it was interesting looking in the windows. 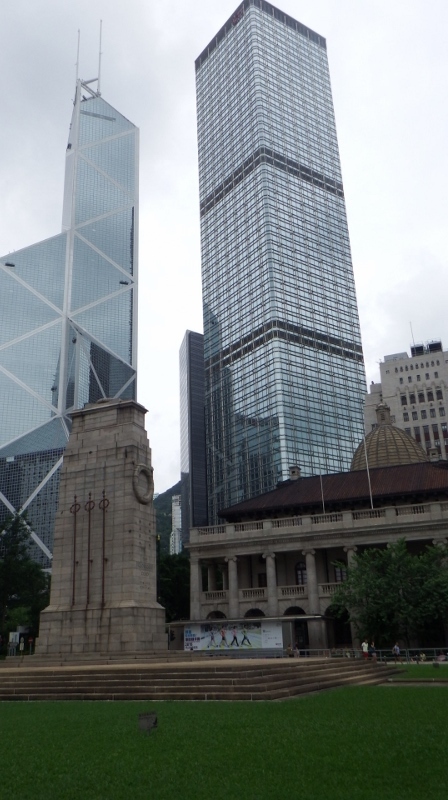 We walked through Statue square and passed the neo-classical Legislative building with the Hong Kong cenotaph in front of it. It’s difficult to photograph these building close up because they are so tall. The building to the right is the modernistic but feng shui-friendly girders of the HSBC building. 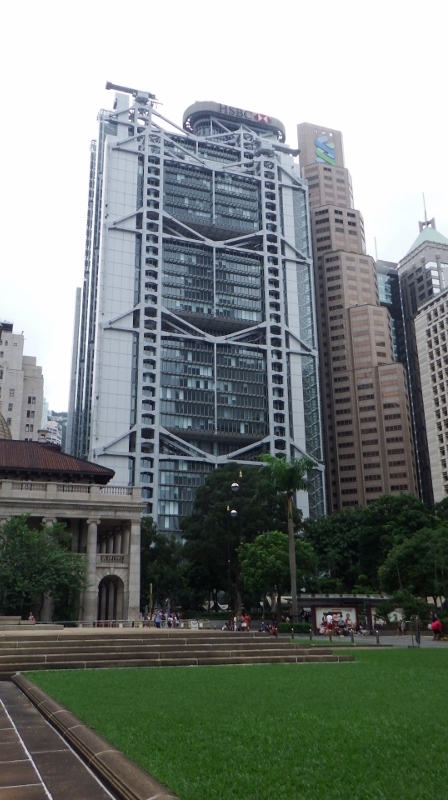 Designed by Bristish architect Sir Norman Foster and completed in 1985 it was one of the most expensive buildings of the time costing more than HK$5 billion. 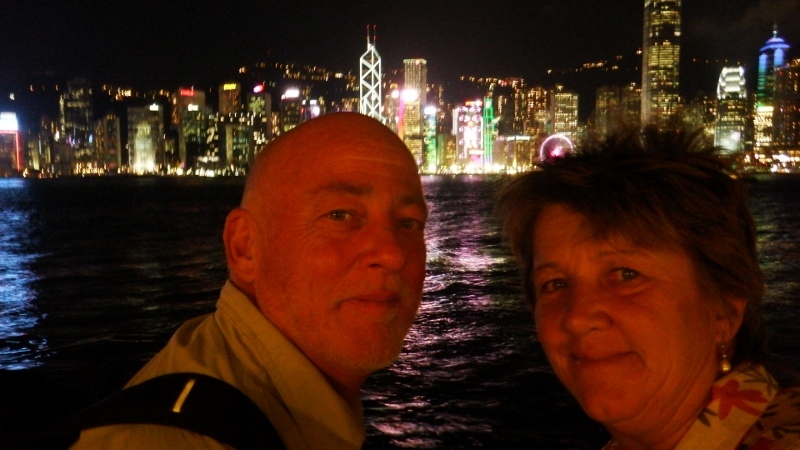 Our time in Hong Kong was coming to a close and tomorrow we fly to Beijing in China. There is a lot to see in and around the city and I feel we will have to come back. 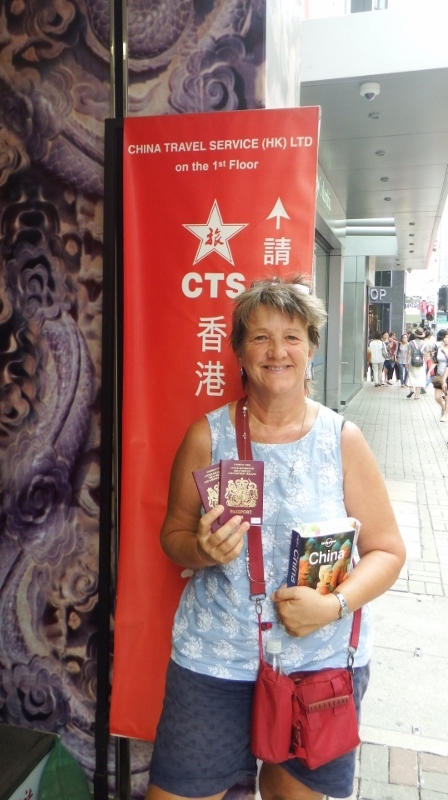 The last job of the day was pick up our passports from the China Travel company with our Chinese visas in them. I had been nervous all day in case there was a problem but they were ready and waiting for us. So tomorrow it’s China here we come. 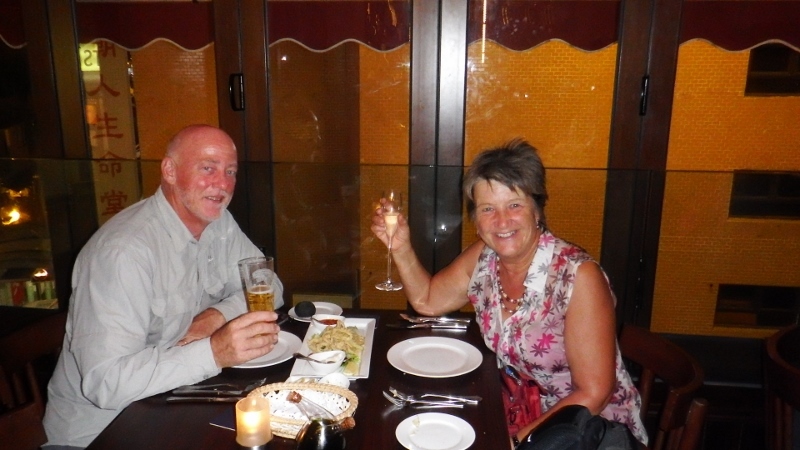 Wednesday 2nd September was our 37th wedding Anniversary. I had planned our trip around this date and the plan for the day was to take the Star ferry to Kowloon, walk along the Tsim Sha Tsui promenade, visit the Hong Kong museum of history, visit the Wong Tai Sin temple, tea at the Peninsular hotel, visit the jade market and the Temple street night market. Seems like a lot but they were all fairly close together but we woke up to this. Grey skies and pouring with rain. We sat in our hotel room wondering if we should revise our plan but it would be difficult to change things now. Any way we’re British and a bit of rain hasn’t stopped us in the past and it wasn’t going to start now. Luckily the bus for the ferry stopped right outside our hotel so we jumped on. The Star ferry was started in 1898 by a gentleman called Mr Dorabjee Nowrojee. At that time the only people allowed on the first class upper deck were Europeans and a collar and tie was mandatory. These days any one can enjoy the 10 minute journey and at $2.50 a little over 20p, it must be the cheapest cruise in the world. The present 1960’s fleet are still berthed in the same fashion with a hemp rope being caught by a billhook. The ferry has two entry points without a public stairway between the two floors. 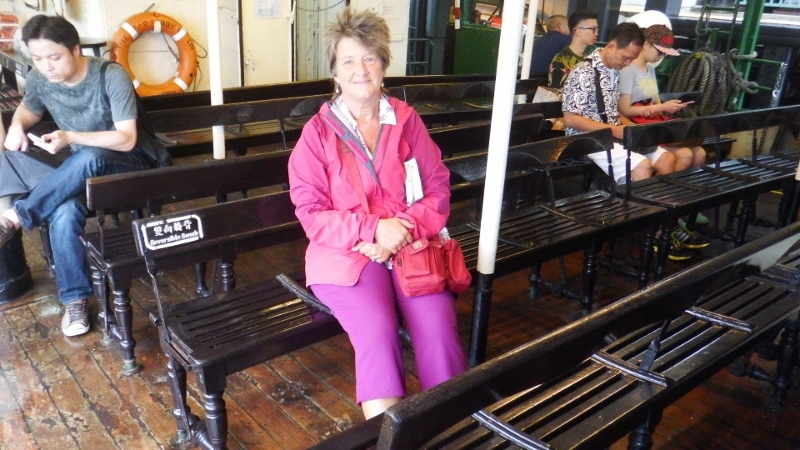 We inadvertently got on the lower deck and rode as second class passengers. It was still raining. 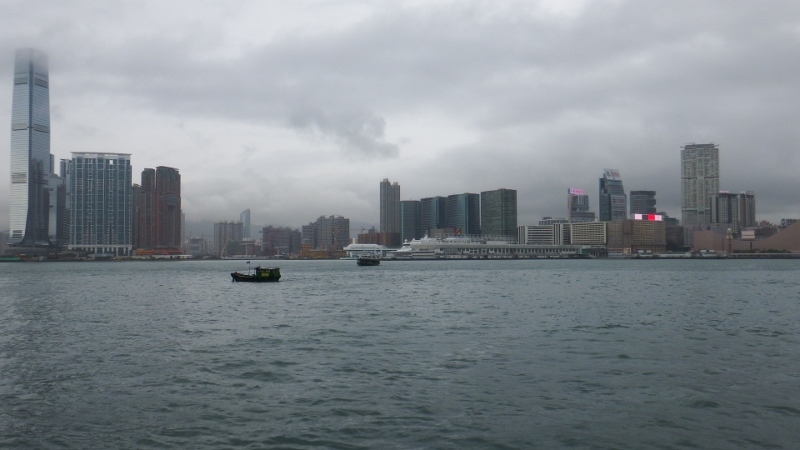 The rain had eased briefly and we started walking along the Tsim Sha Tsui promenade which gave spectacular views back across Victoria harbour to Hong Kong island but the storm clouds were building. We managed to get to shelter before this view…. ……became like this. Could have been Brighton on a bank holiday!! 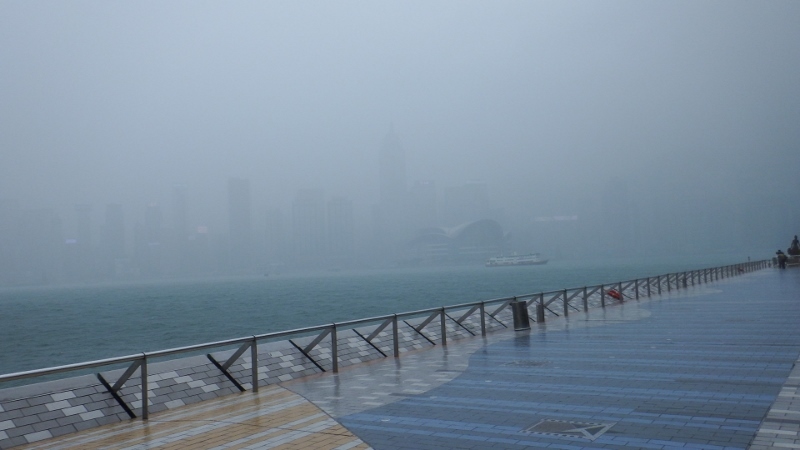 We sheltered for about 15 minutes then decided to abandon the walk and head for the Hong Kong Museum of History. 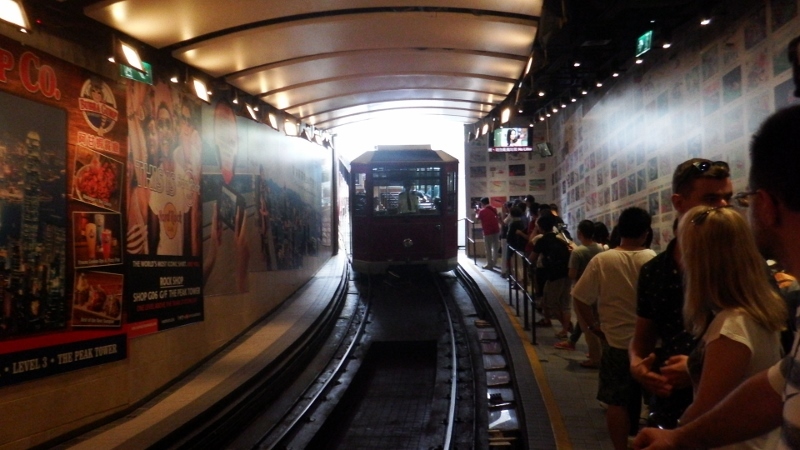 Fortunately Hong Kong is used to the rain and it’s possible to walk large swathes of the town either underground via the underground train system or over a series of covered walkways and we managed to get to the museum only a little damp. 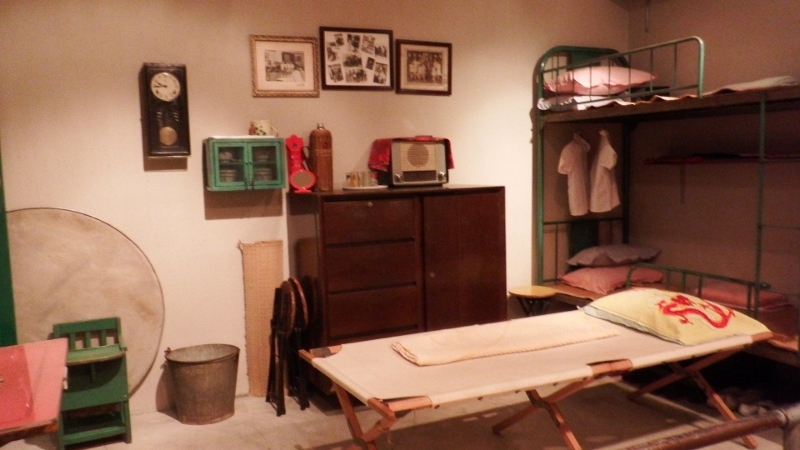 The museum takes you on a fascinating journey through Hong Kong’s past from prehistoric times to 1997. As luck would have it museums are free on Wednesdays – lucky us. 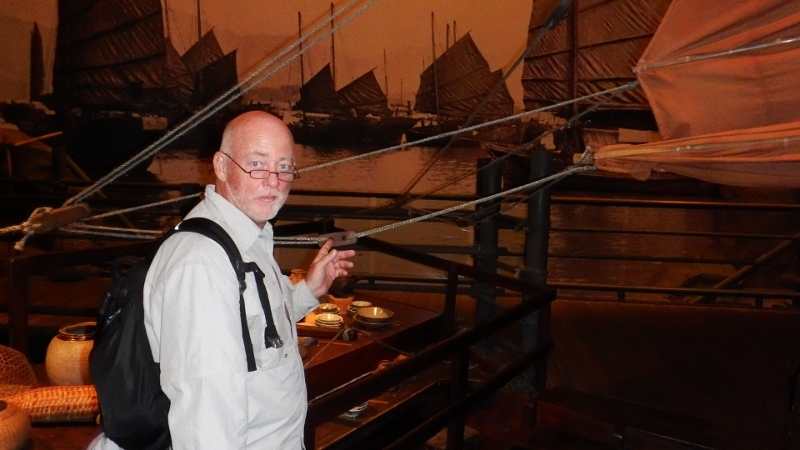 We spent several hours looking at the exhibits, it was very well done except for this life size model of a junk rig which, as Bill had to point out, didn’t have it’s mainsheet attached properly – what a geek! Also he noticed this model boat wasn’t rigged properly! A replica of a temporary home provided by the government after typhoon damage. There was a lot of information on typhoons in the area and that many homes were lost and replaced with these temporary homes. Didn’t look like a lot of room for 8 or so people. 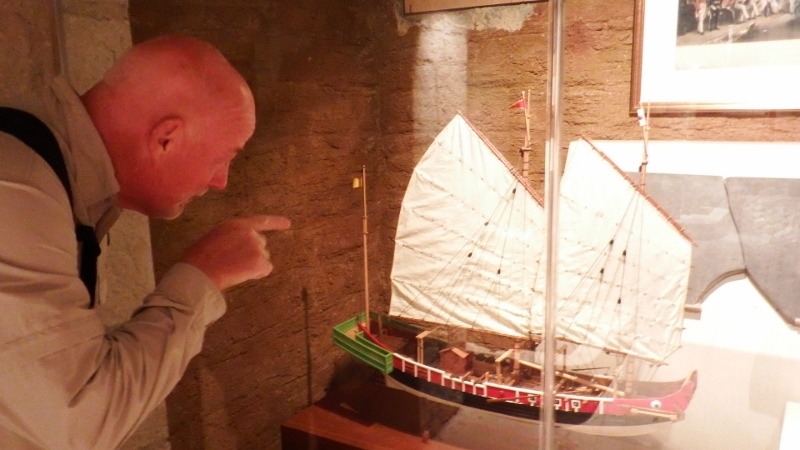 The display dedicated to the British handover of Hong Kong to the Chinese government in 1997 was very moving with a short film showing old film clips of the day with Chris Pattern making his moving speech and then joining Prince Charles on Britannia with his family and sailing out of the harbour. It looked like a very emotional time for them all. 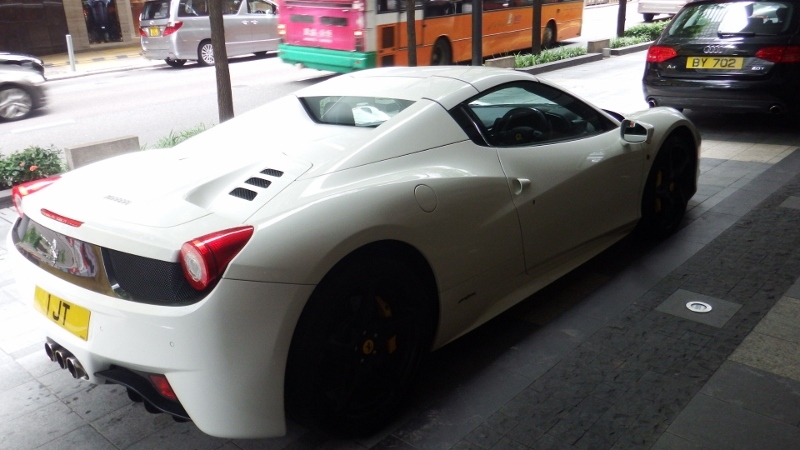 We came out of the museum to find it STILL raining and decided to abandon the trip to Tai Sin temple and go straight to the Peninsula hotel. Most of this journey was completed underground and when we emerged next to the hotel it had stopped raining. The Peninsular is very grand and we were worried we wouldn’t get in and had taken some slightly smarter clothes to change into but there were people looking more bedraggled then us so stayed as we were. 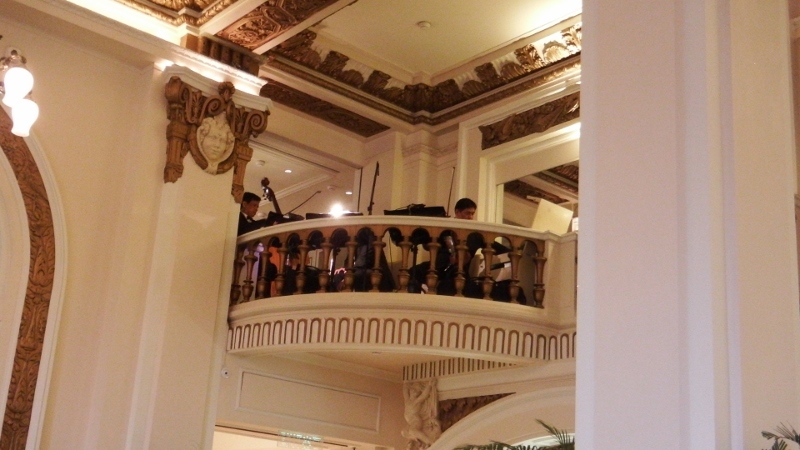 There was a gallery for the musicians to sit in as they played nice ‘soft’ music. 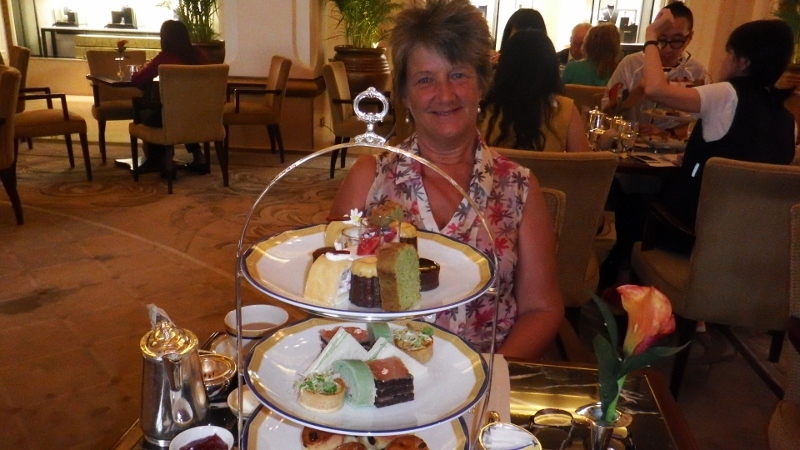 We chose Peninsular afternoon tea with a selection of sandwiches and cakes. The three tier cake stand arrived with two of everything and four warm and freshly baked scones on the bottom tier with jam and clotted cream. We took it in turns to decide which ones we ate, some of the cakes were very rich; we didn’t leave any for Mr Manners. We really enjoyed it and everything was delicious but decided it didn’t beat our tea party in Raffles last year for my birthday. By the time we left it was 4pm and the sun was even trying to come out a little bit. 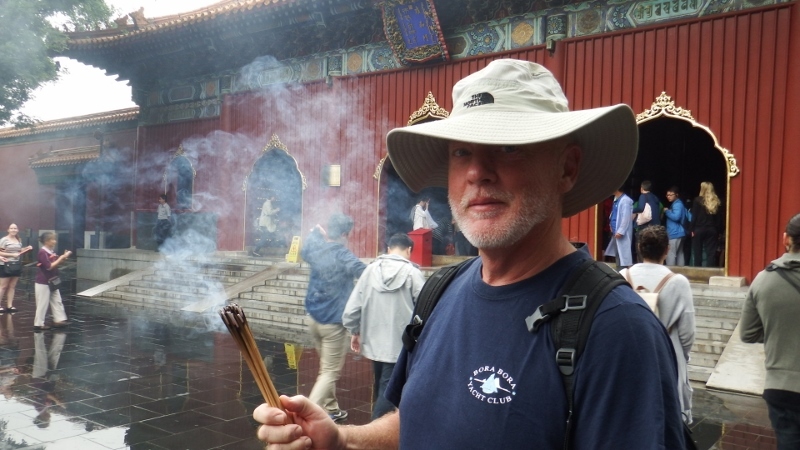 It was too late to go to the temple but Bill said it would be good to have a look around the Jade market and see if there were some ear rings I might like. I found some really pretty blue mauve ones which he kindly bought me as a memory of our anniversary spent in Hong Kong as well as a nice pink and pearl necklace and a beautiful scarf. I’m very lucky. We wandered through the Temple street market as they were setting up for the evening. Back at the water front the clouds had lifted and it was now possible to see the tops of the sky scrappers and Victoria peak behind them. It was an amazing sight. As it got darker each building had a set of LED lights creating it’s own little light show and altogether forming a spectacular display. 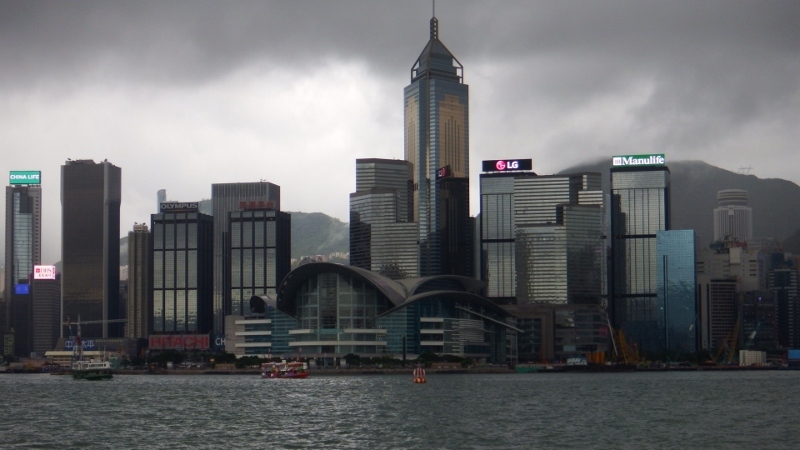 The tall building left of centre with the diamond patterns is the Bank of China headquarters, the smaller building to the right with the red lights is the HSBC building and the circle is a big wheel. We waited until 8pm for the laser show which was also really clever. Returning on the Star ferry we sat on the upper deck on the way back. Once back in the city we made our way back up the escalator system to the Italian restaurant we found in SoHo on the first night, the Sole Mio for an amazing dinner. What a wonderful day we had. 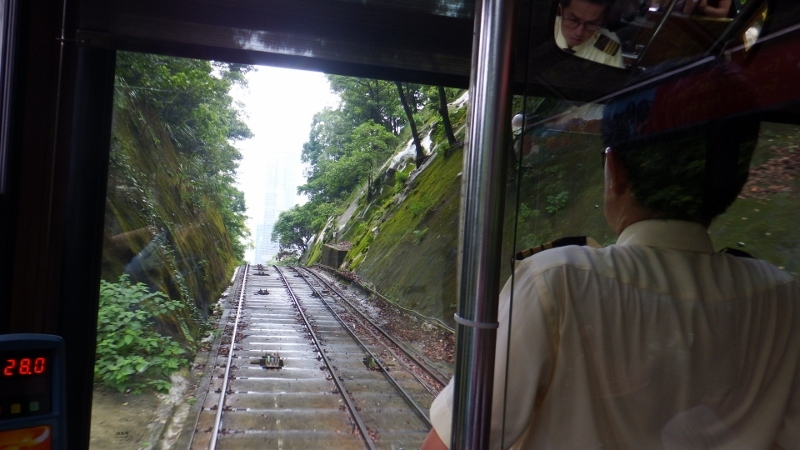 There was a bit of a shaky start this morning because the original plan had been to take the Peak tram to Victoria peak and walk round the circuit to see the view but when we got there the tram was closed for the day. We were offered a bus but chose not to go up. Hopefully we can do the tram on the 3rd. 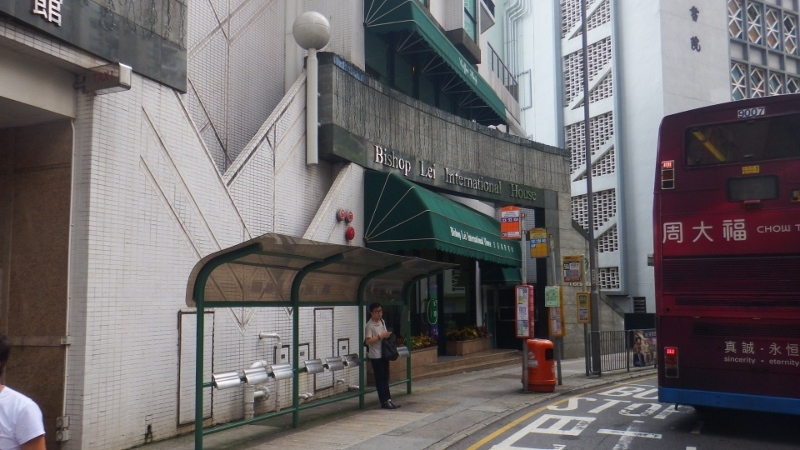 We stopped for coffee to look through the guide book and decided to take a tram out to the Sheung Wan area to do a walking tour. 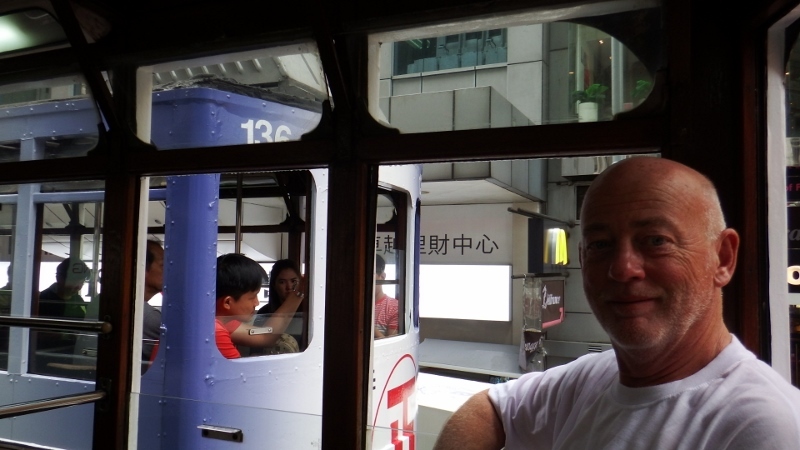 The Hong trams have been in operation since 1904 and represent the only all double decker wooden sided tram fleet in the world. 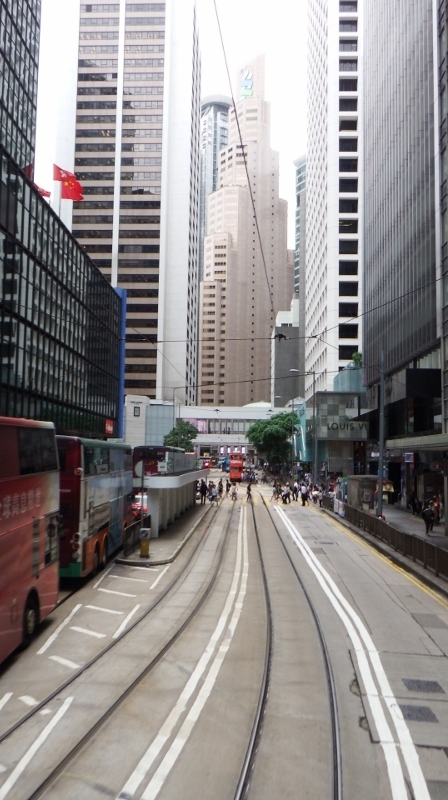 They operate on routes running east – west along the northern side of Hong Kong island. 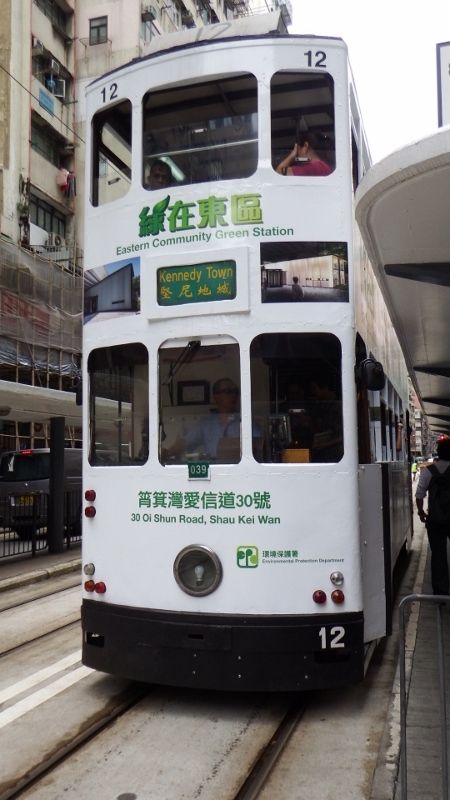 They cost HK$2.40 about 20p a journey and are very popular. It looks very strange to see these lovely old trams running in between the glass fronted buildings and alongside the modern buses. As they have their on tracks often they are moving faster than the modern buses although they still have to wait for traffic lights. We sat on the top deck and enjoyed our ride. My Dad would have loved it. I found it difficult not to imagine Dad and his friend Jimmy sitting in front of us. Bill watching the tram coming the other way. 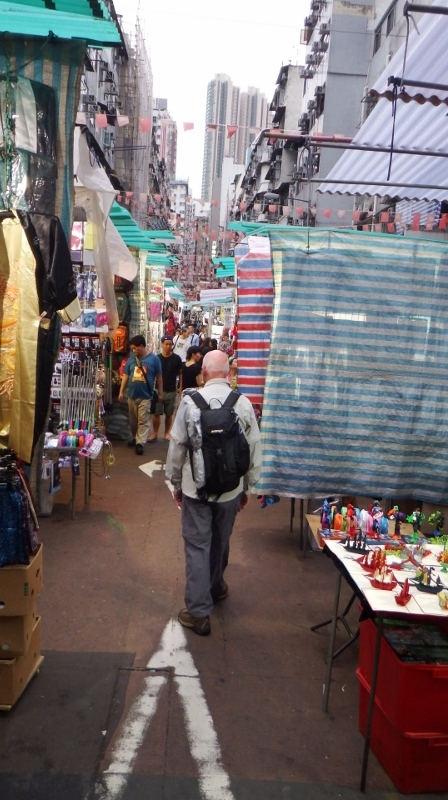 Our walking tour led us through a journey into Hong Kong’s past as we passed dried seafood shops and herbal medicine wholesalers. They had some fairly dodgy looking things in their windows. 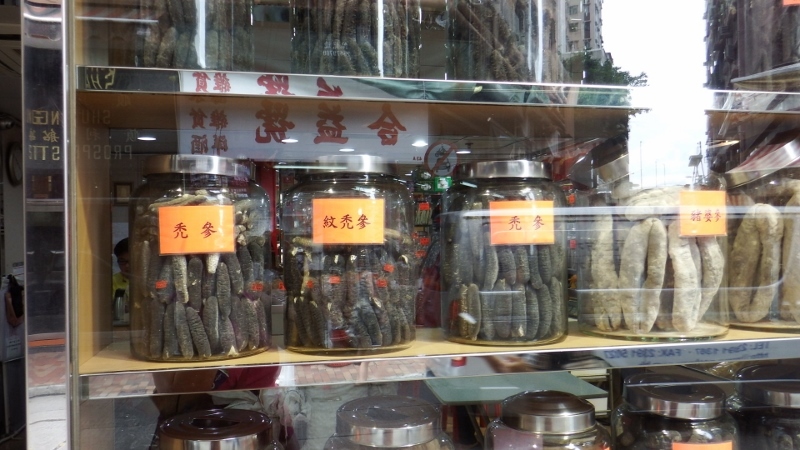 Despite what these look like we think these were dried sea cucumbers. 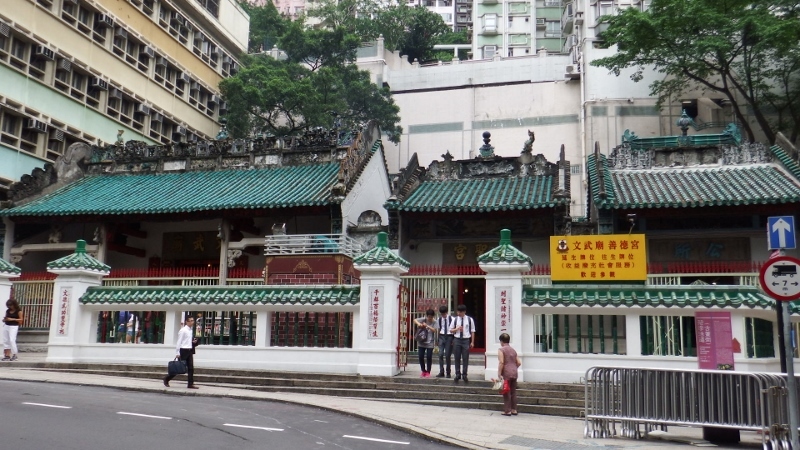 We visited several old temples but this is the Man Mo temple, it was the centre of civil life in the 19th century. 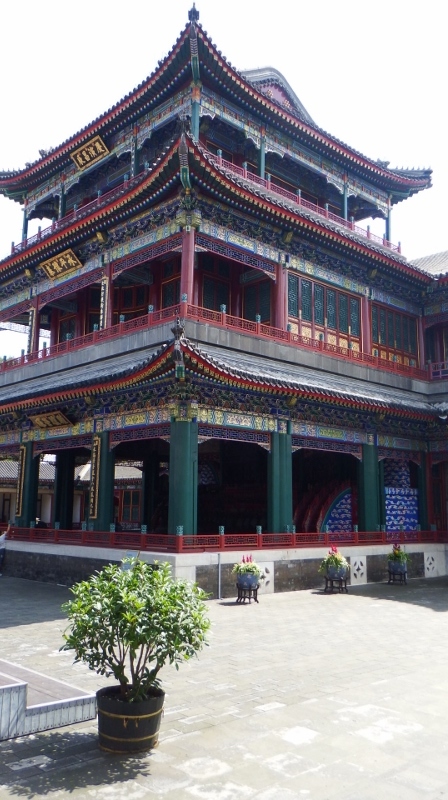 It was built between 1847 and 1862 by Chinese merchants and dedicated to the gods of literature ‘man’ and of war ‘mo’. Back in the early colonial days the government only accepted oaths taken here rather than in a court of law. 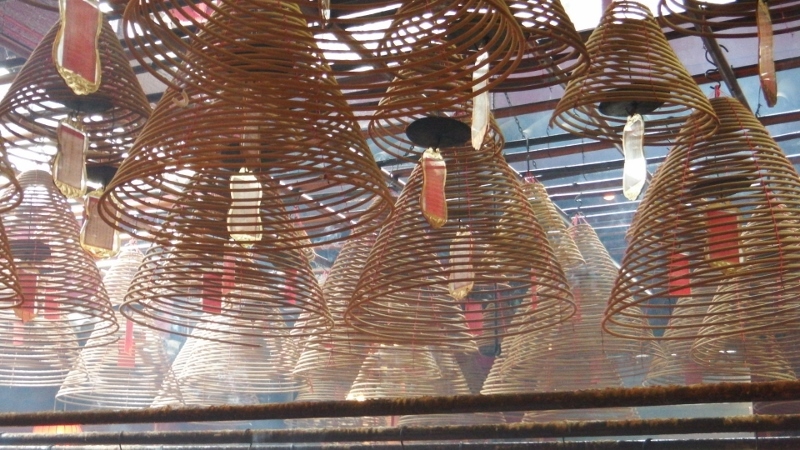 Smoke curls from giant spirals of incense hanging from the ceiling that contain paper offerings to the dead. 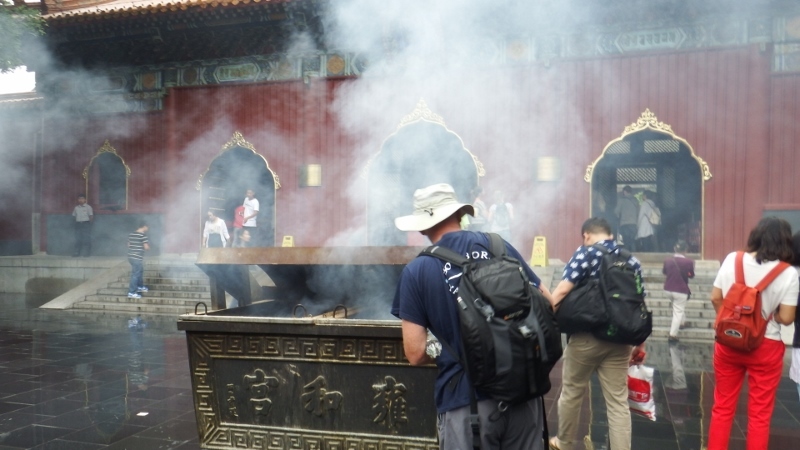 The atmosphere was very thick with incense inside and we couldn’t stay in there long. 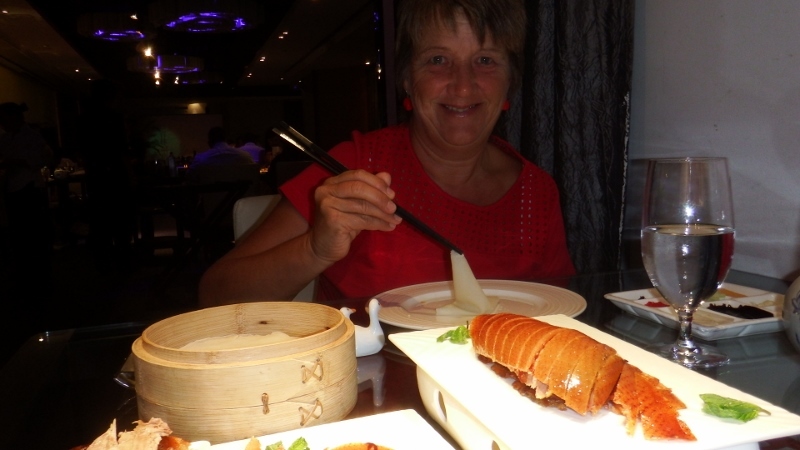 The walk took about an hour then we got back on the MTR (underground) and took the train to Wan Chai area and had lunch in an English pub called the Queen Victoria in the red light district although all the girlie bars were closed.. It seems like an odd choice but we both choose PORK sausage with mash. We just don’t get pork sausages in Malaysia. It was delicious. After lunch we wandered around the street markets which was really interesting. 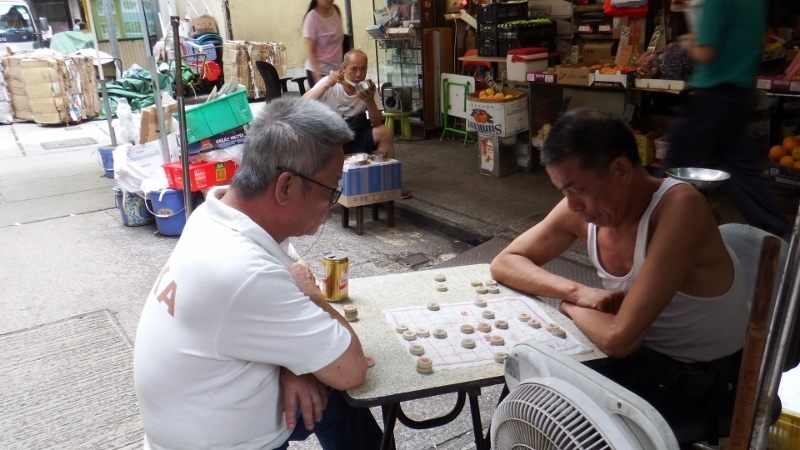 These two men were playing some sort of board game which looks like a cross between chess and draughts. There was a lot of shouting involved. The stalls were selling everything from plastic flowers to underwear. 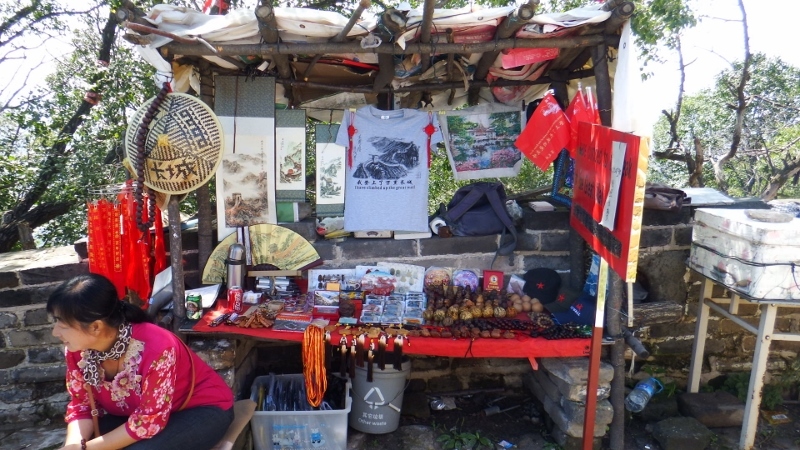 There were the usual tourist tat stalls but all very friendly. 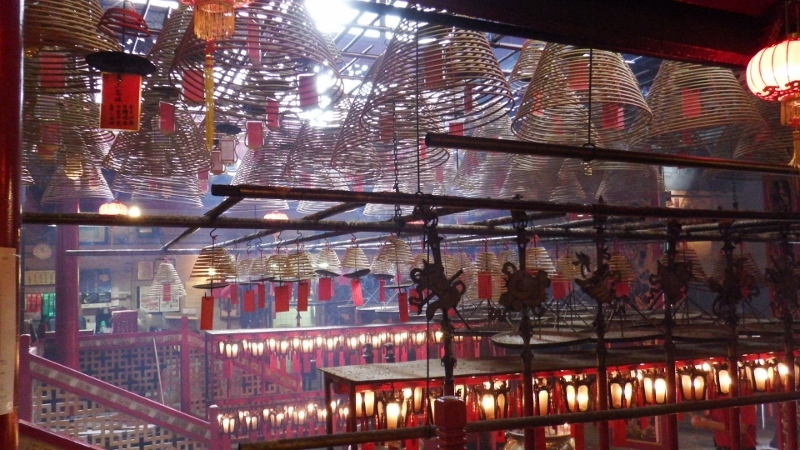 Bill looked up over the top of the stalls and spotted these guys erecting bamboo scaffolding. He counted about 20 floors up and we couldn’t tell if they had harnesses on or not. Even so it looked pretty risky. 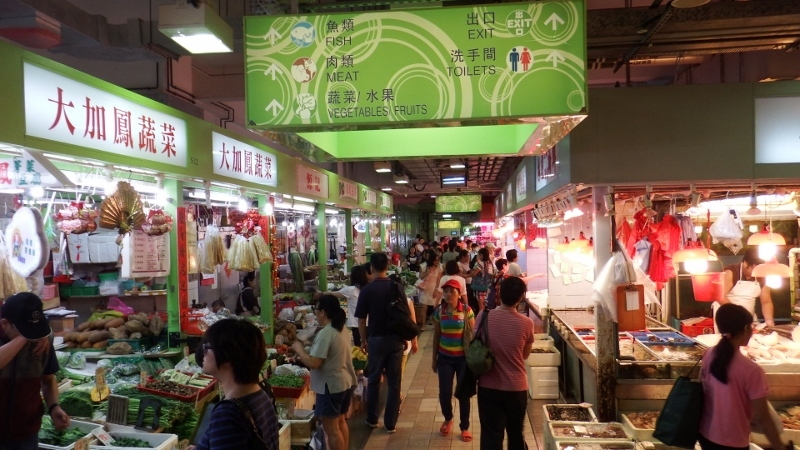 We found an indoor market selling the most wonderful looking fruit and vegetables. I wanted to take some home! 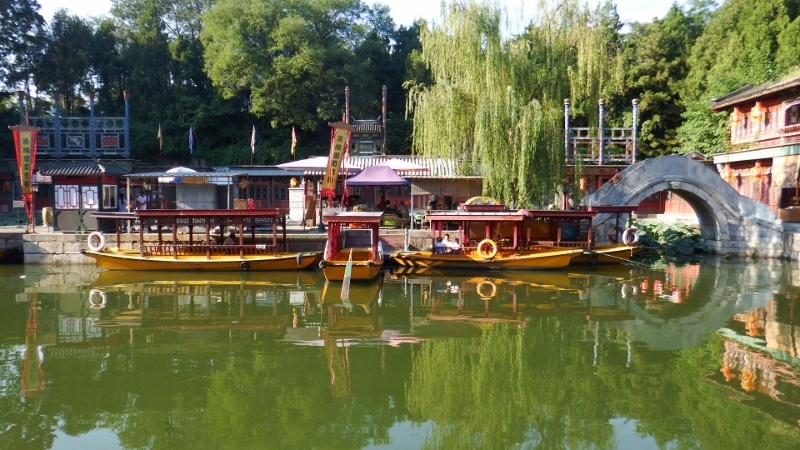 The stalls on the right had lots of tanks containing live fish. They looked fairly health but I felt a bit sorry for them lying there waiting to be killed. 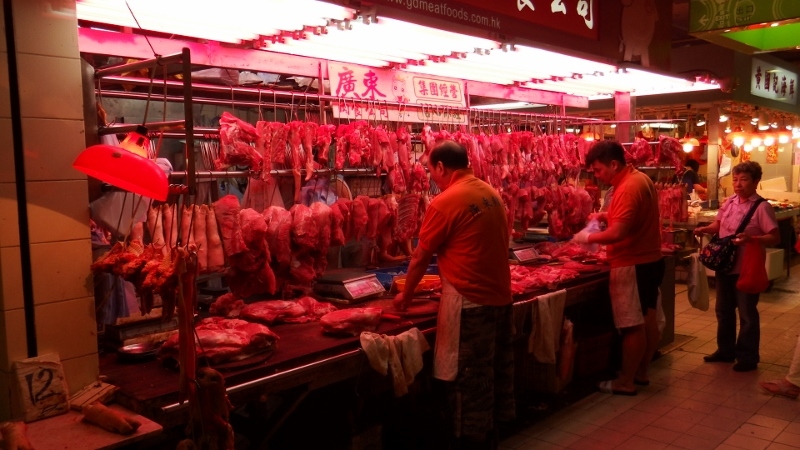 They were also selling meat in an open stall but it looked a bit more appetising than the Malaysian meat and wasn’t covered in flies. They had red lamps in the lights to make it look good. 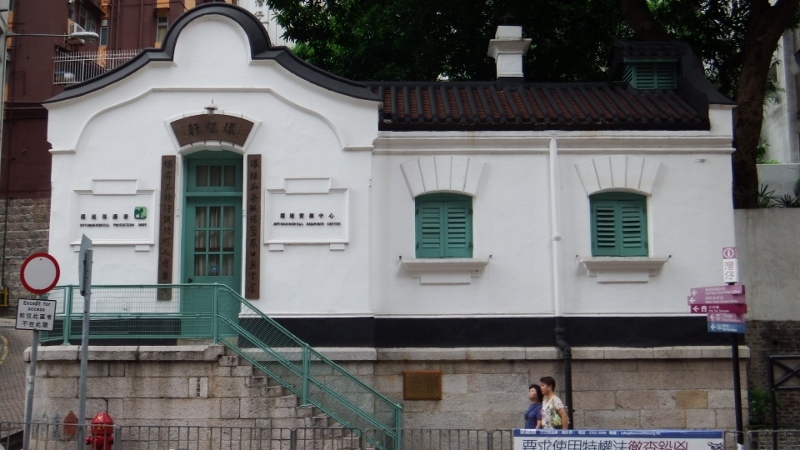 Finally we walked passed this dear little building sitting between all the high rises and next door to a very modern post office but this was the original Wan Chai post office and one of Hong Kong’s oldest. 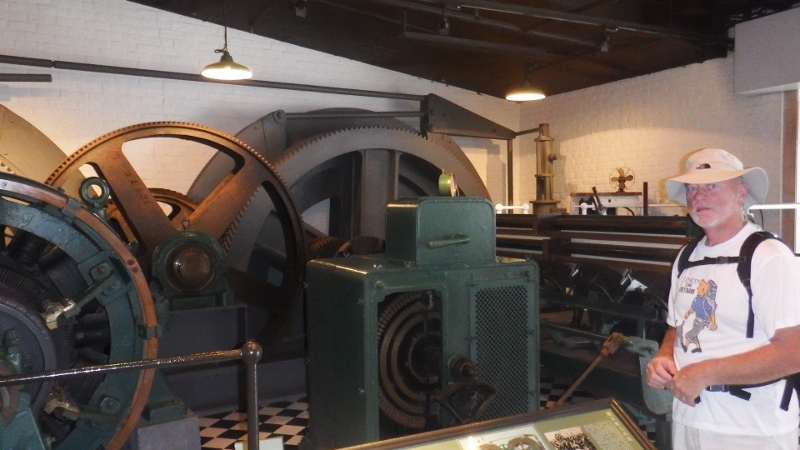 It has now been preserved and isn’t in use any more. 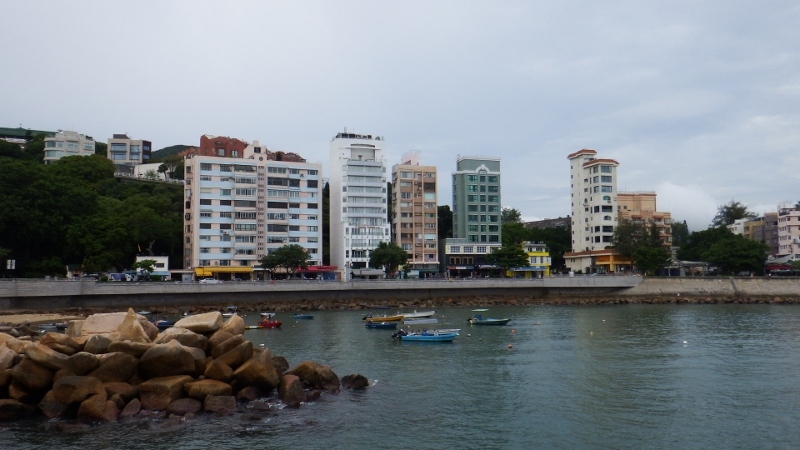 Back to the MRT and onto Exchange square to catch the No6 bus out to the seaside town of Stanley. It was a great journey for just $8.40 each about 70p. 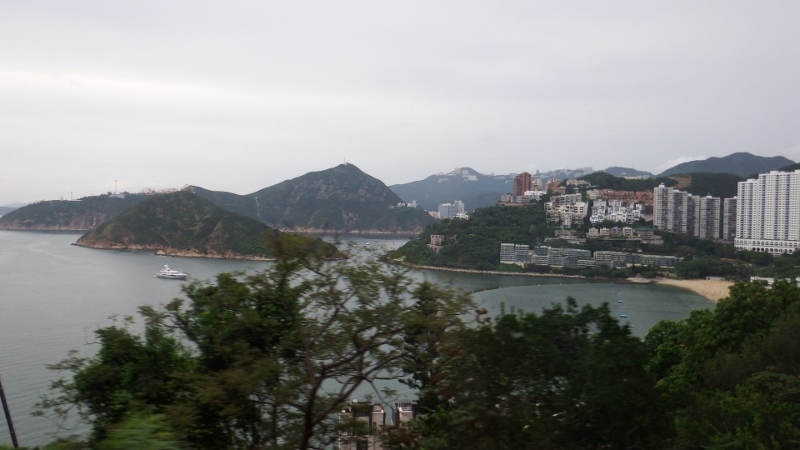 Once we’d left the city the road weaved through much smaller towns with lovely views across Repulse bay. It was a double decker and we sat upstairs to get a good view. There were quite a few upmarket apartment blocks that would have had wonderful views across the bay. The journey took about an hour and was a good ride. Stanley is reminiscent of an English seaside town complete with pier. We walked along the promenade to the market which had some lovely jewelery stalls but I managed to resist, I have so many already. 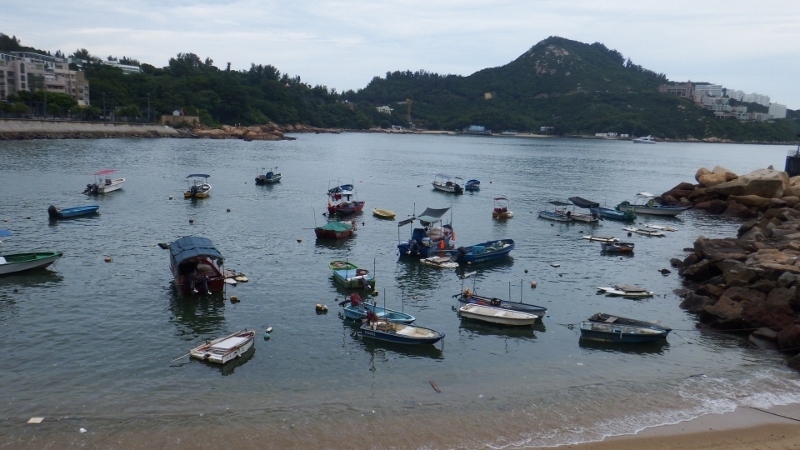 There were a little group of local boats moored in the bay which we felt drawn to. Shame the sun wasn’t out but at least it wasn’t raining. We stopped for some delicious waffles with ice cream before boarding the bus back to the city. I really didn’t expect to find such diversification in Hong Kong but it was interesting and we enjoyed our afternoon there.